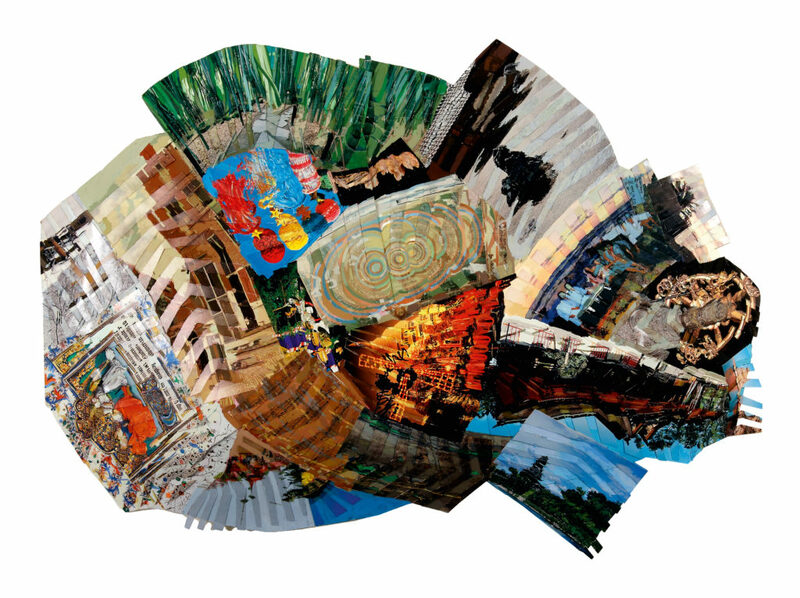 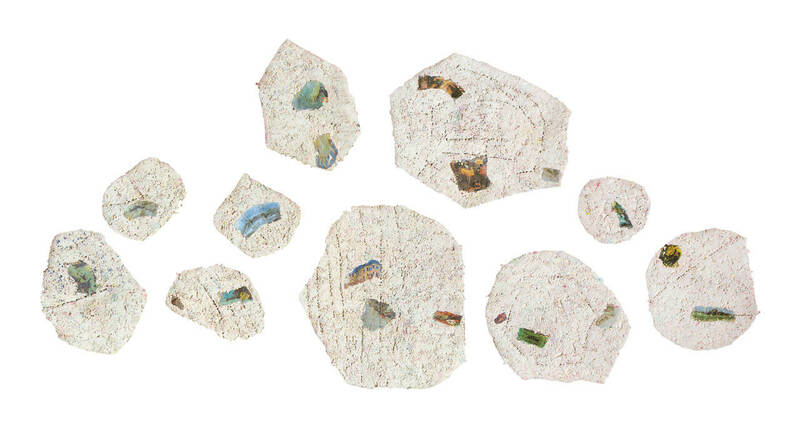 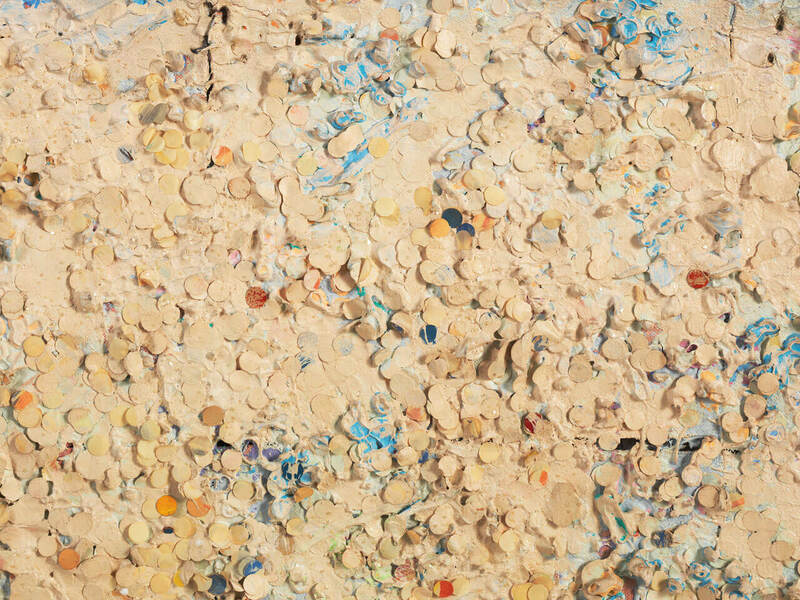 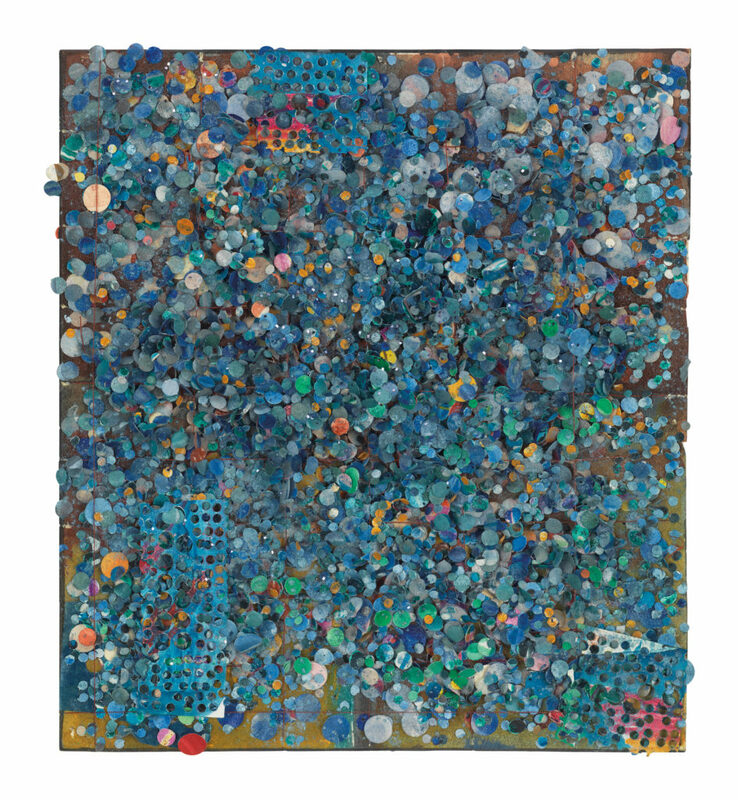 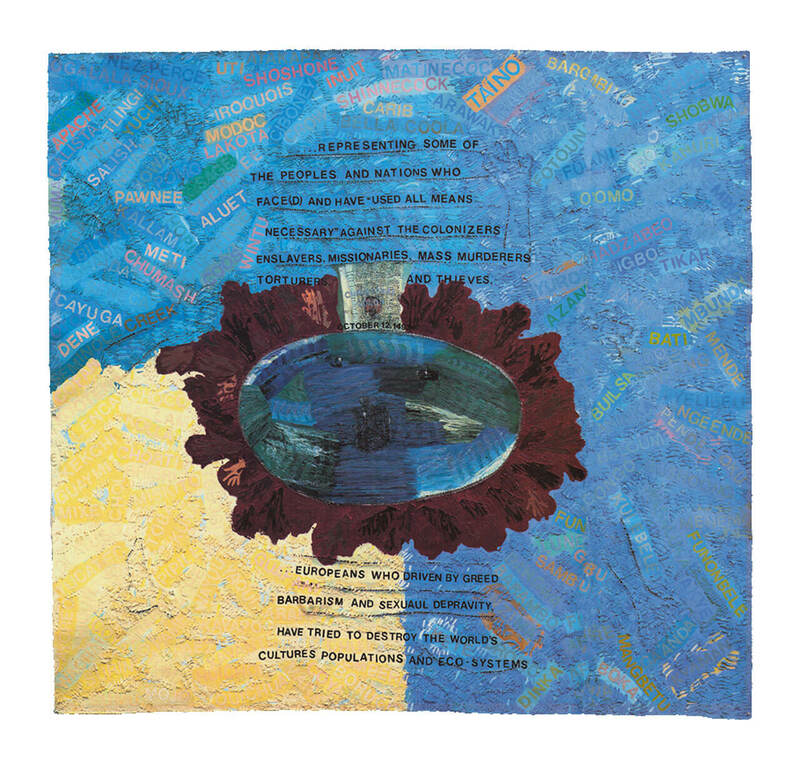 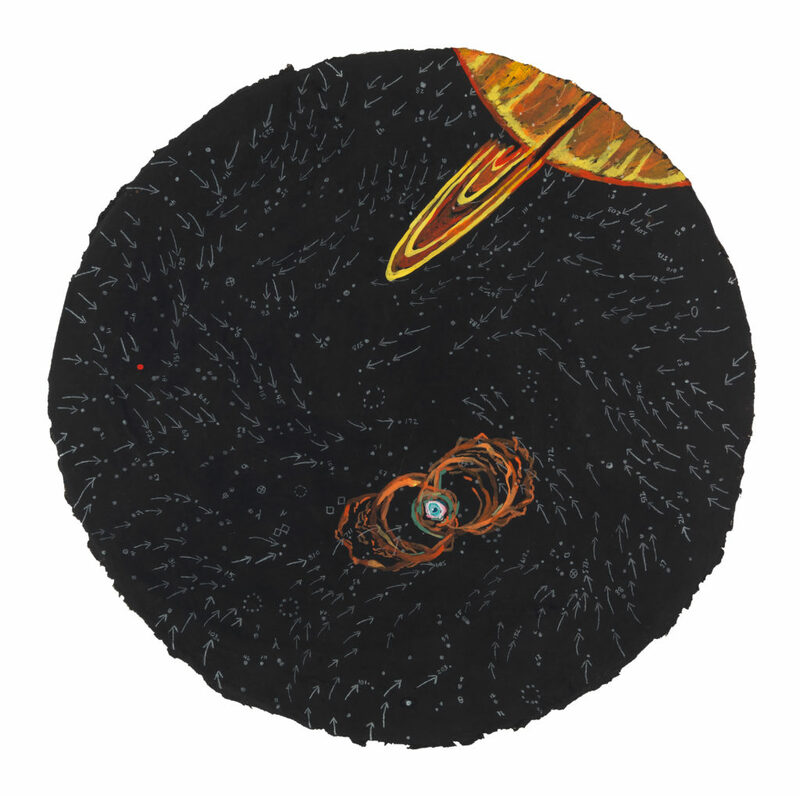 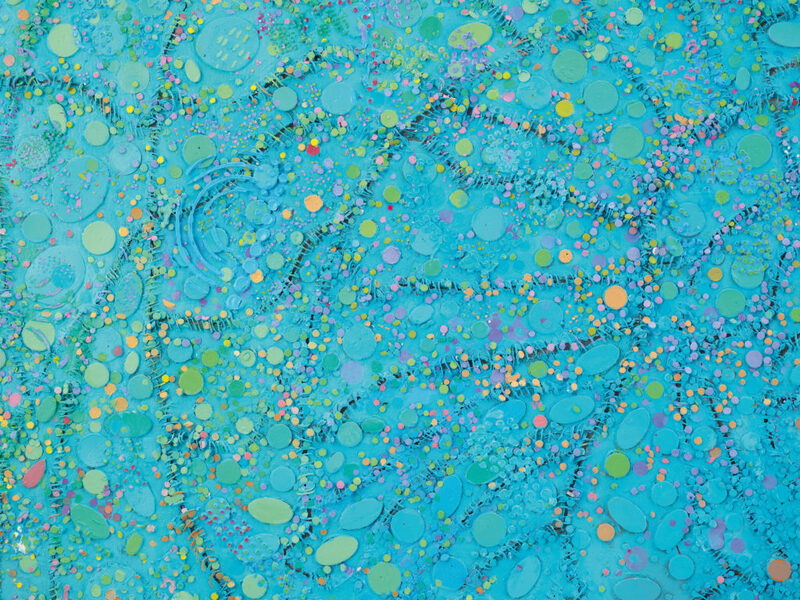 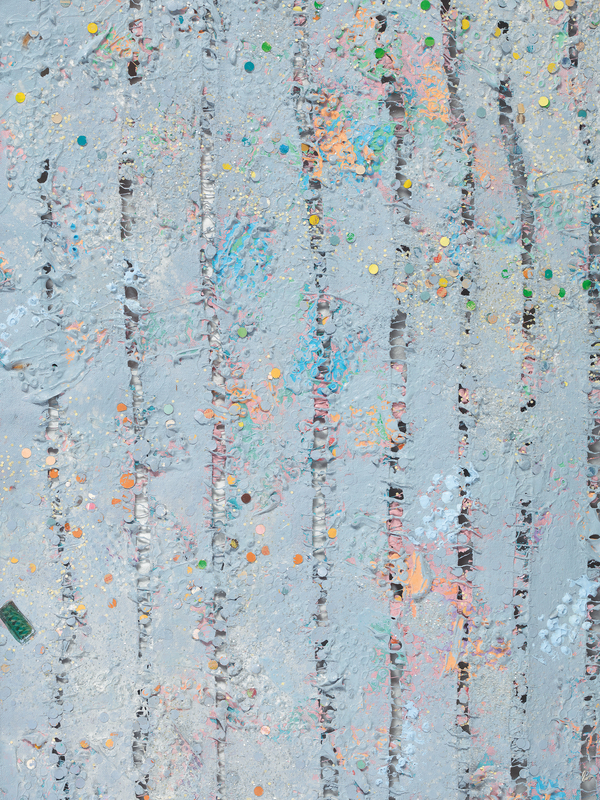 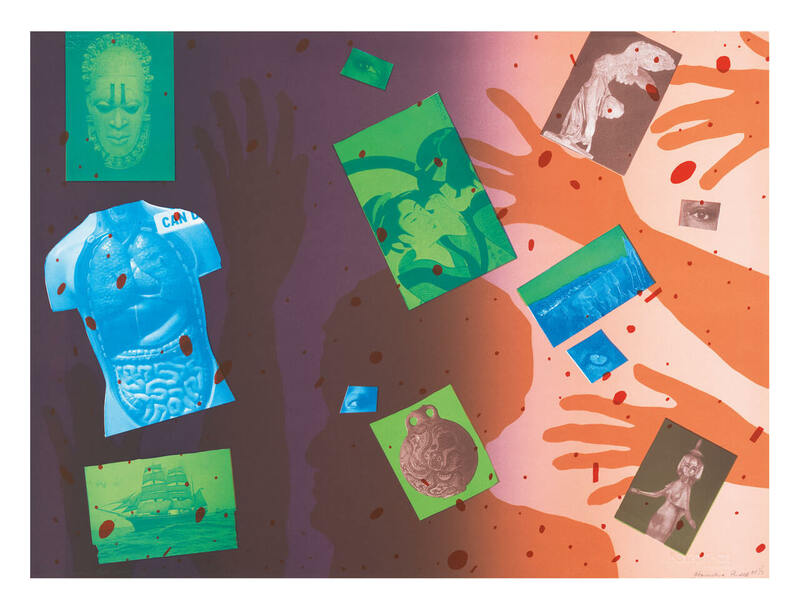 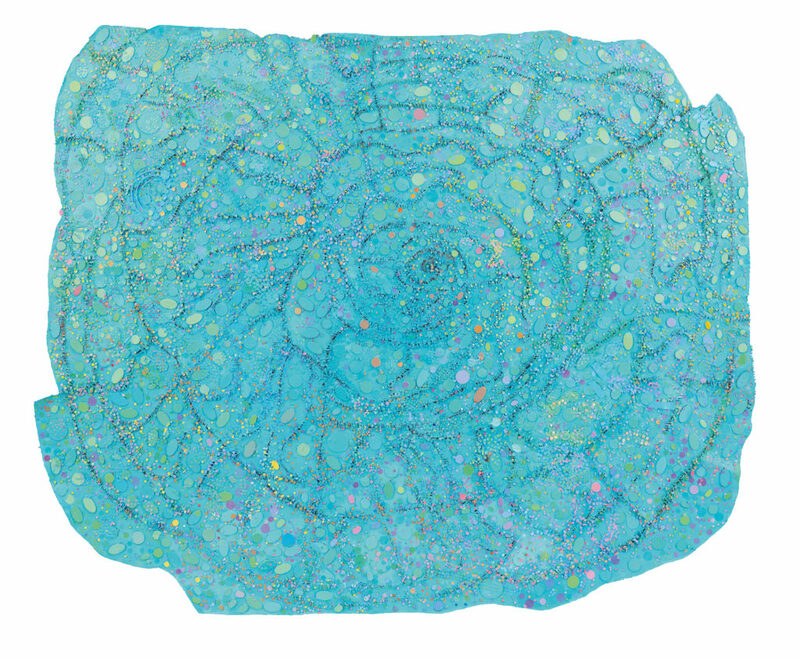 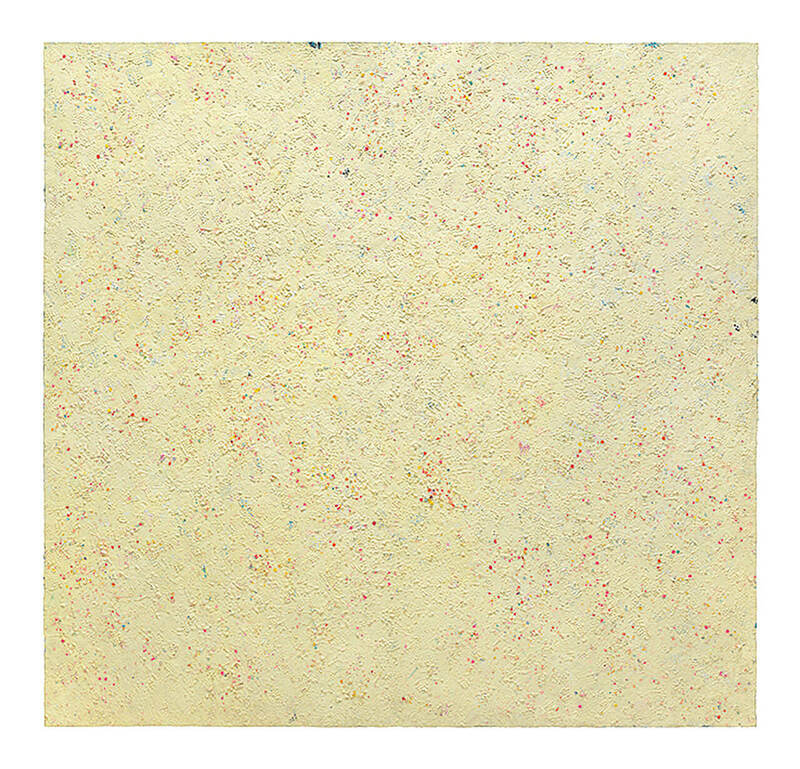 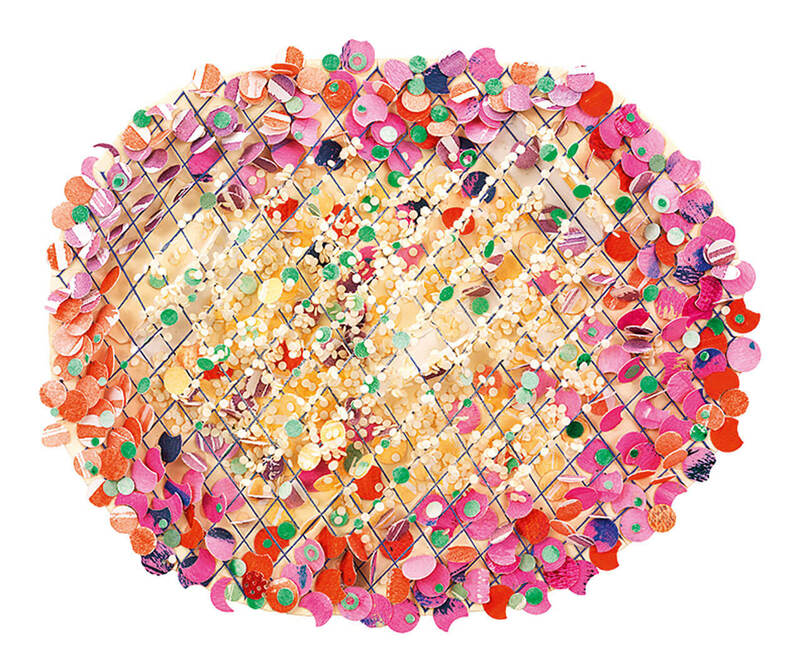 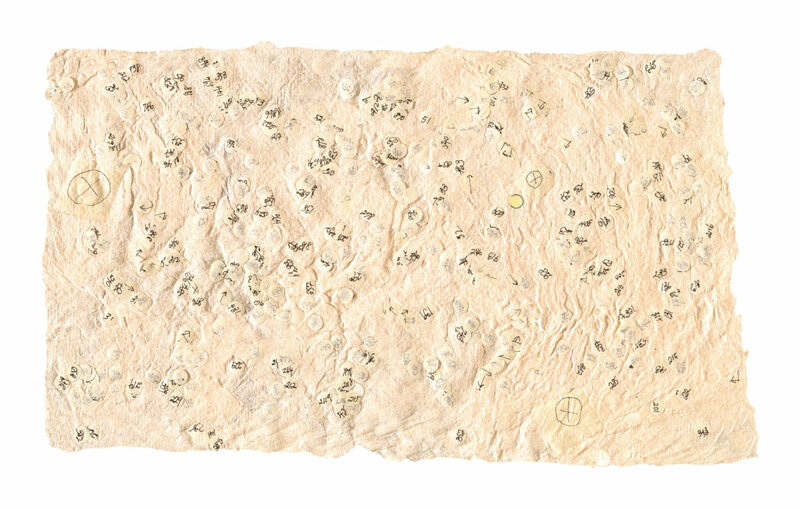 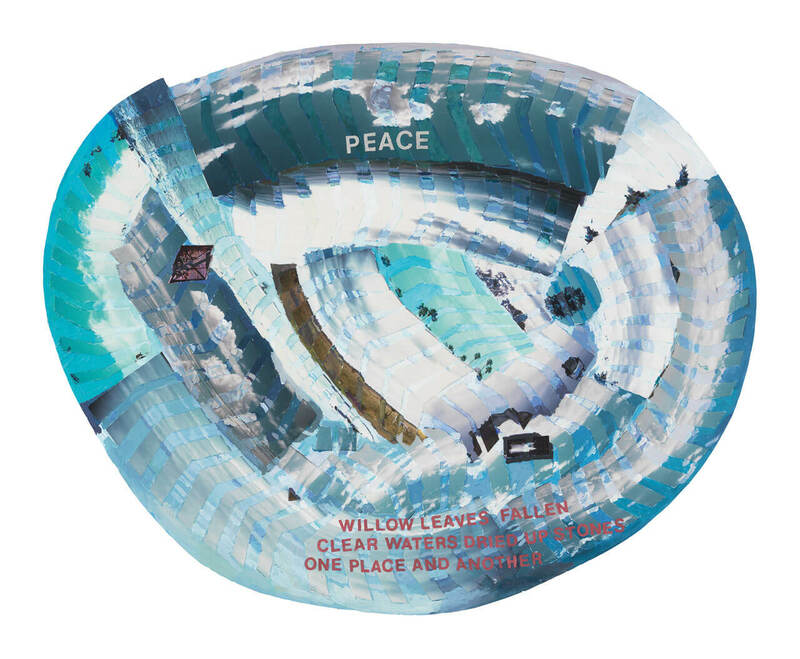 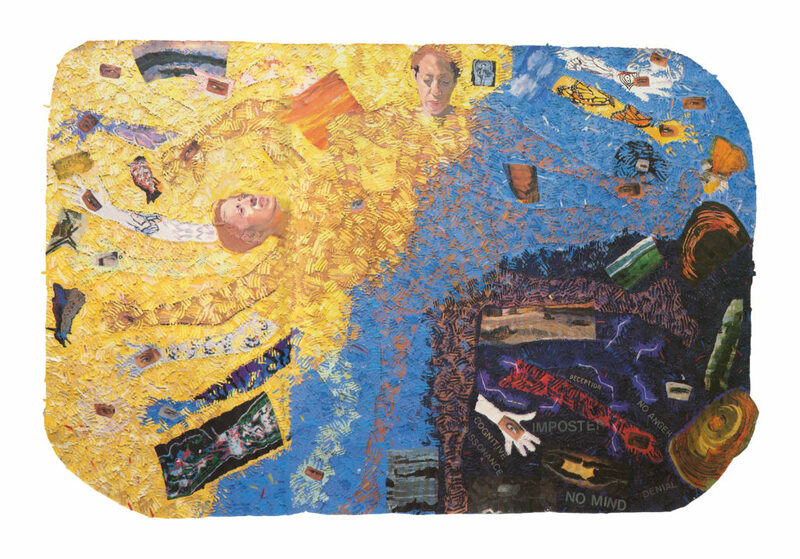 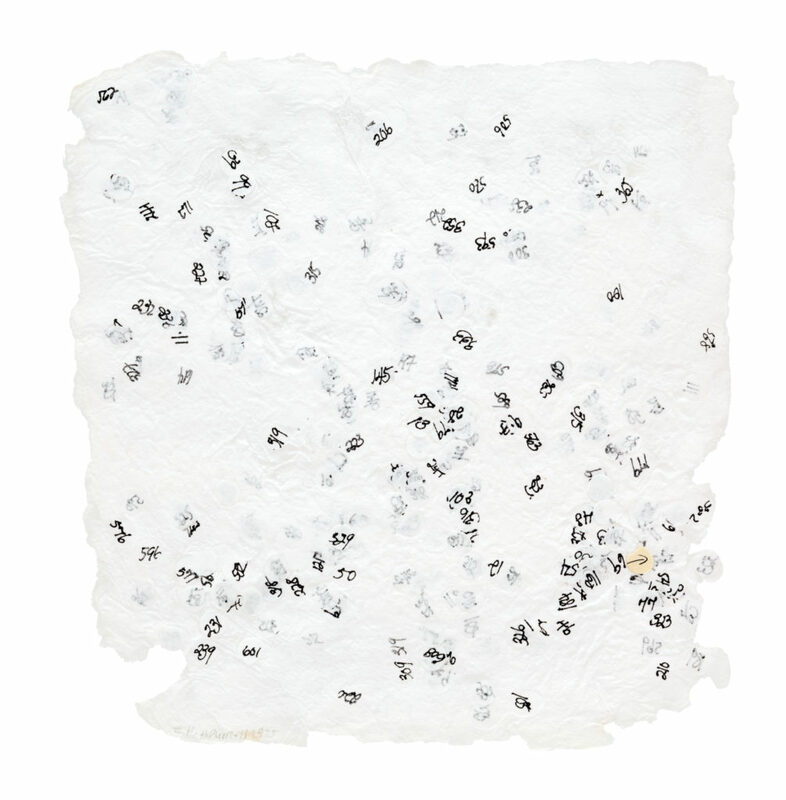 This section assembles the images that appear in the exhibition catalogue, Howardena Pindell: What Remains to be Seen. 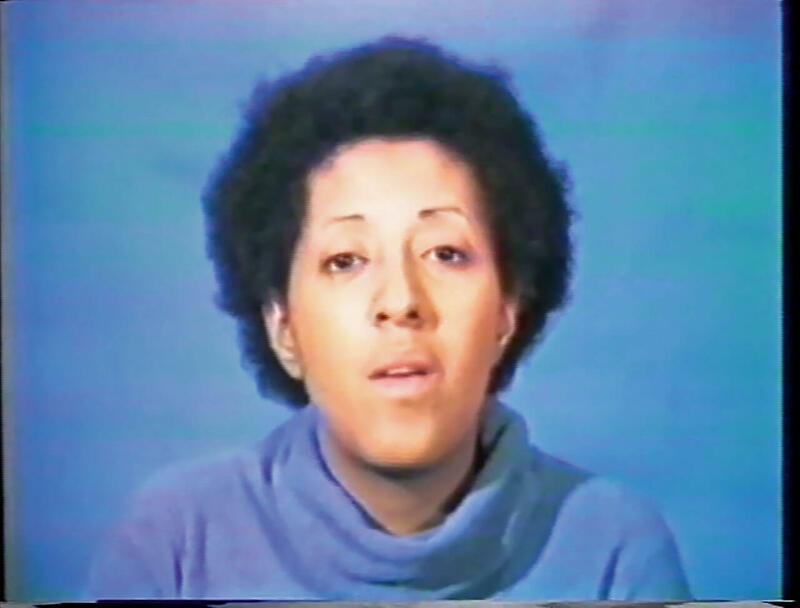 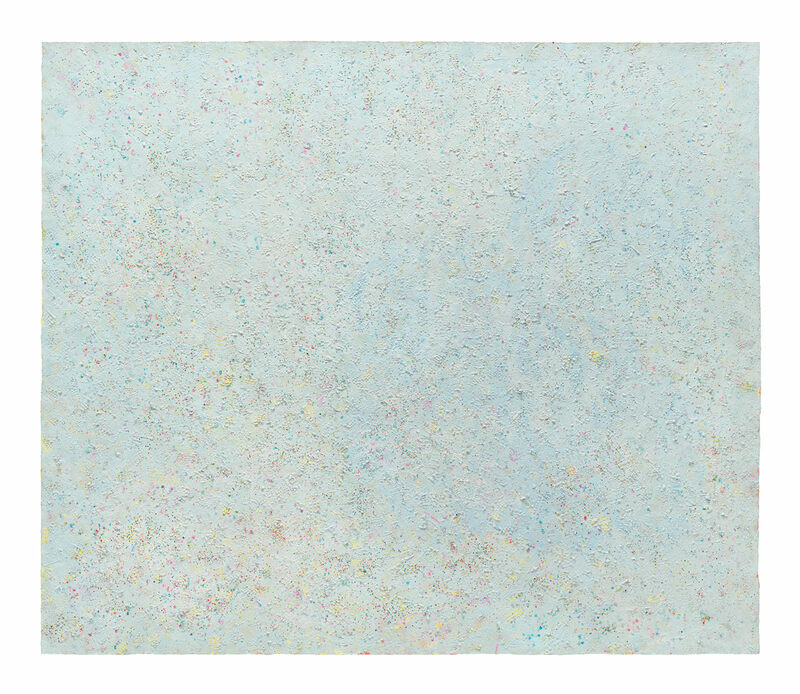 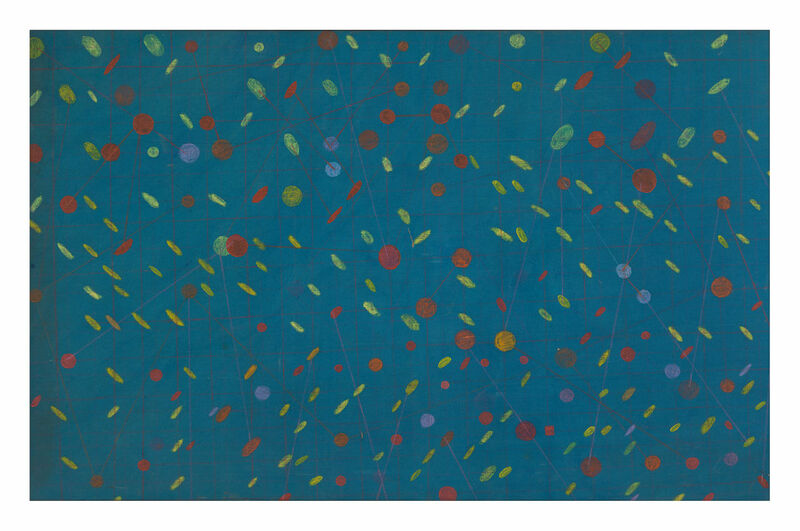 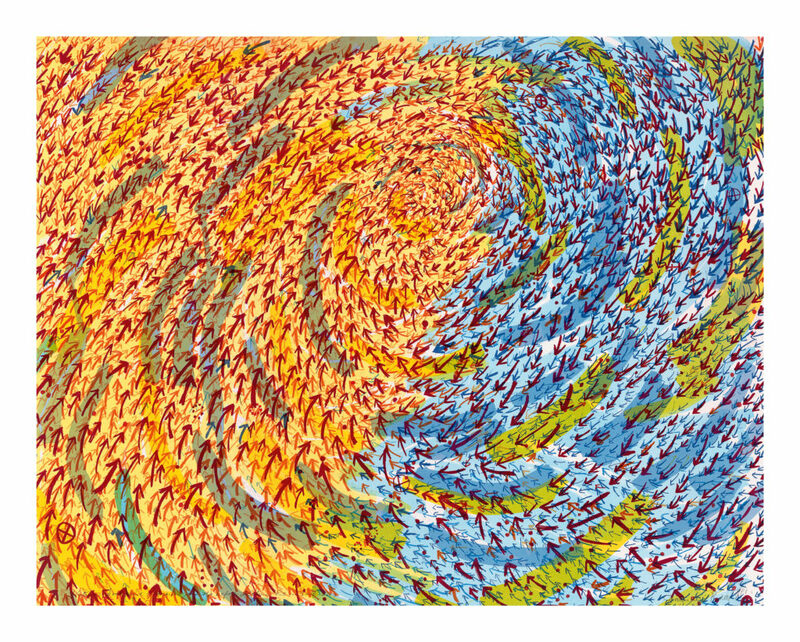 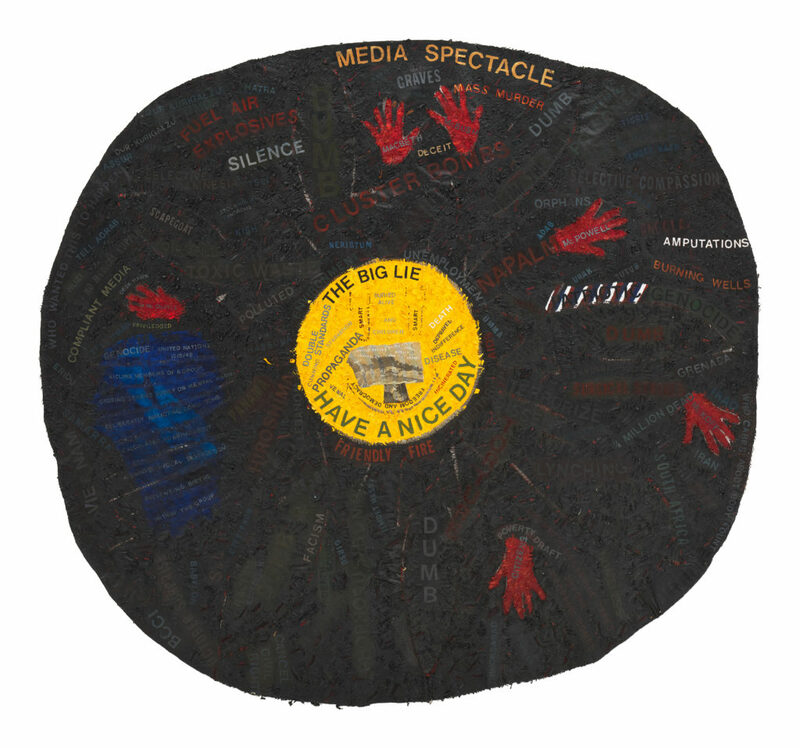 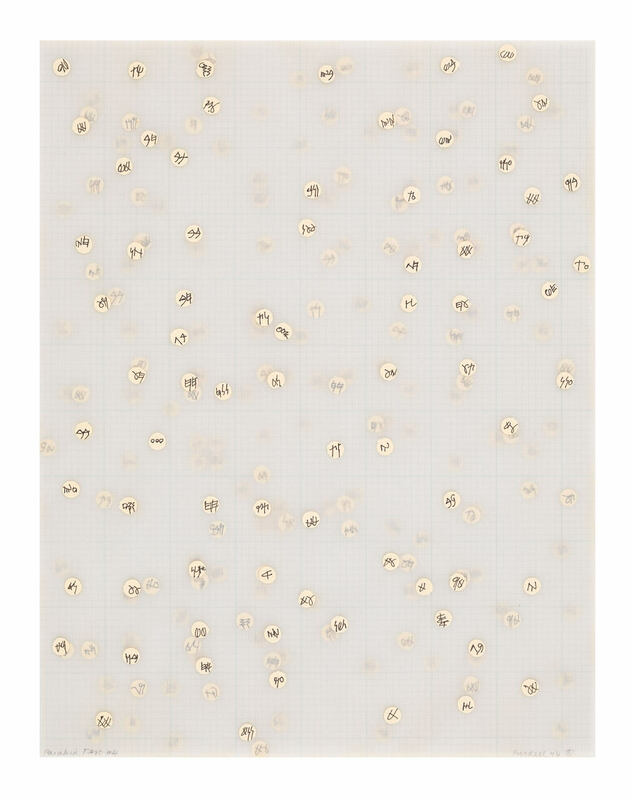 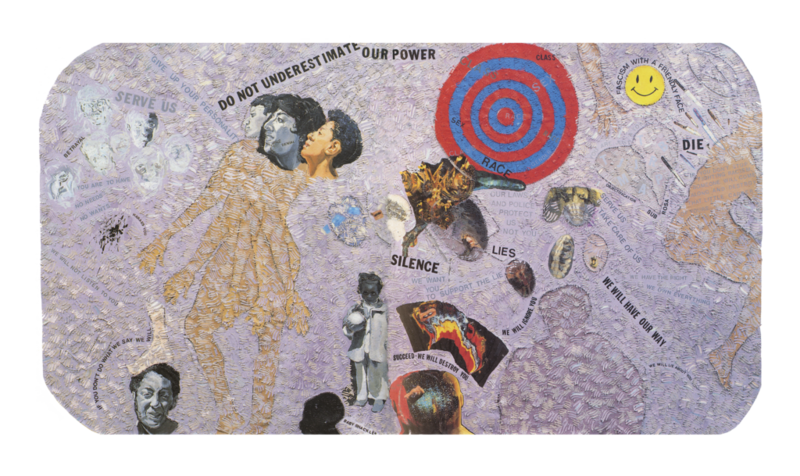 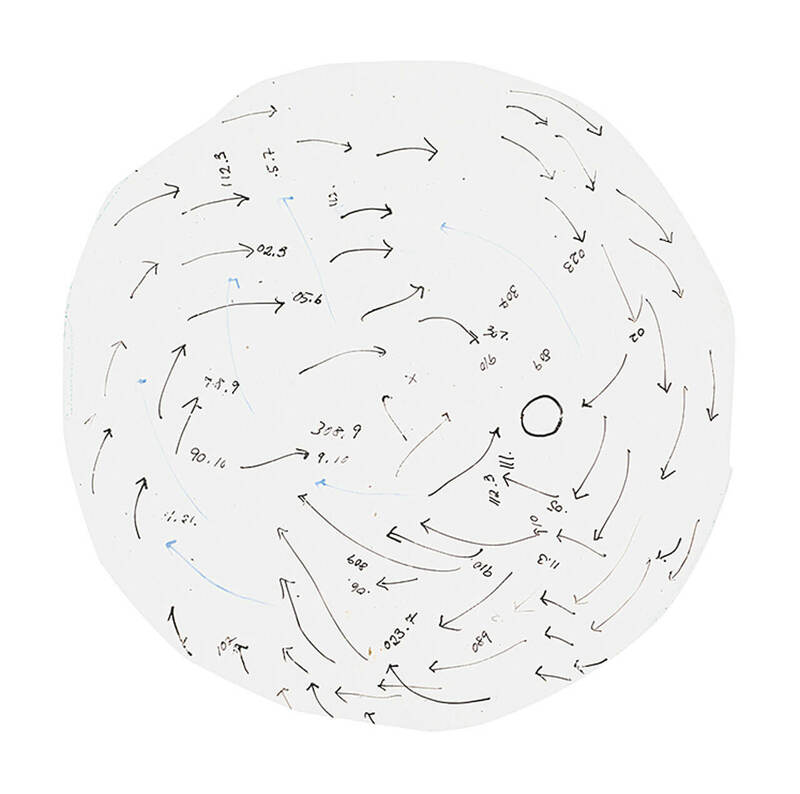 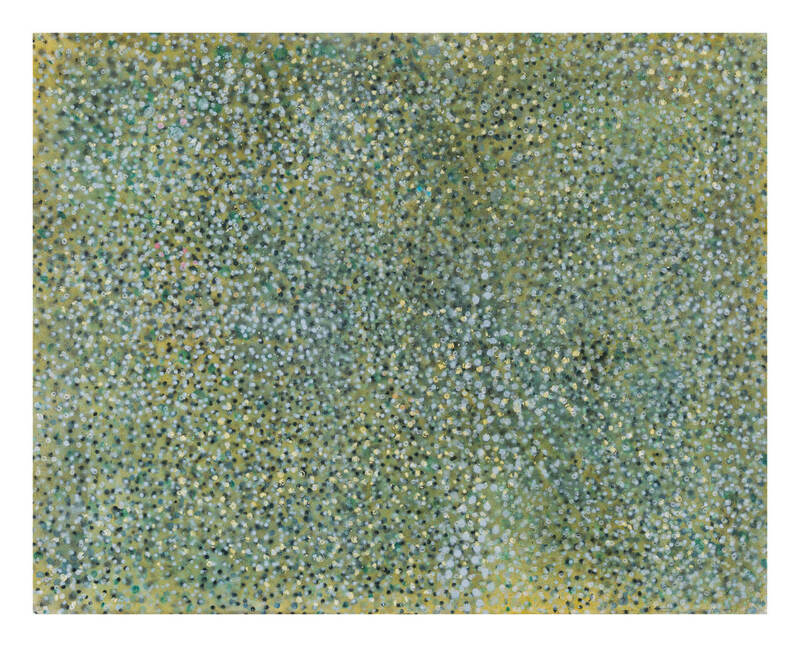 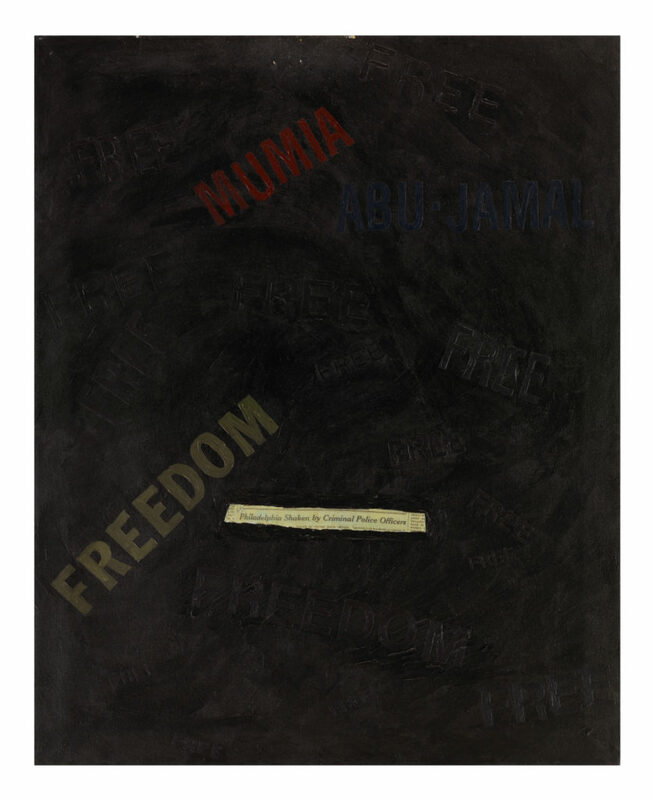 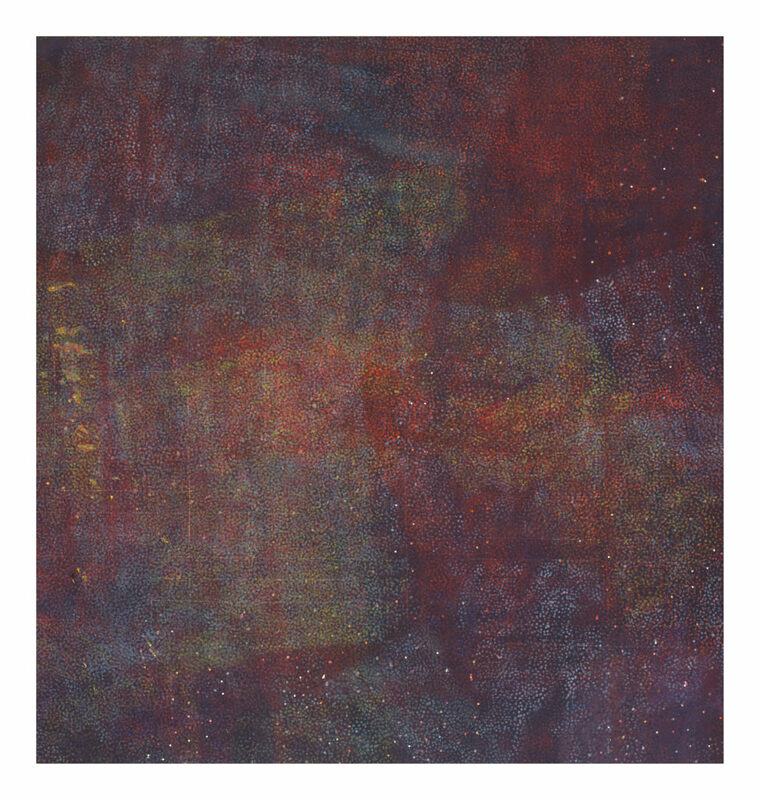 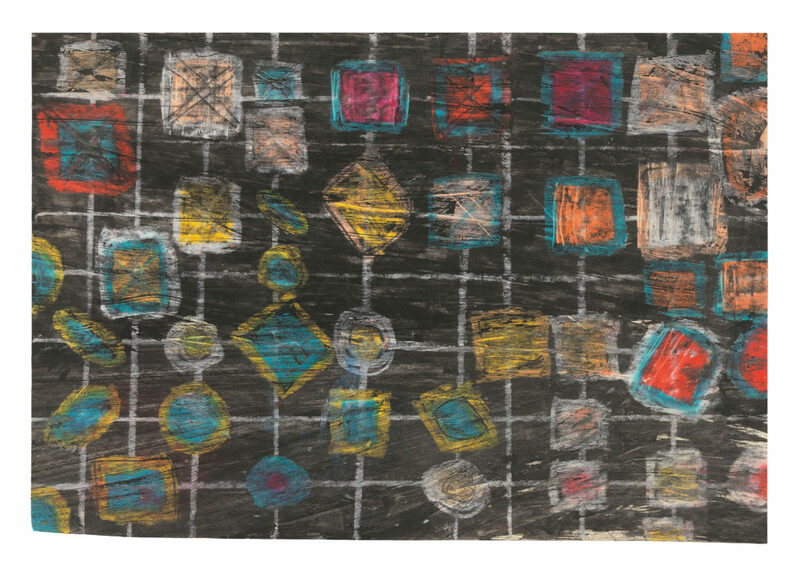 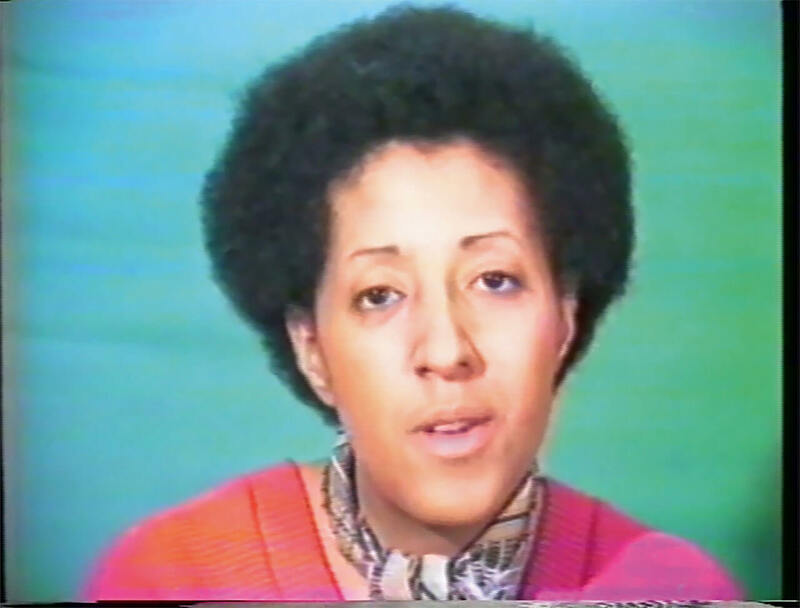 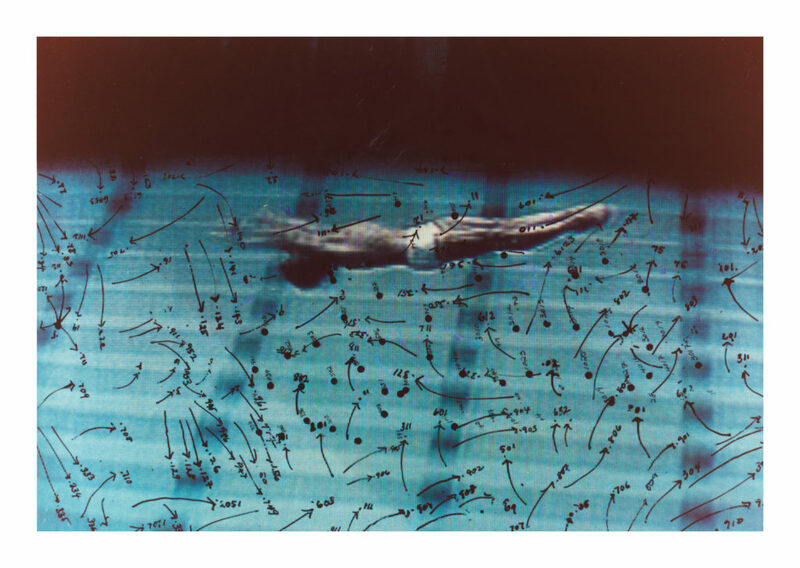 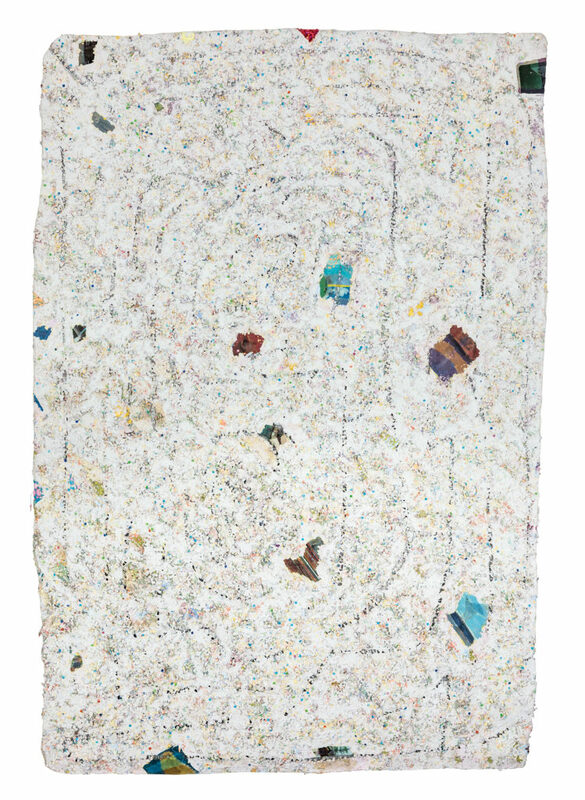 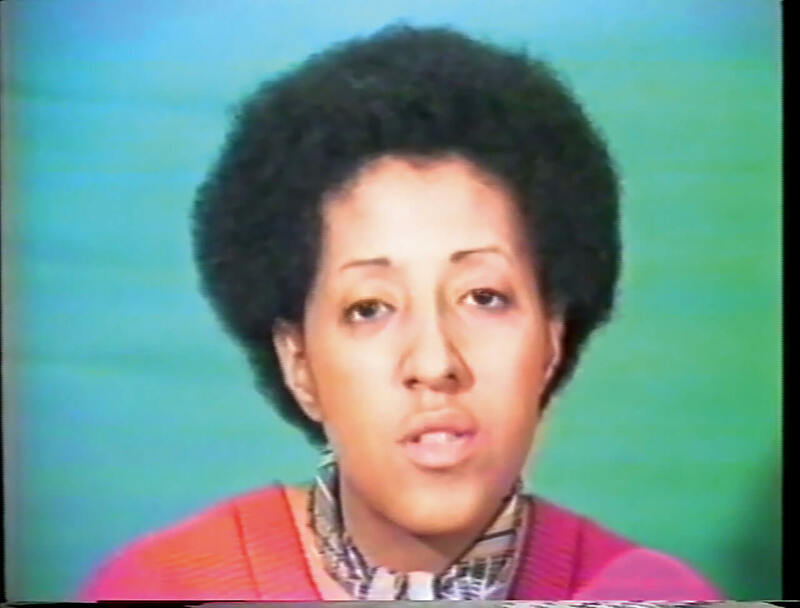 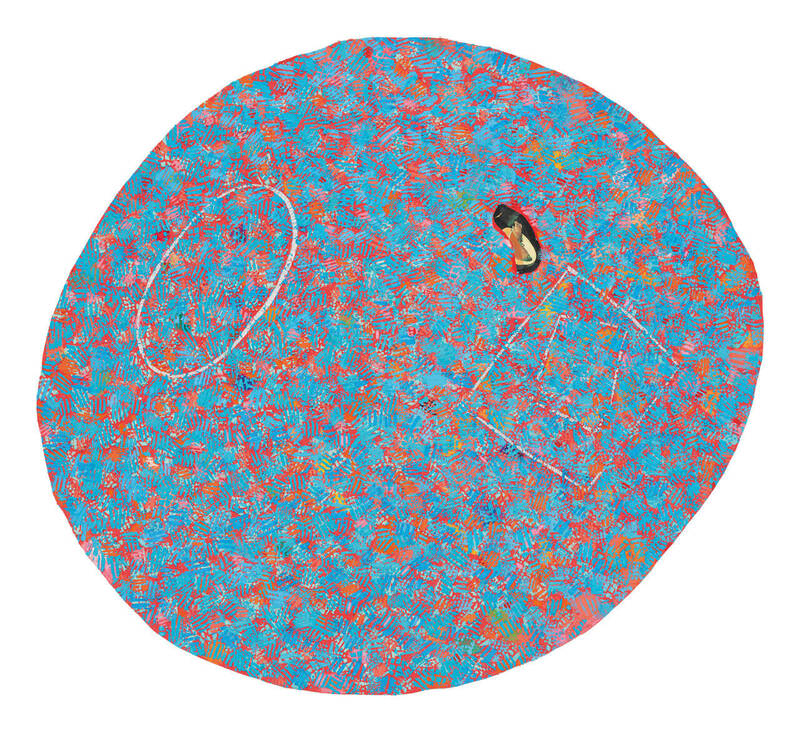 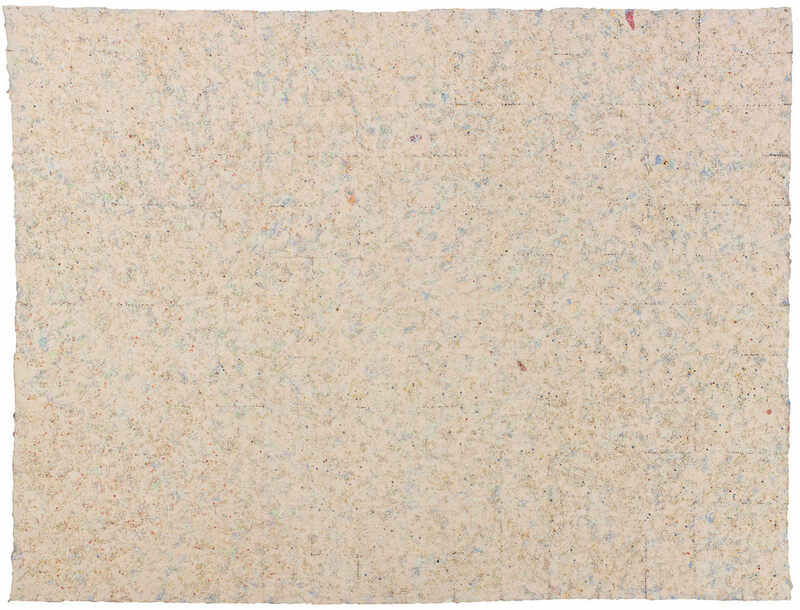 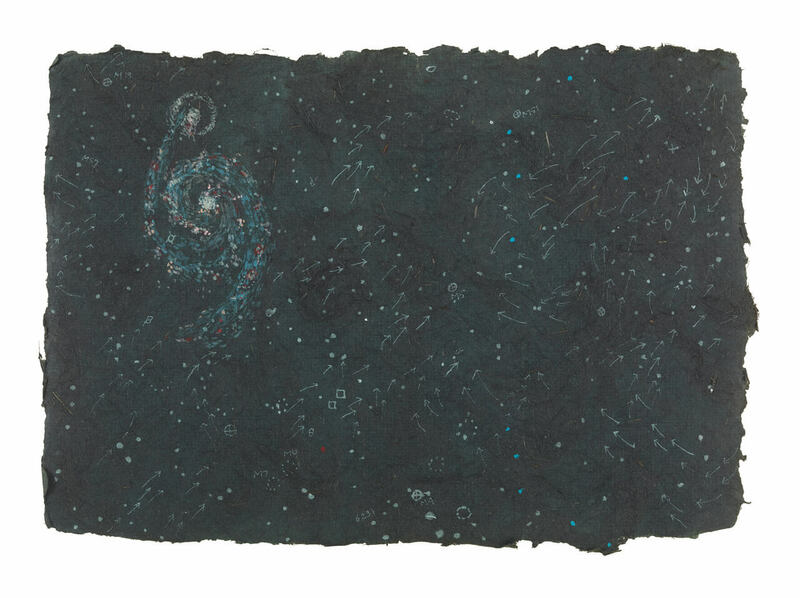 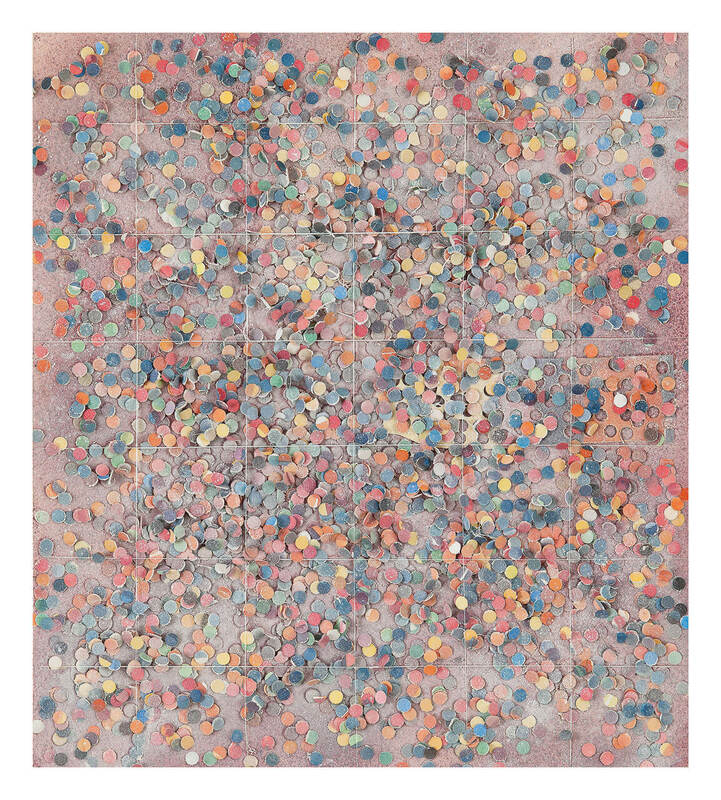 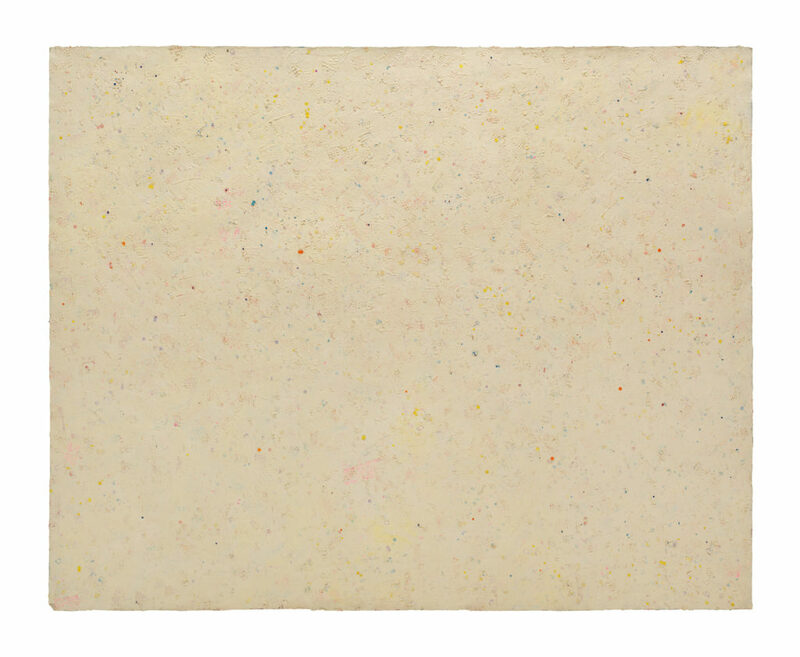 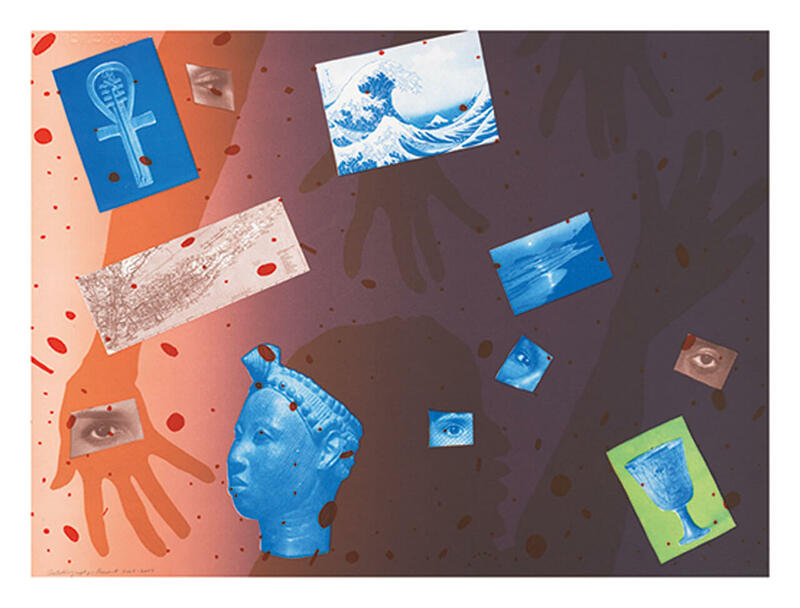 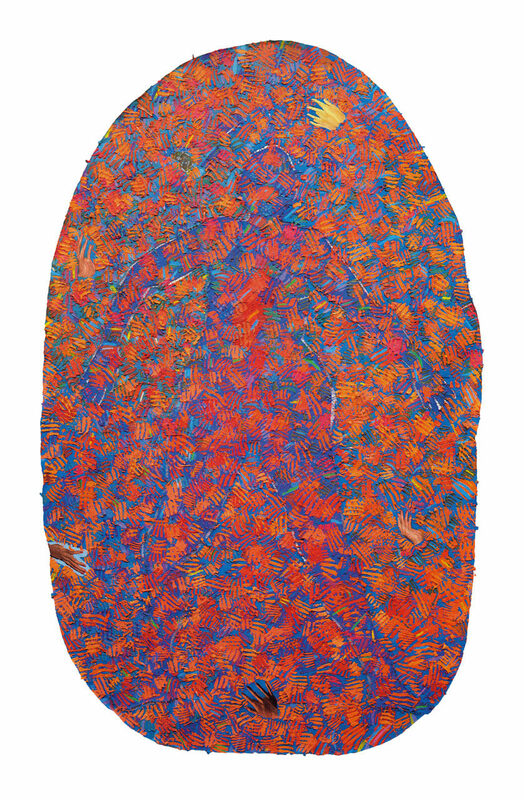 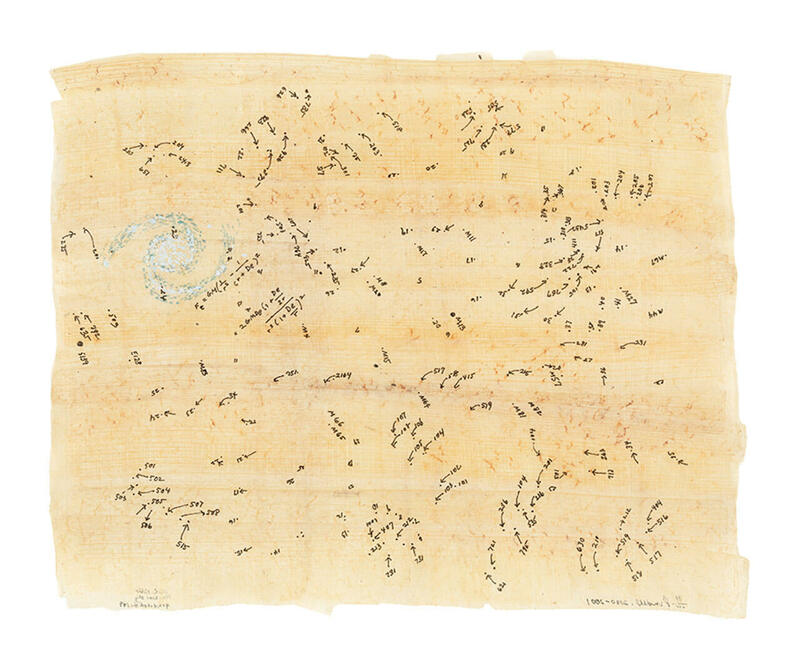 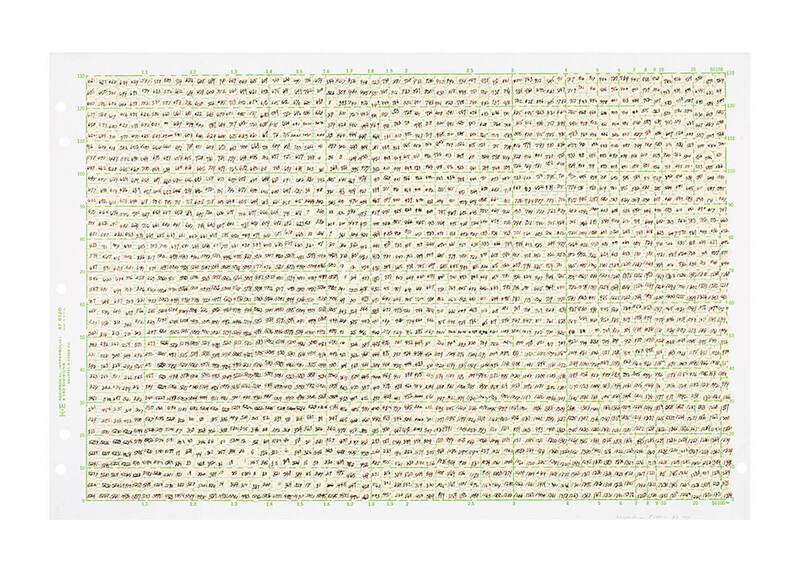 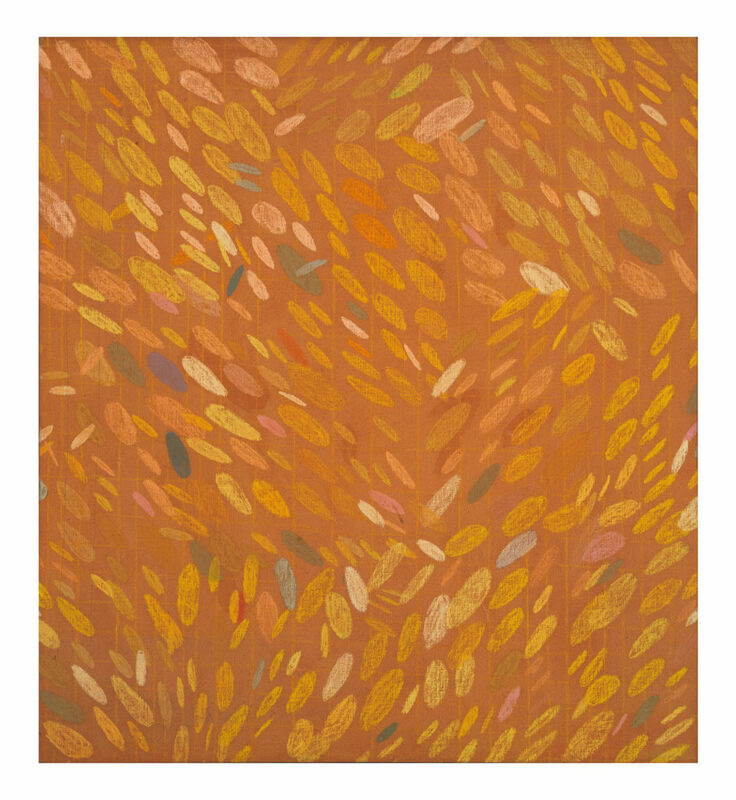 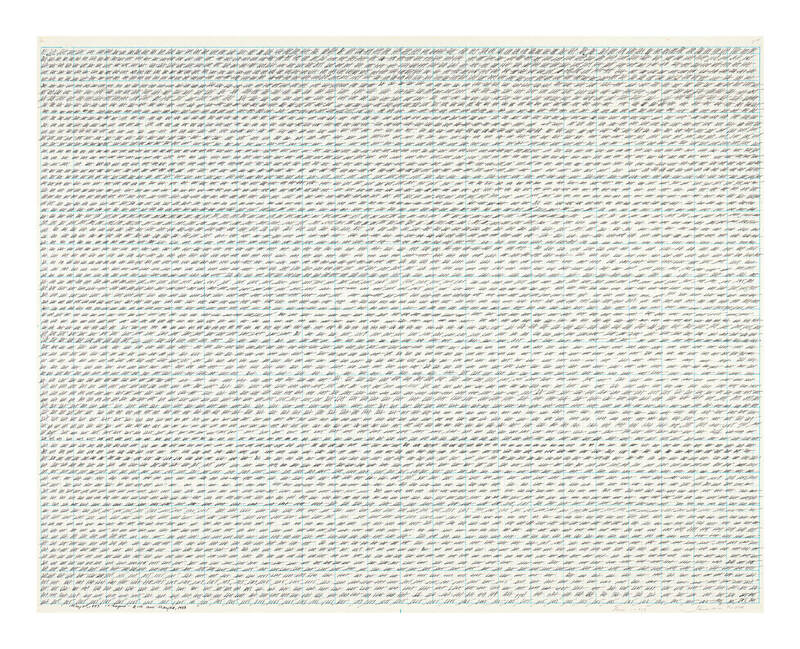 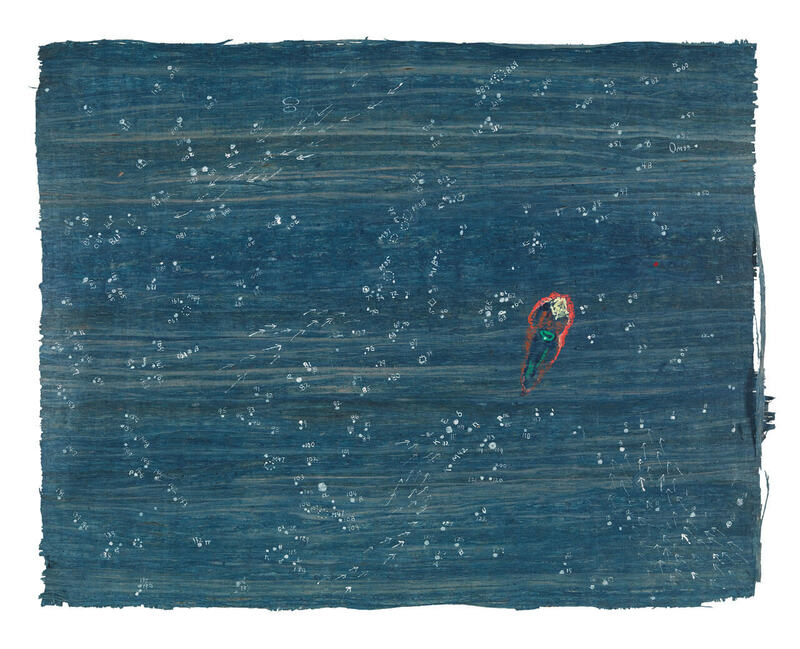 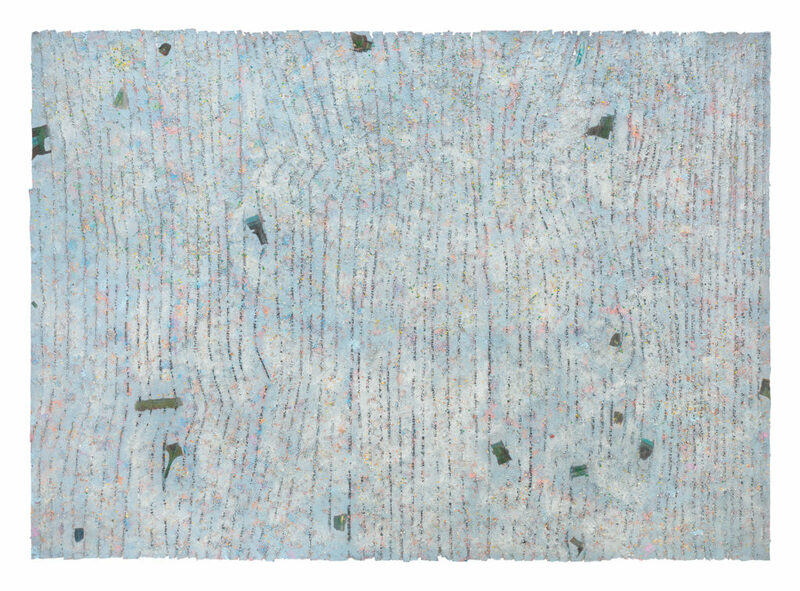 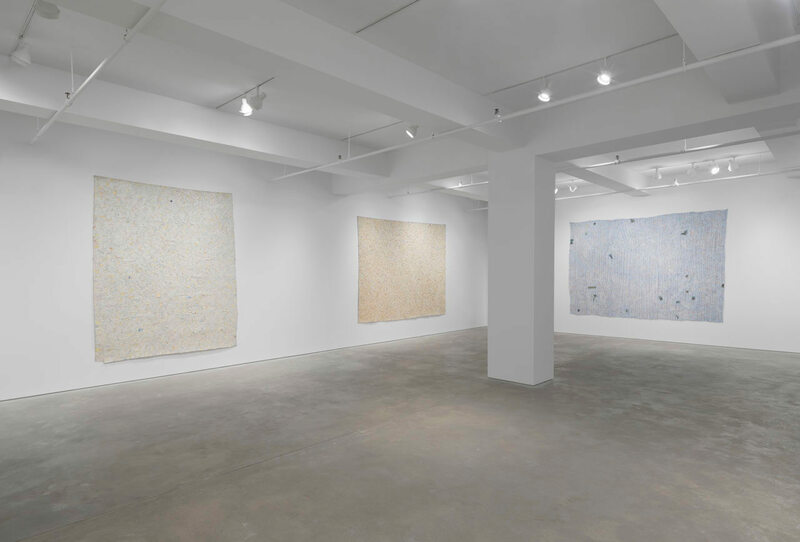 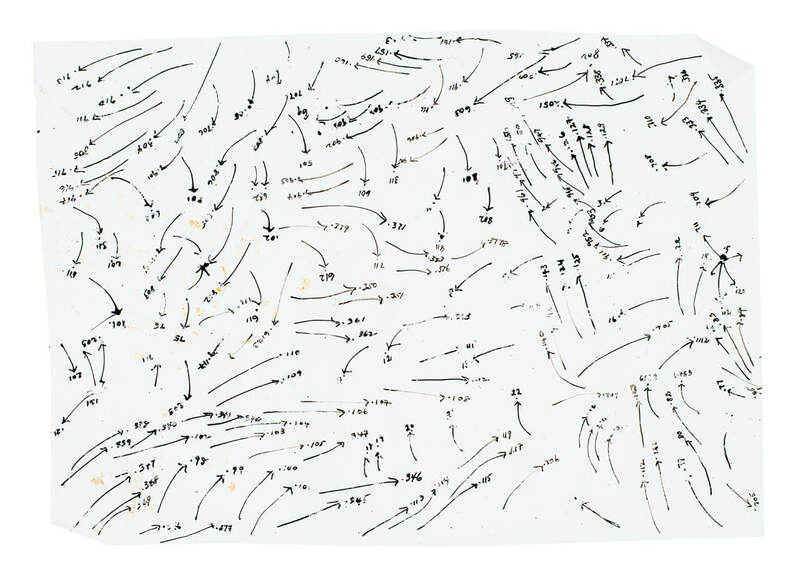 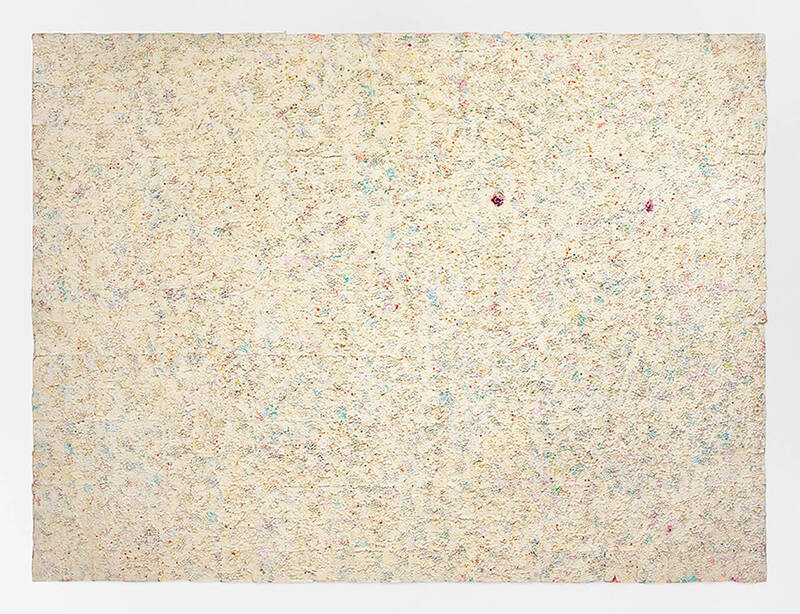 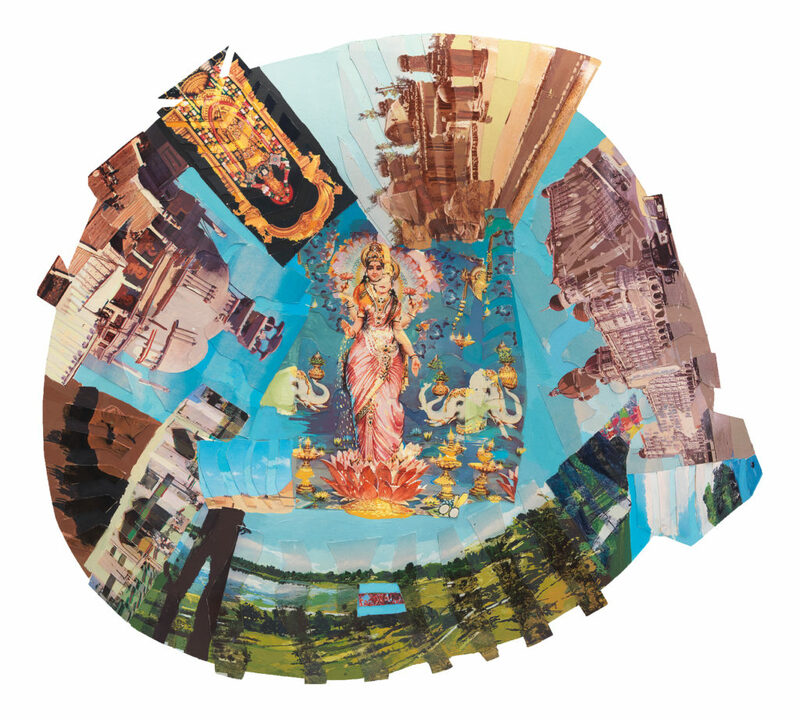 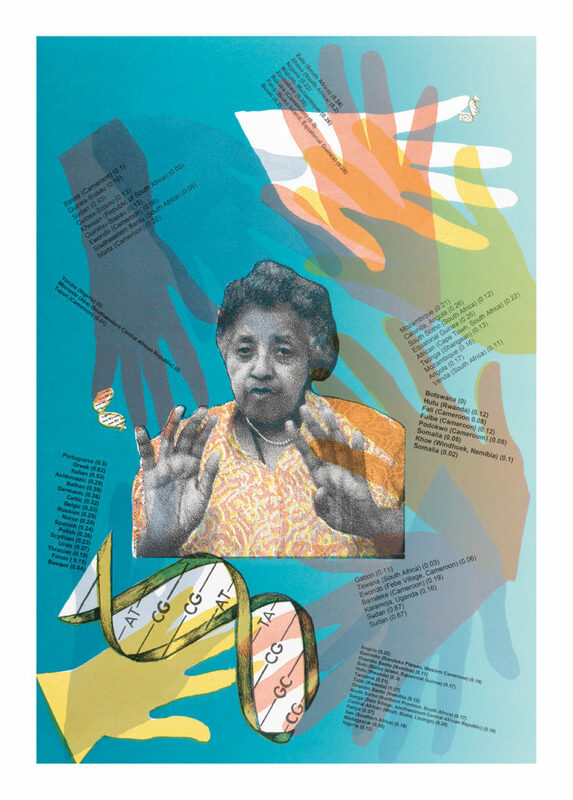 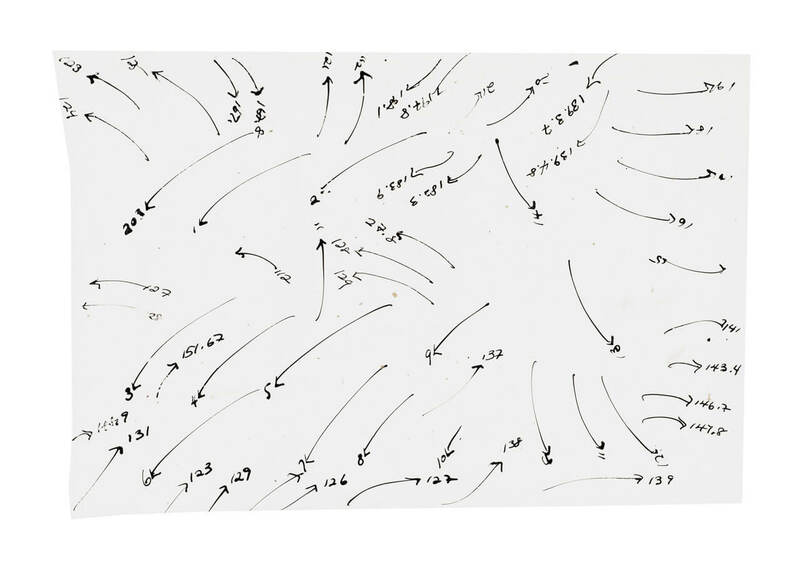 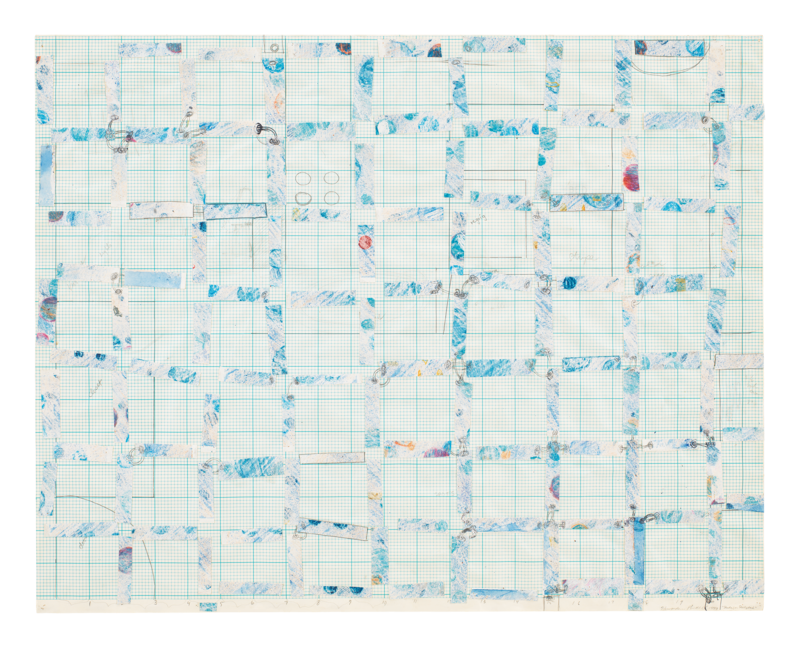 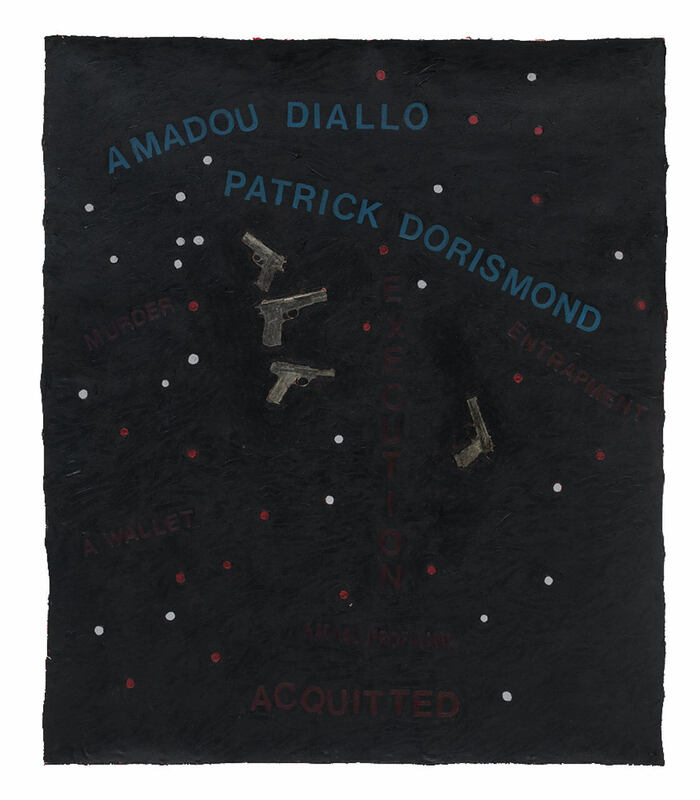 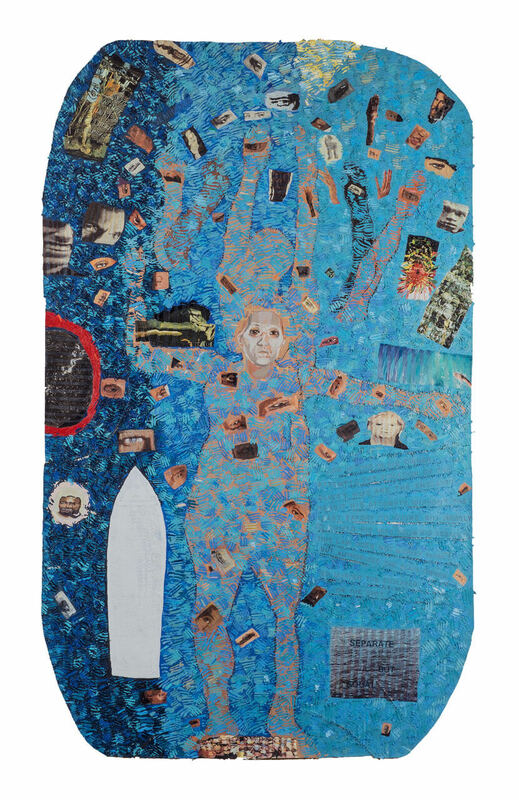 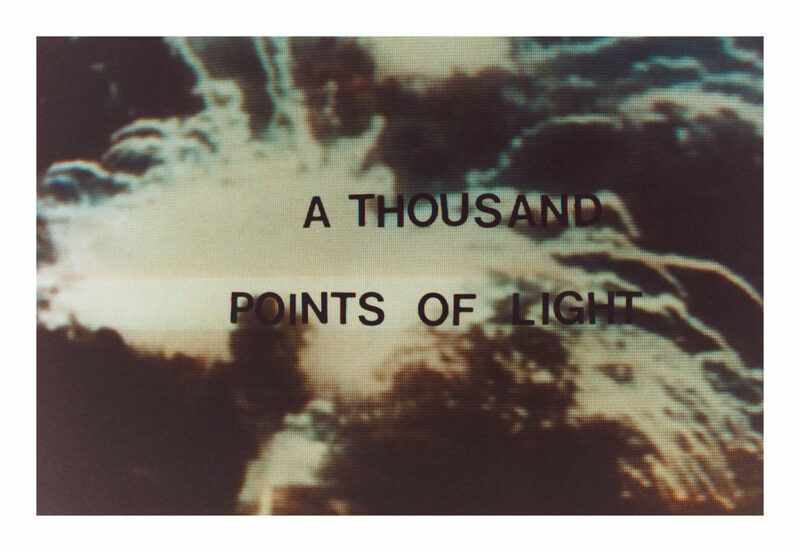 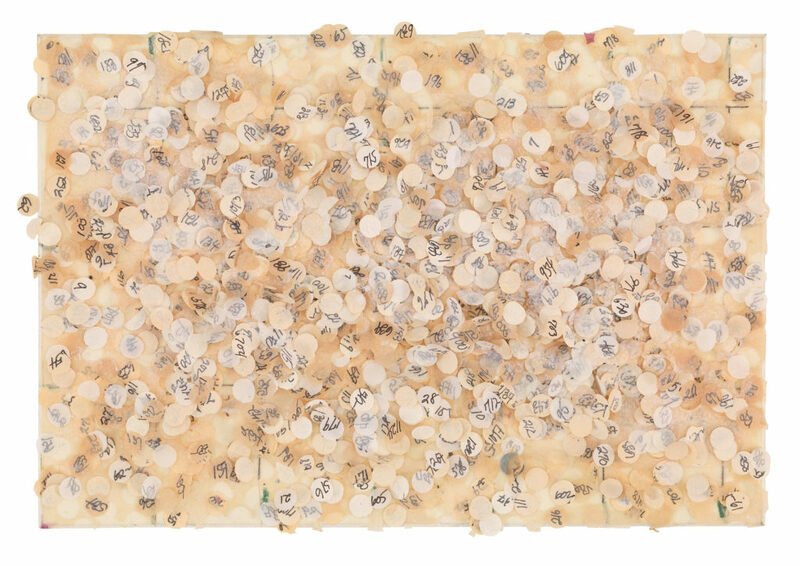 It includes an extensive selection of Howardena Pindell’s work, including the complete exhibition checklist, as well as archival photographs and documents that contextualize the catalogue essays and Pindell’s published texts. 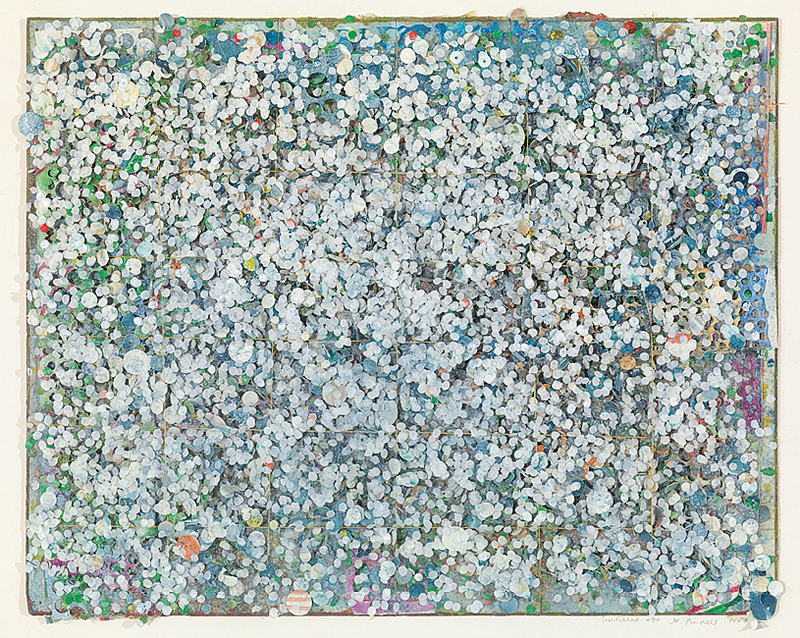 Untitled, 1969. 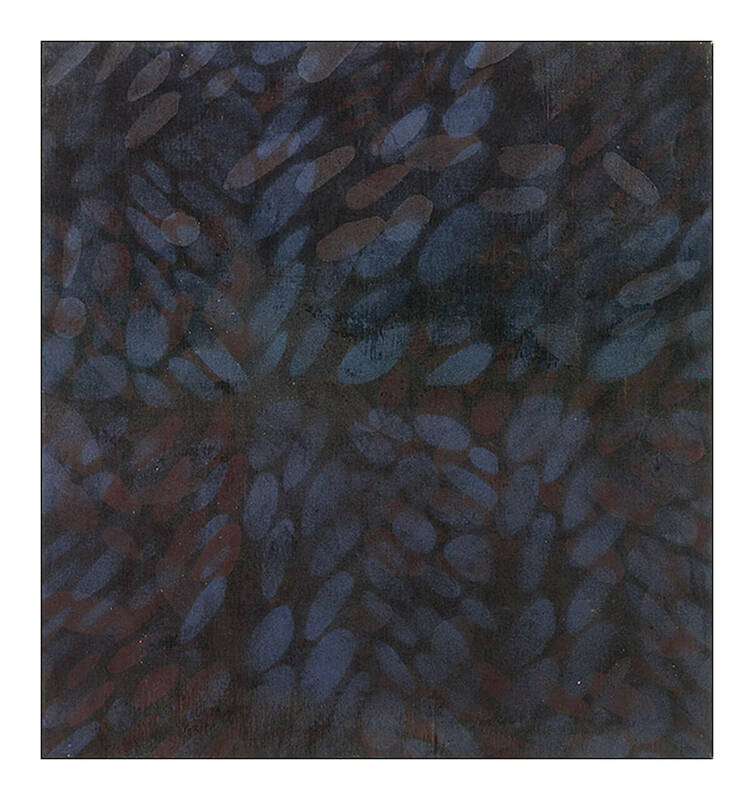 Acrylic on canvas; 40 1/2 x 48 in. 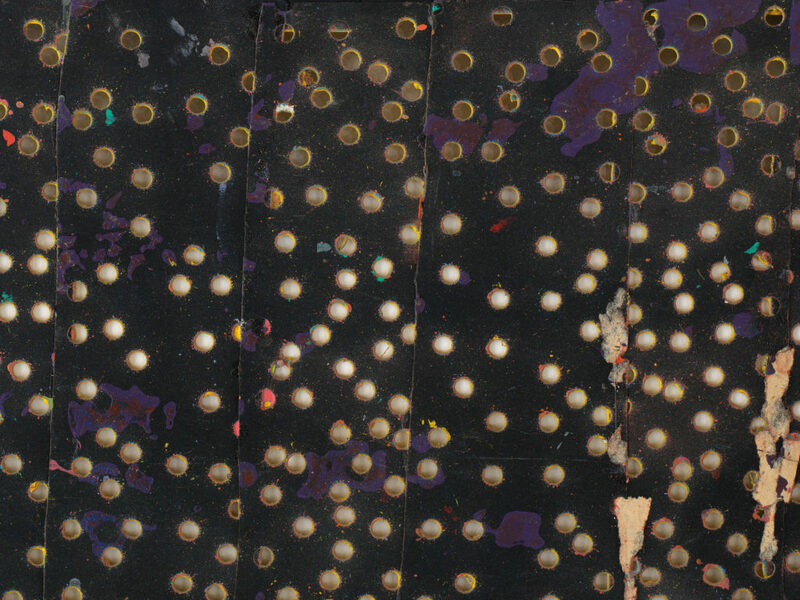 Untitled stencil (detail), 1970. 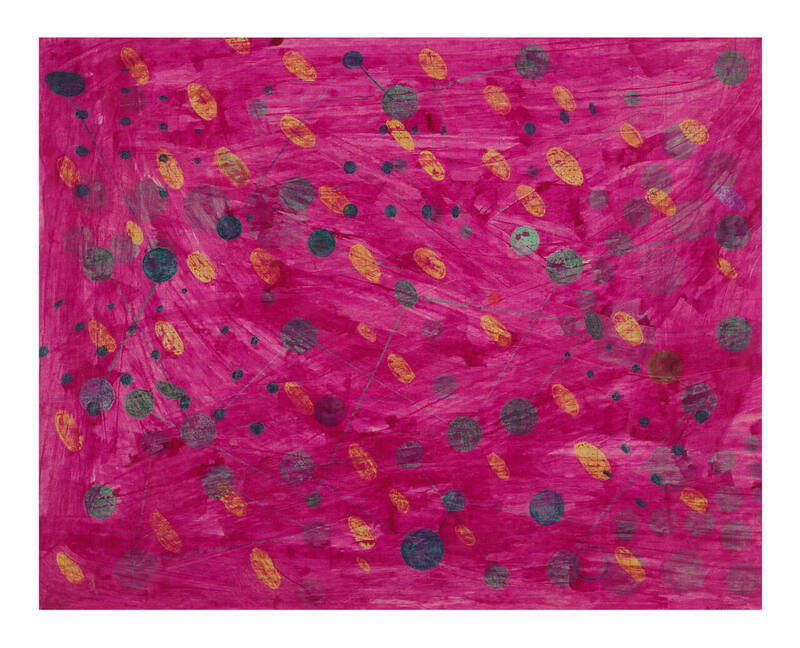 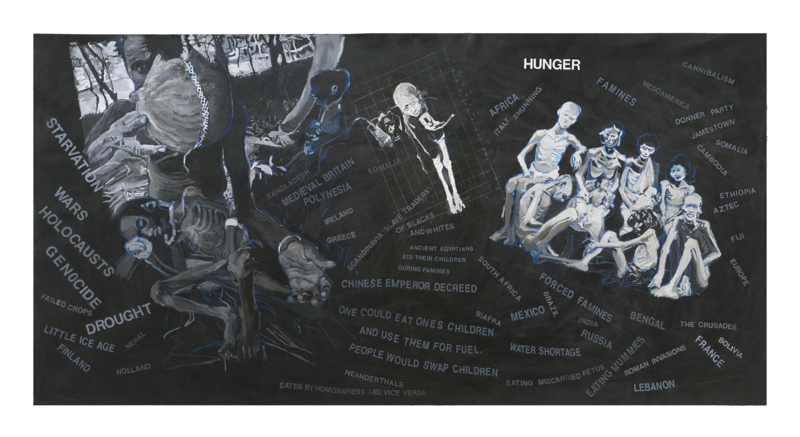 Acrylic on paper; 35 x 81 in. Courtesy the artist. 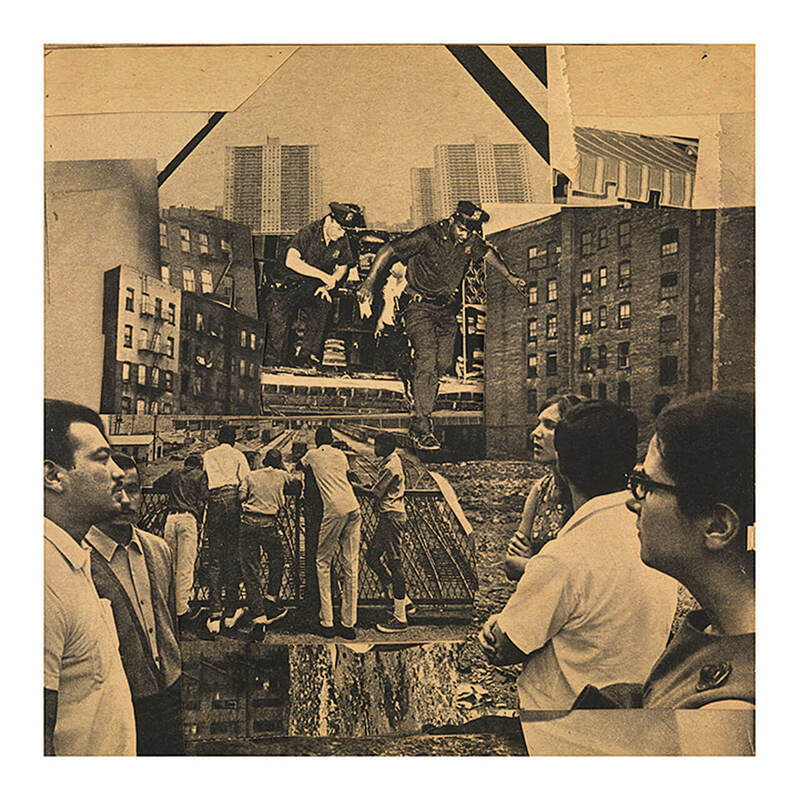 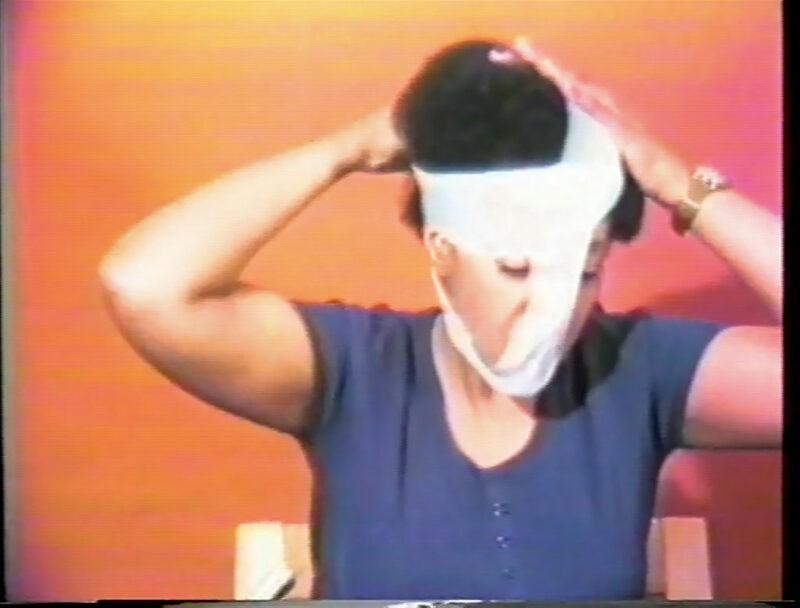 Removal 3/8, 1973. 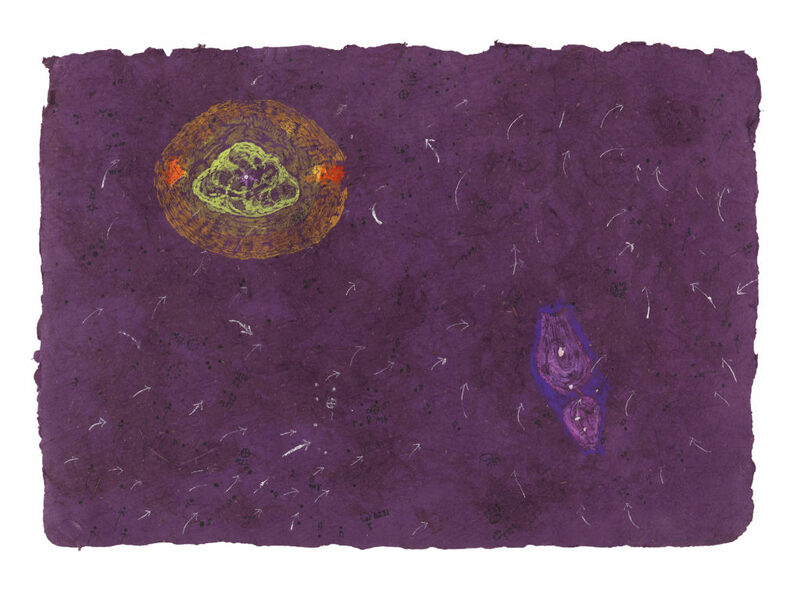 Mixed media on paper; 18 1/2 x 23 1/4 in. 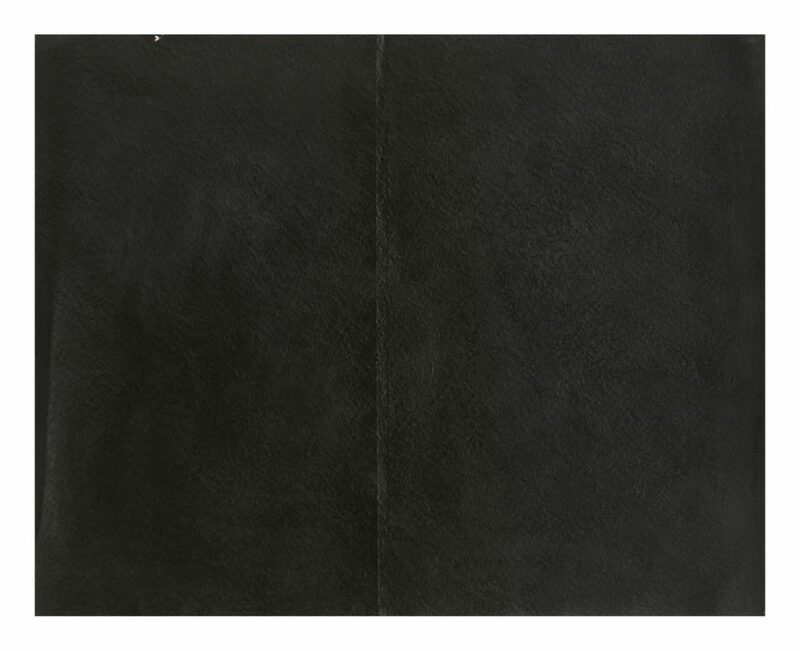 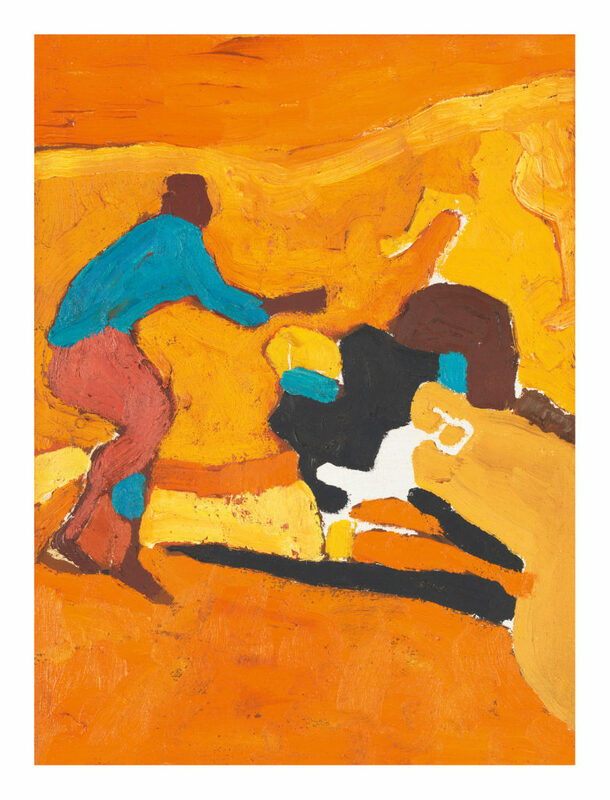 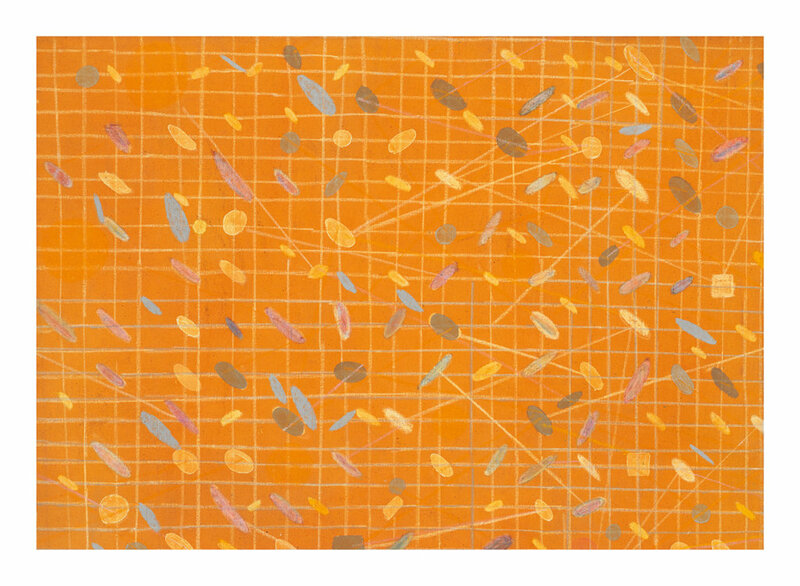 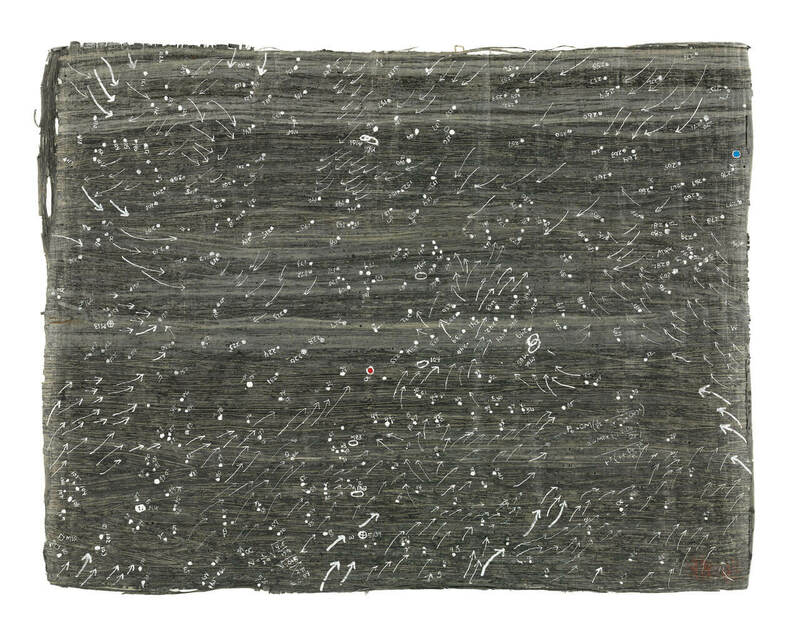 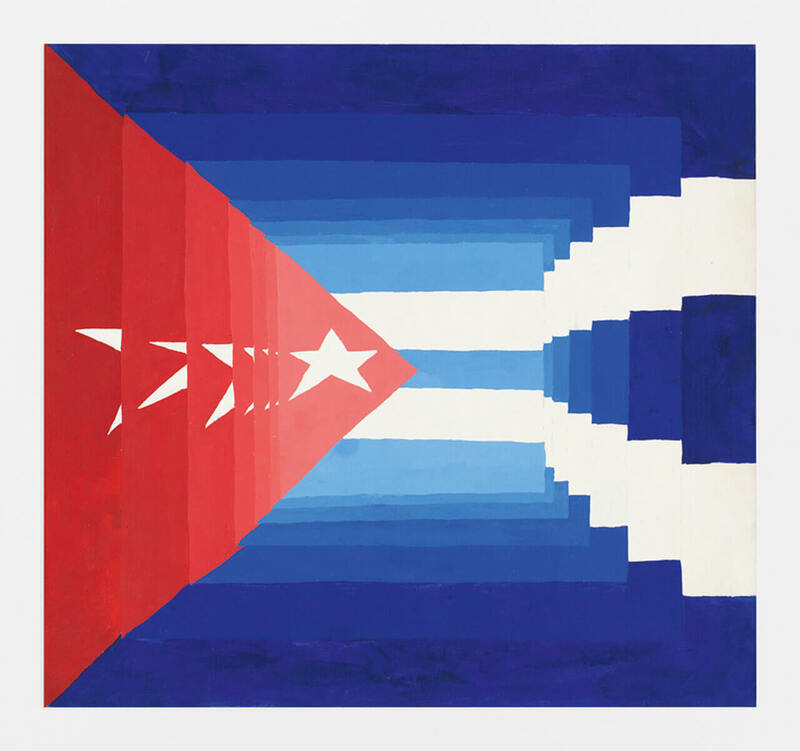 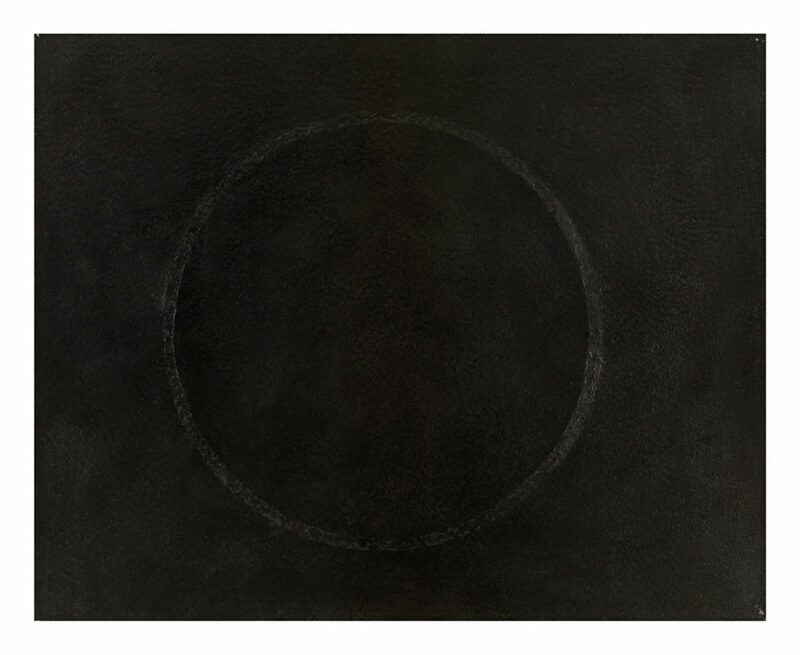 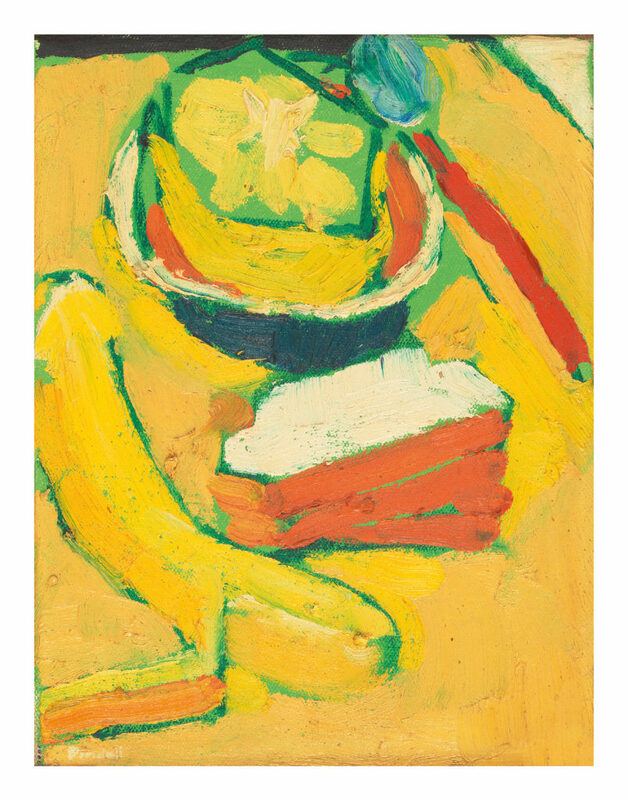 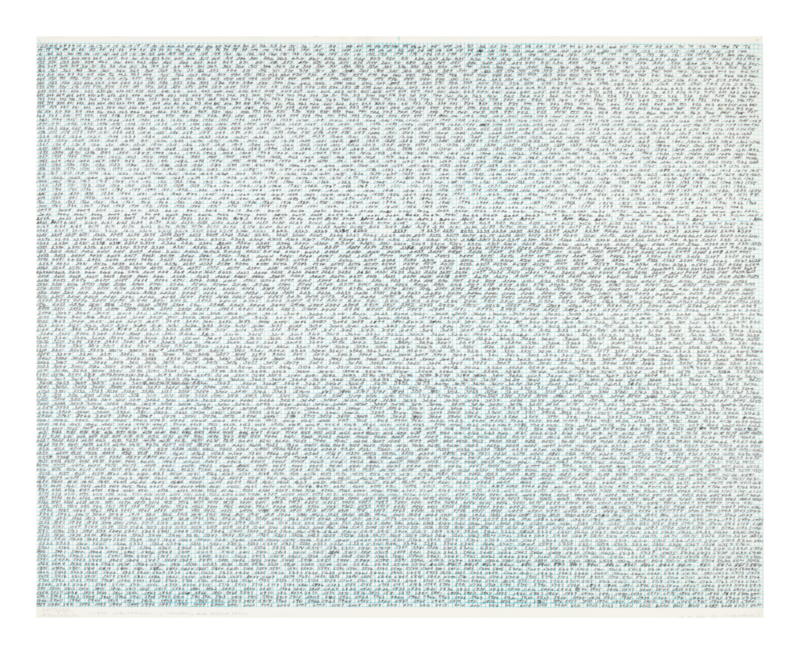 Untitled #20, 1974. 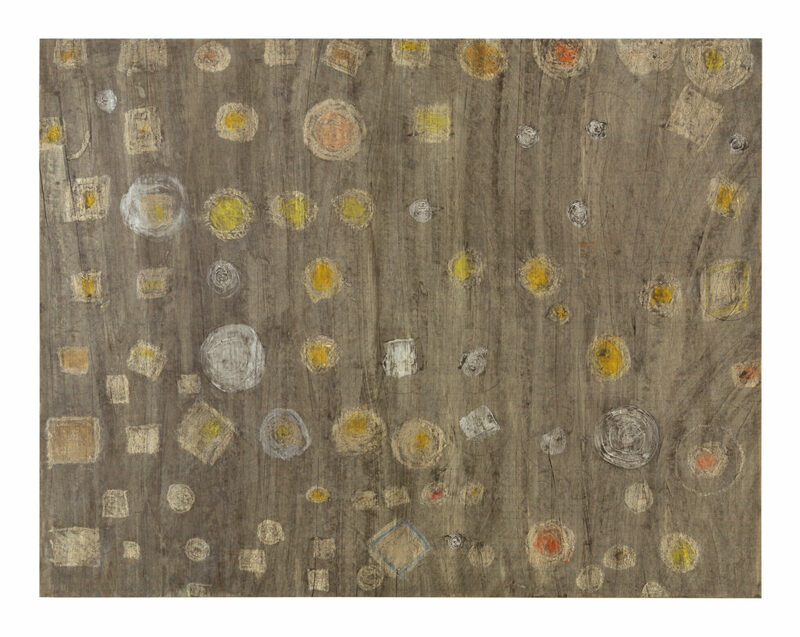 Mixed media on board; 12 x 9 5/8 in. 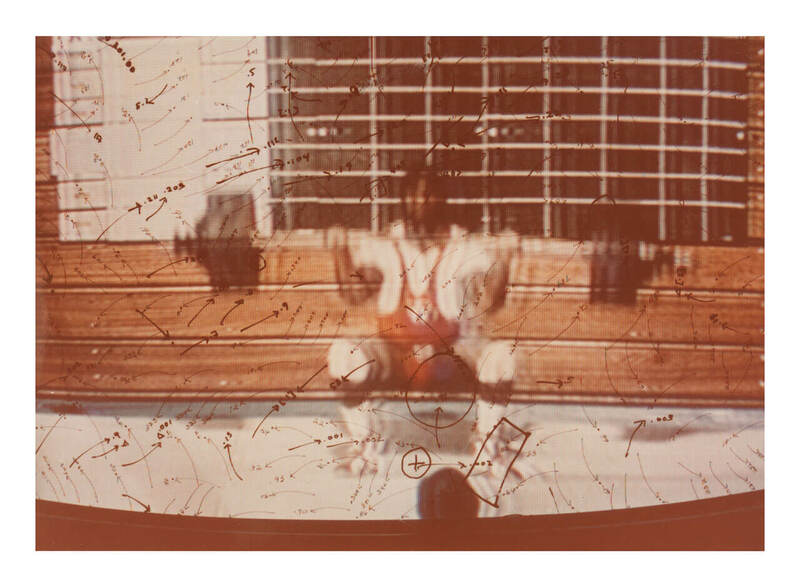 Video Drawings: Weightlifting, 1975. 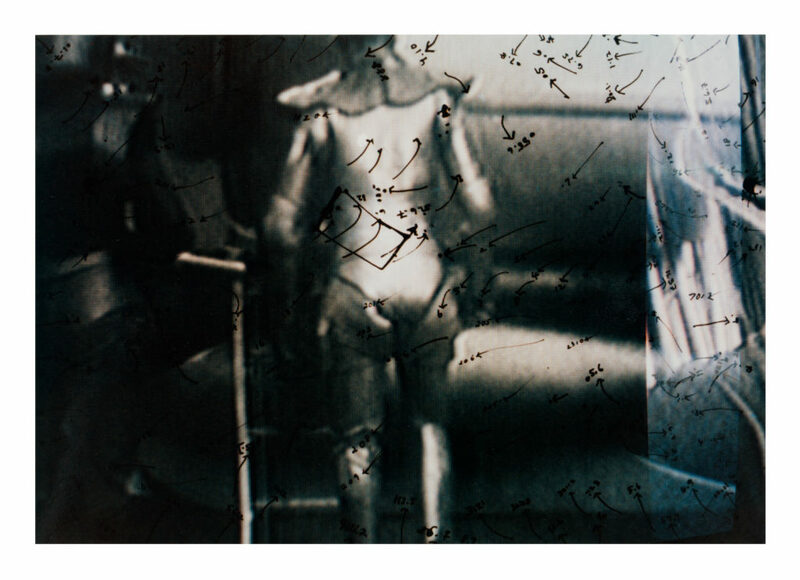 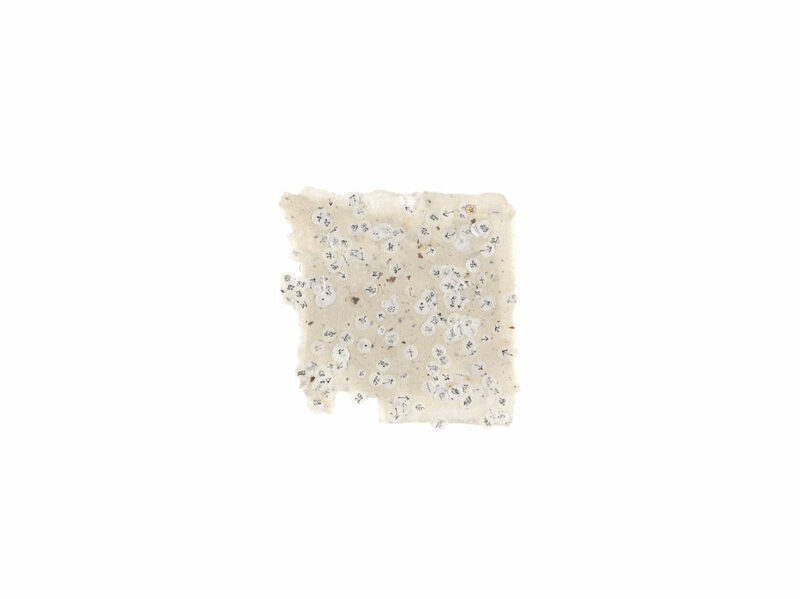 Chromogenic print; 5 x 7 in. 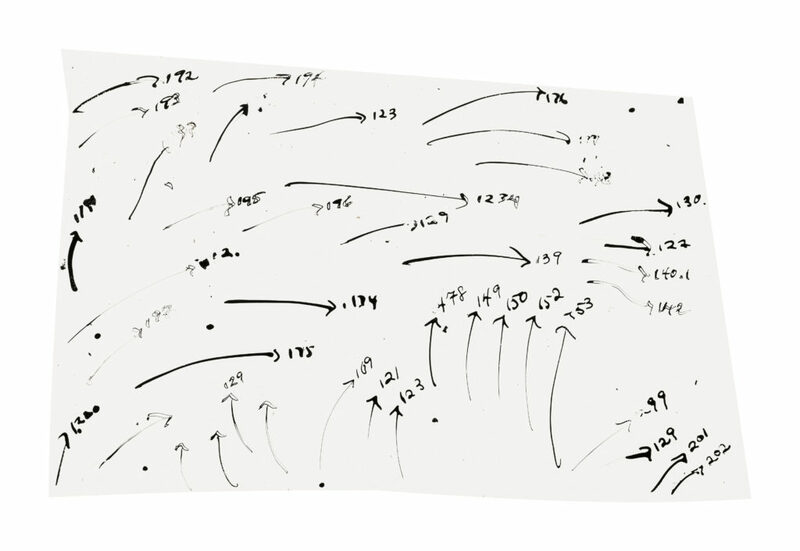 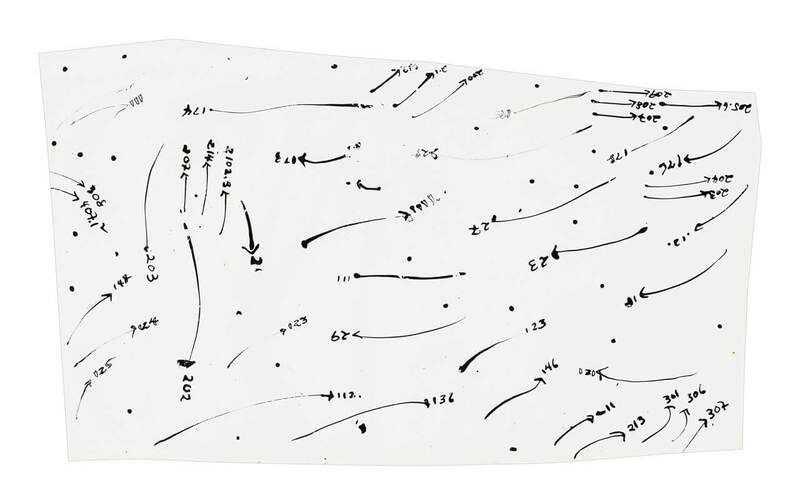 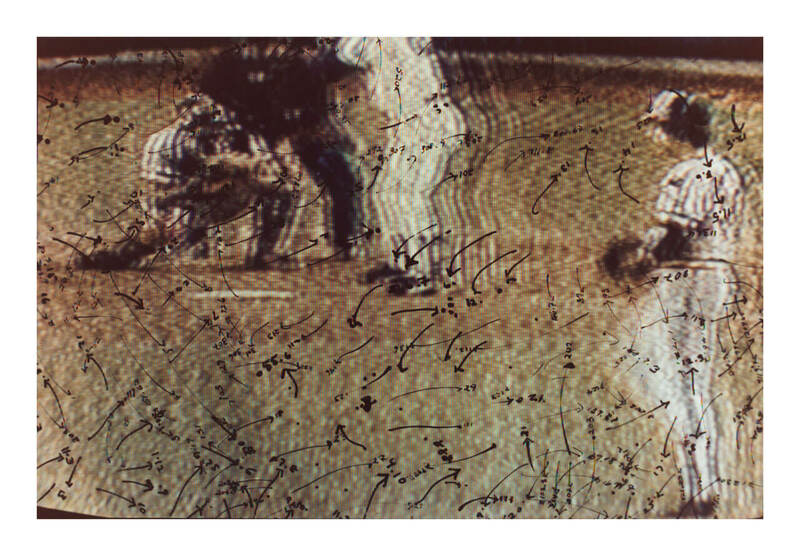 Scrap of Video Drawing template, 1976. Ink on acetate; 4 1/2 x 7 1/2 in. 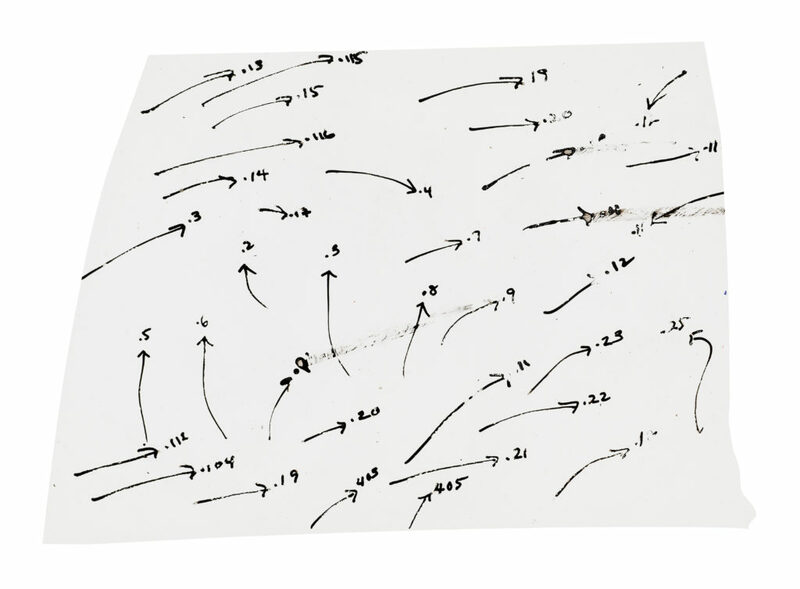 Scrap of Video Drawing template, 1976. Ink on acetate; 3 ¼ x 6 in. 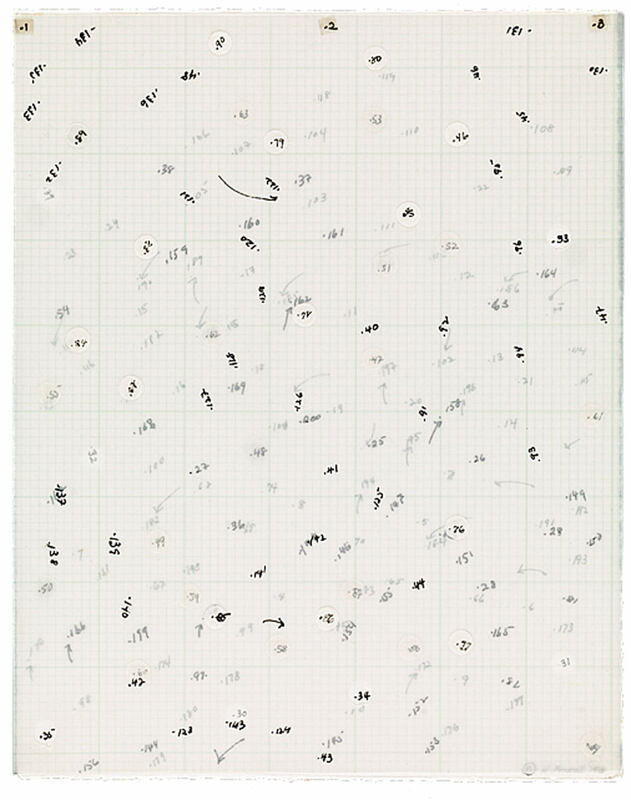 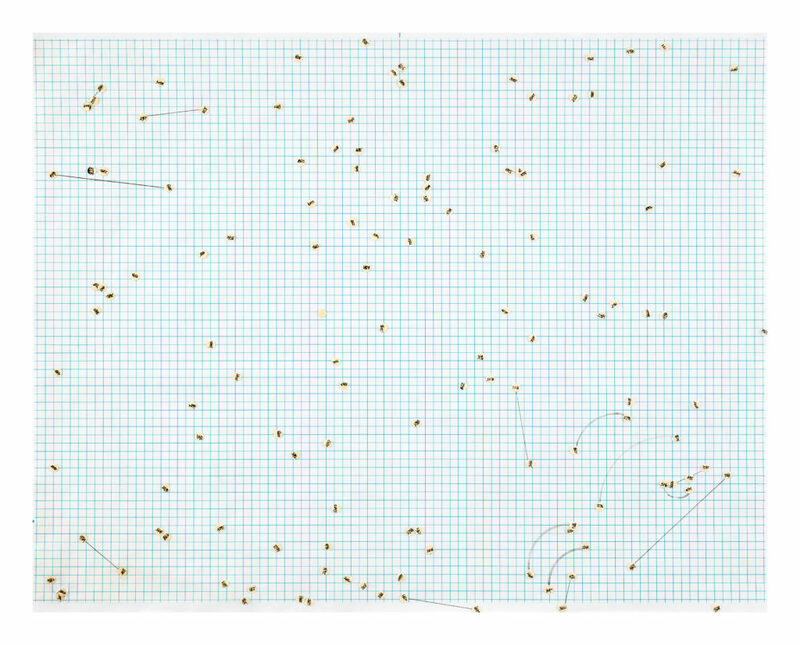 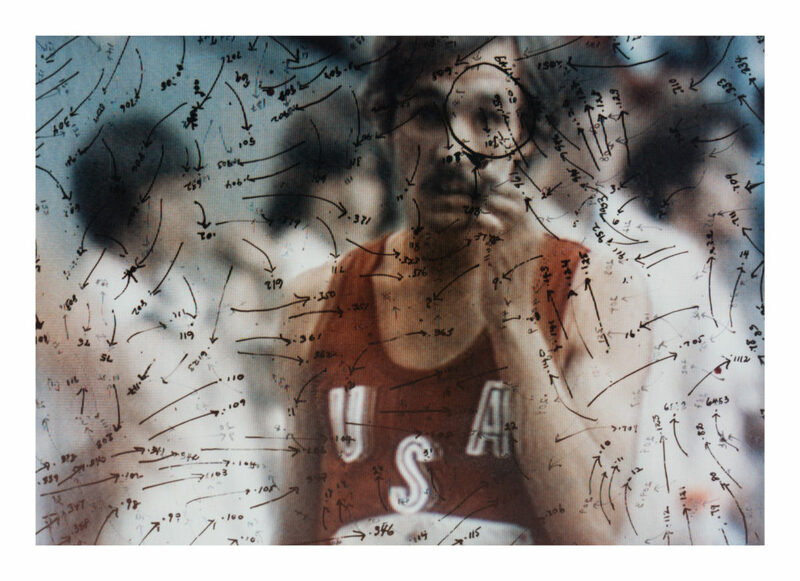 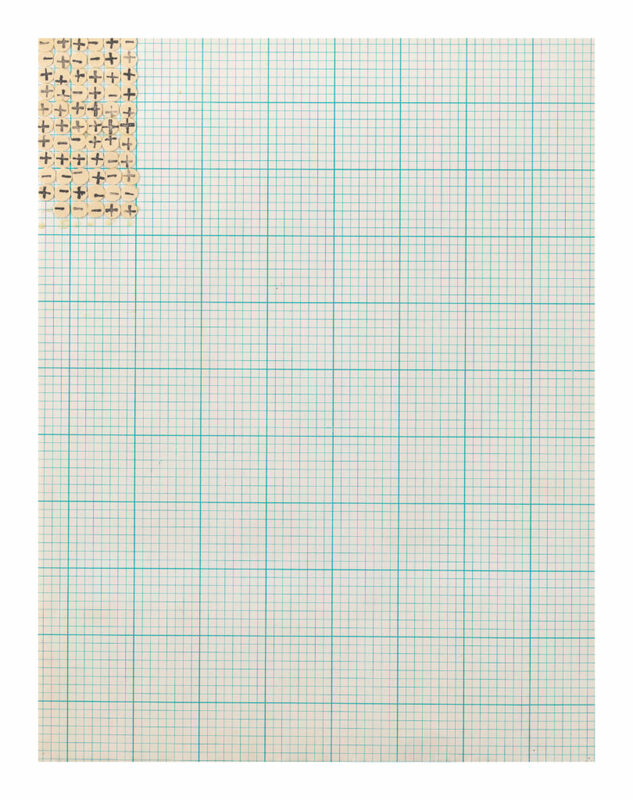 Untitled #20 (Dutch Wives Circled and Squared) (detail), 1978. 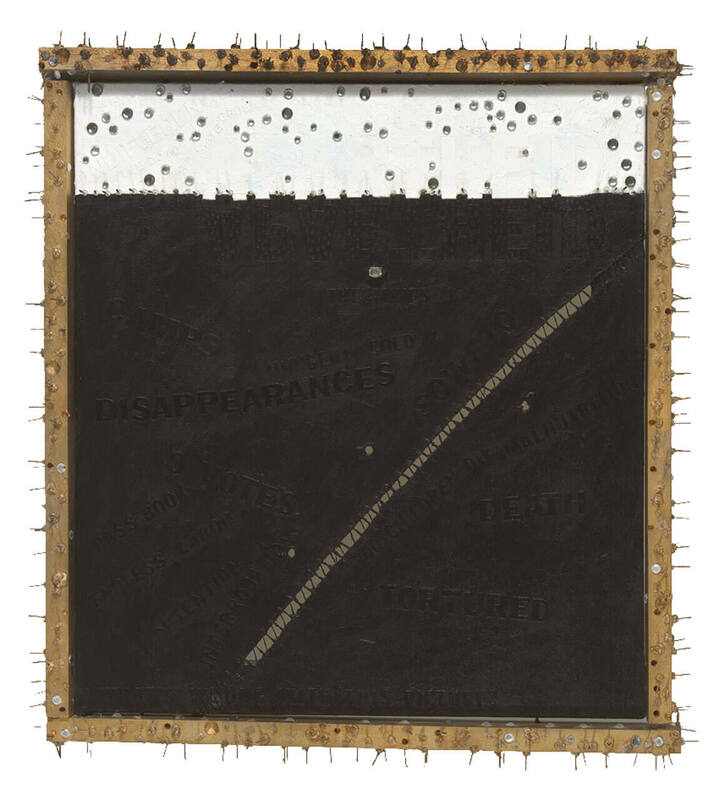 Mixed media on canvas; 86 x 110 in. 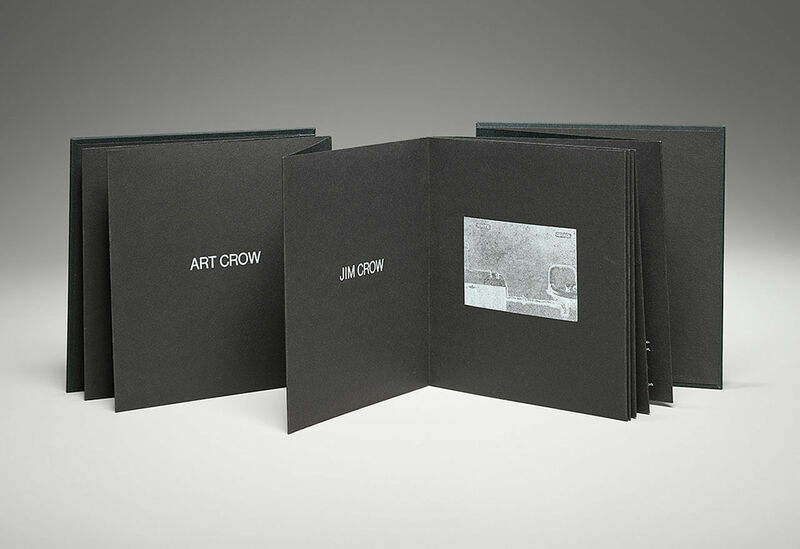 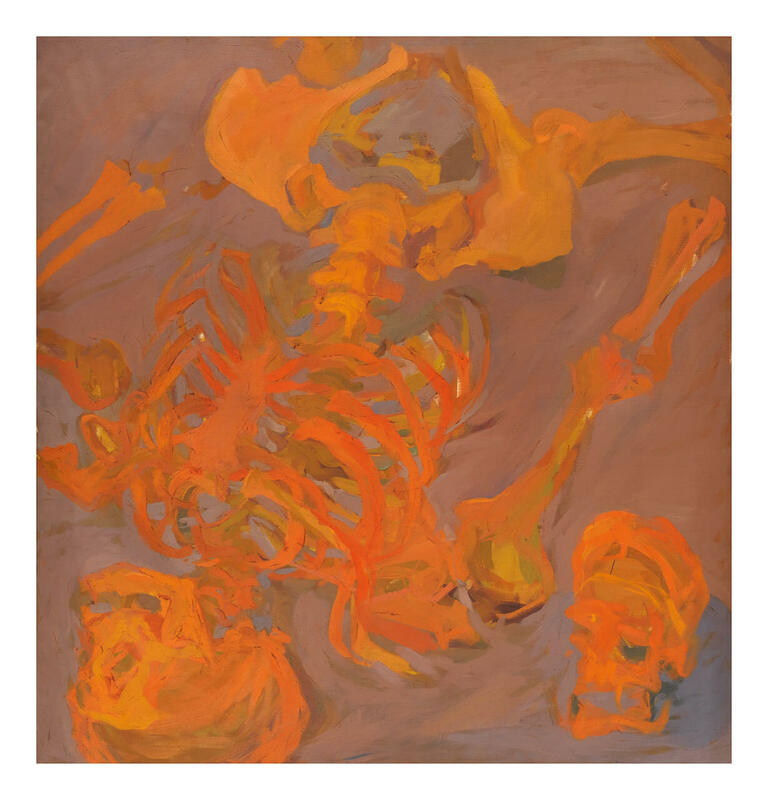 Collection Museum of Contemporary Art Chicago, gift of Albert A. Robin by exchange, 2014.15. 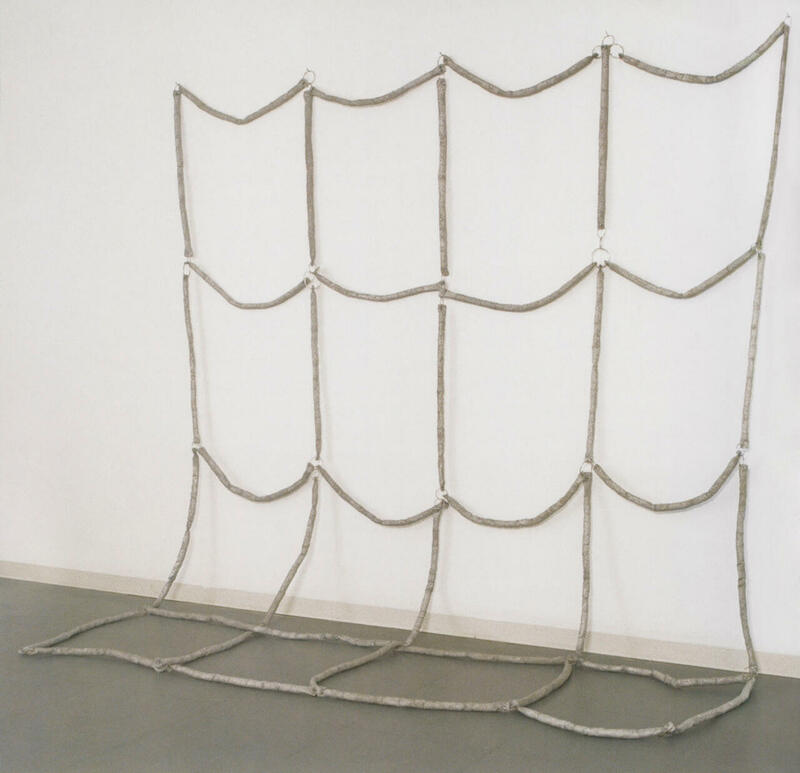 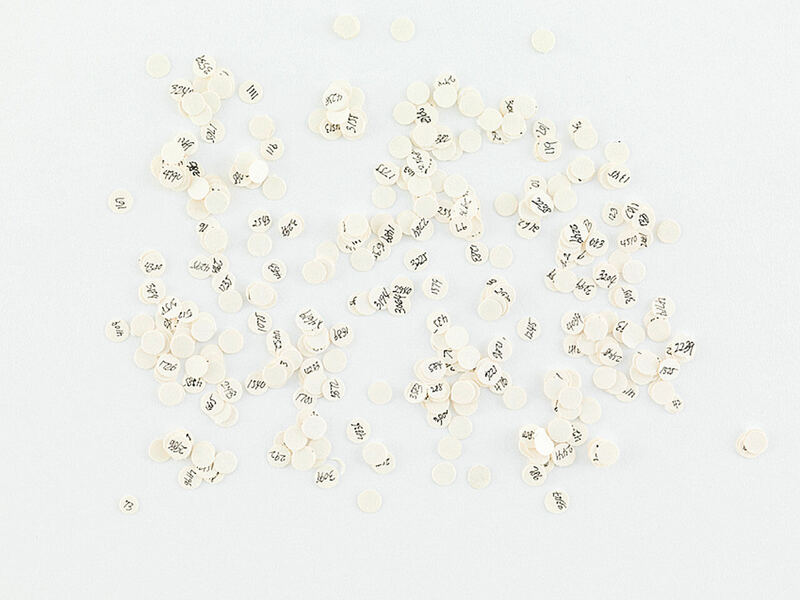 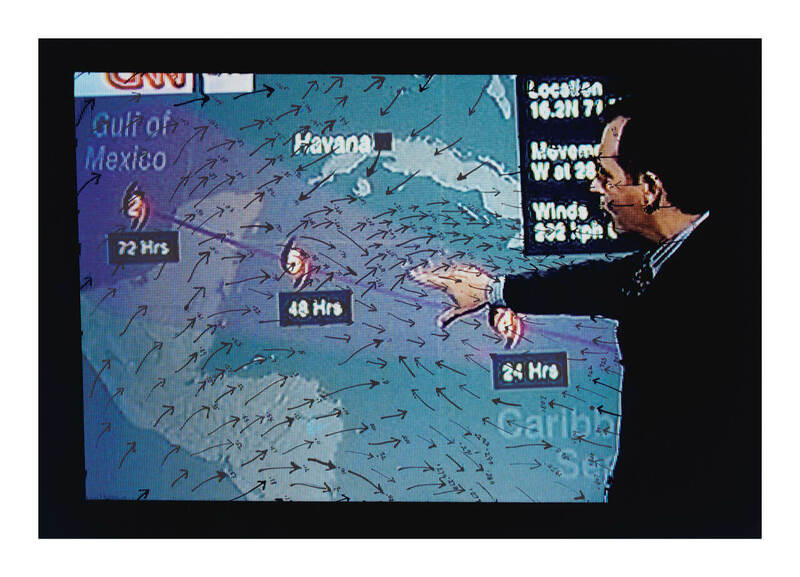 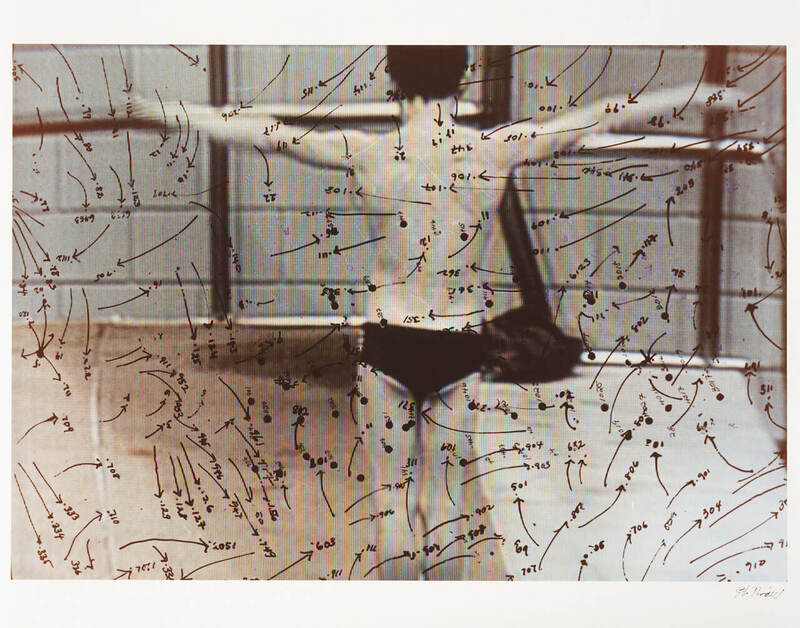 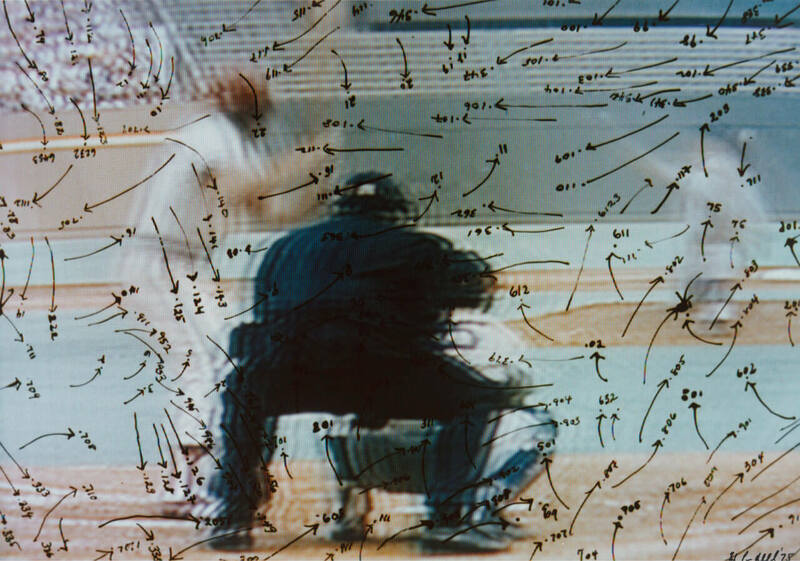 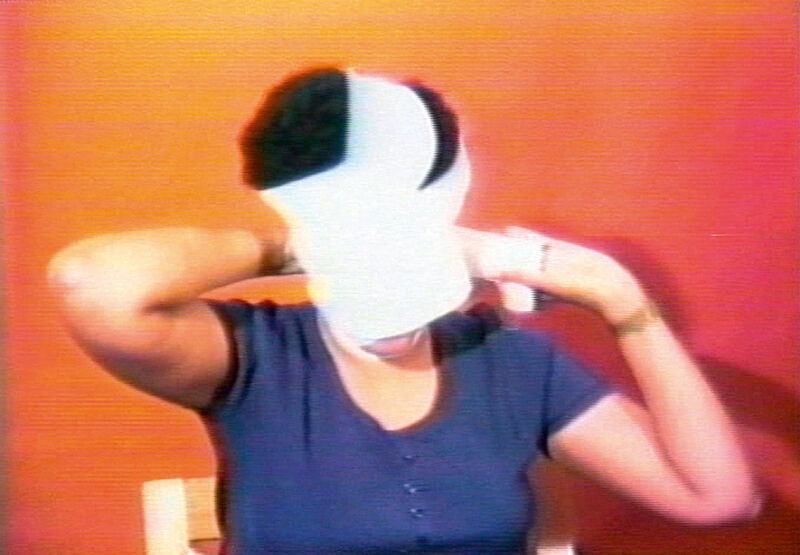 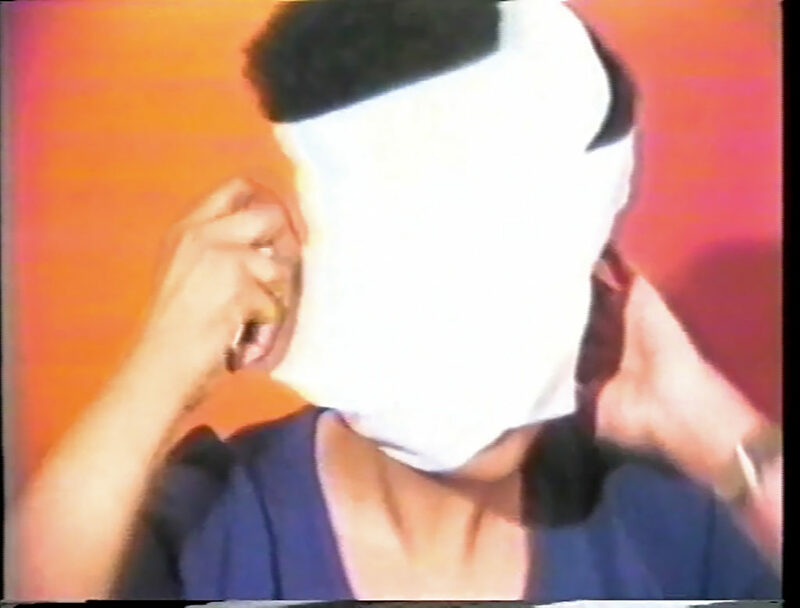 Still from Free, White and 21, 1980. 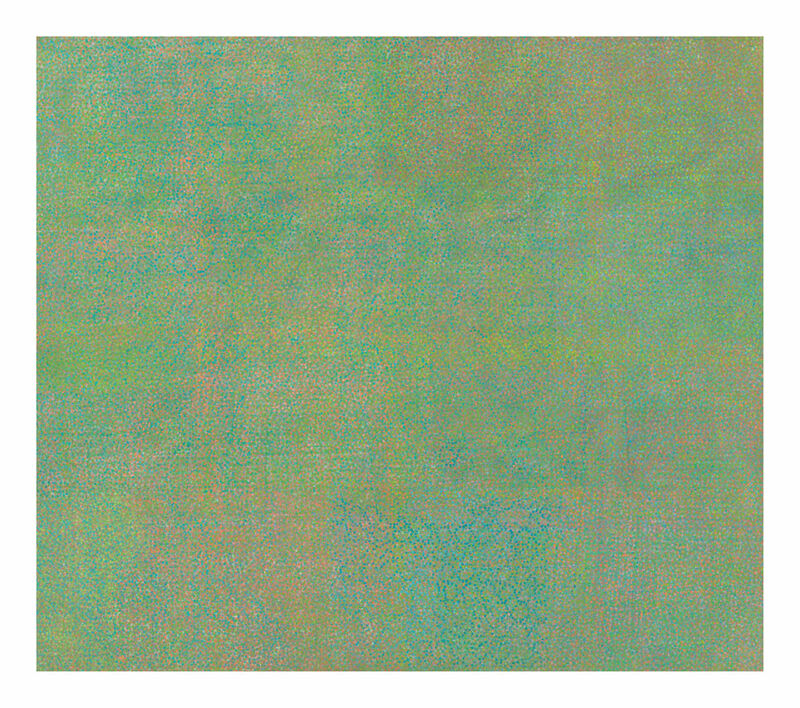 U-matic (color, sound); 12 minutes, 15 seconds. 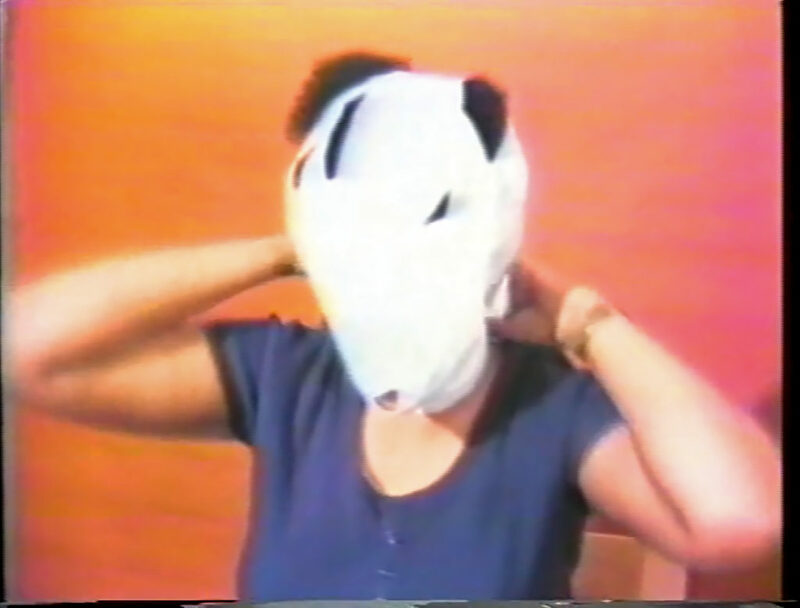 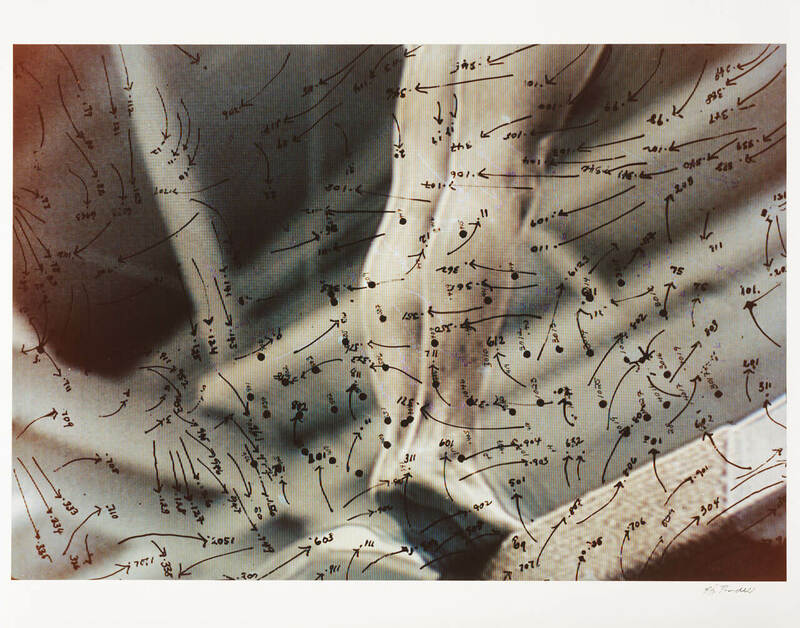 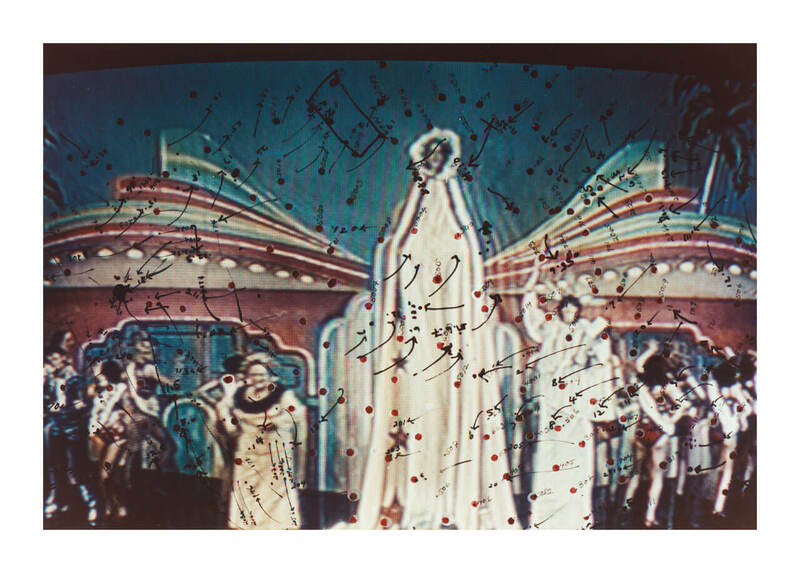 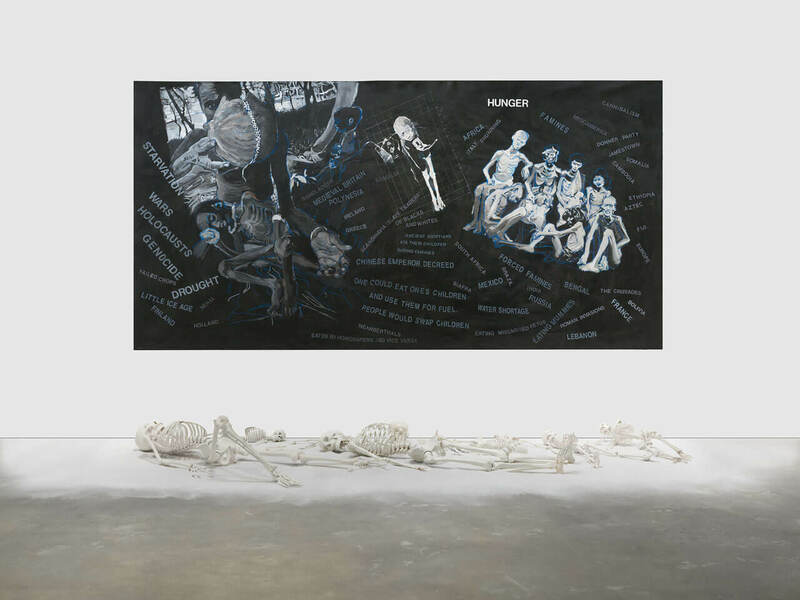 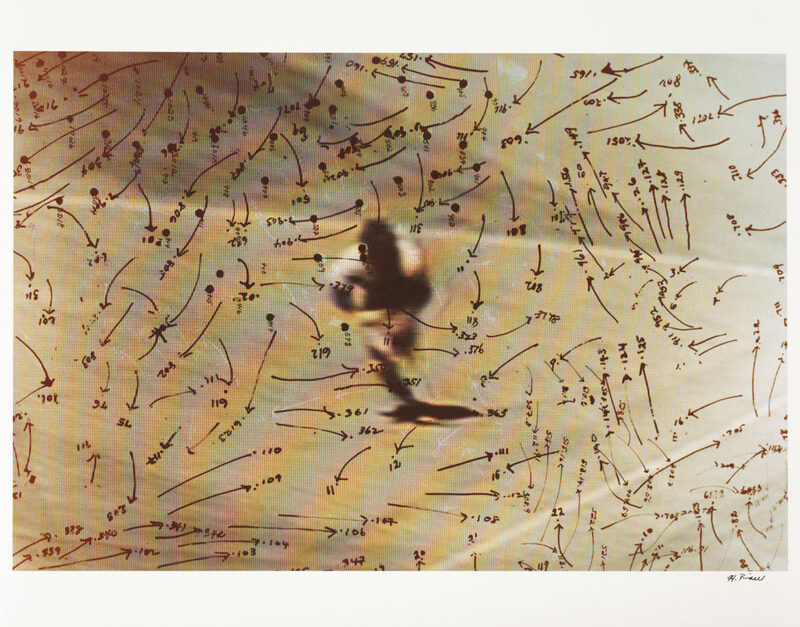 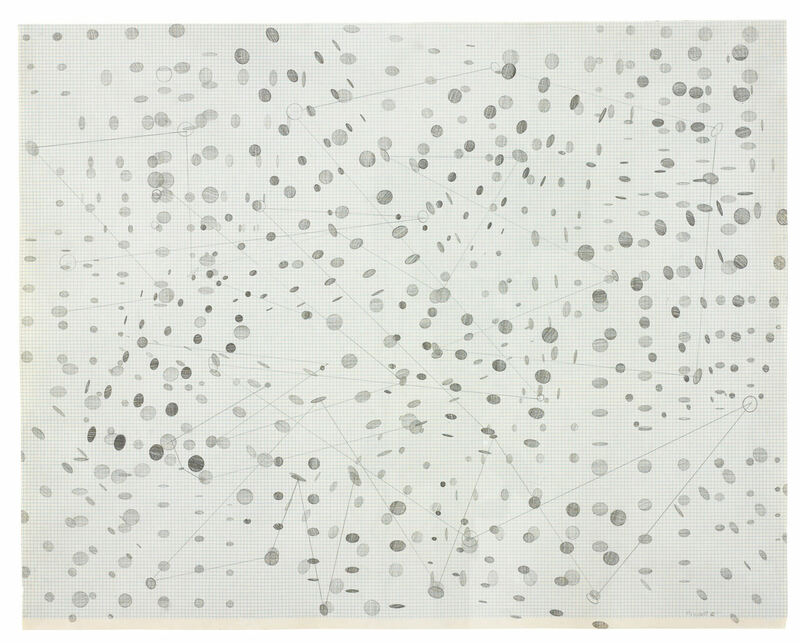 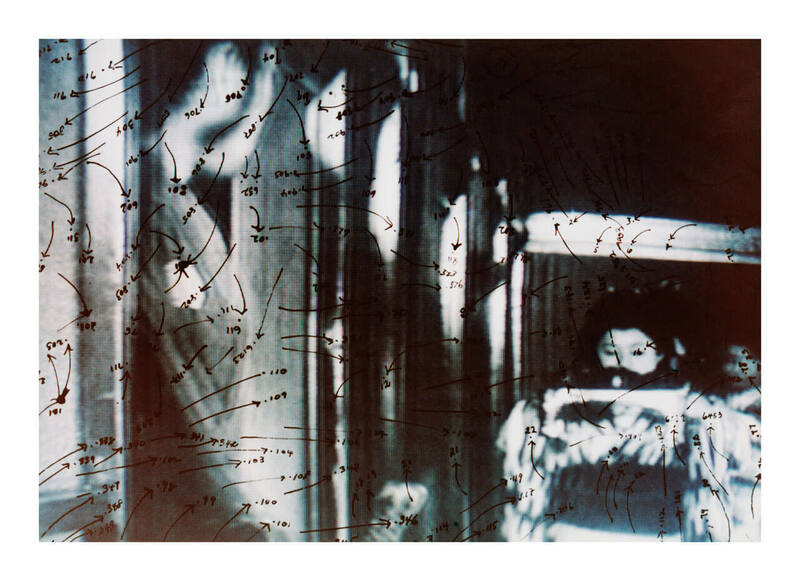 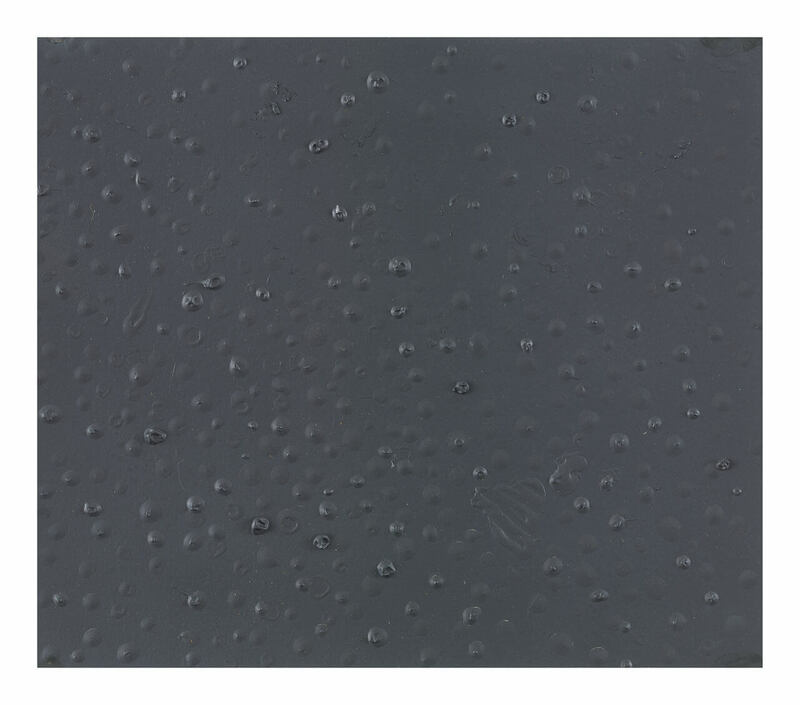 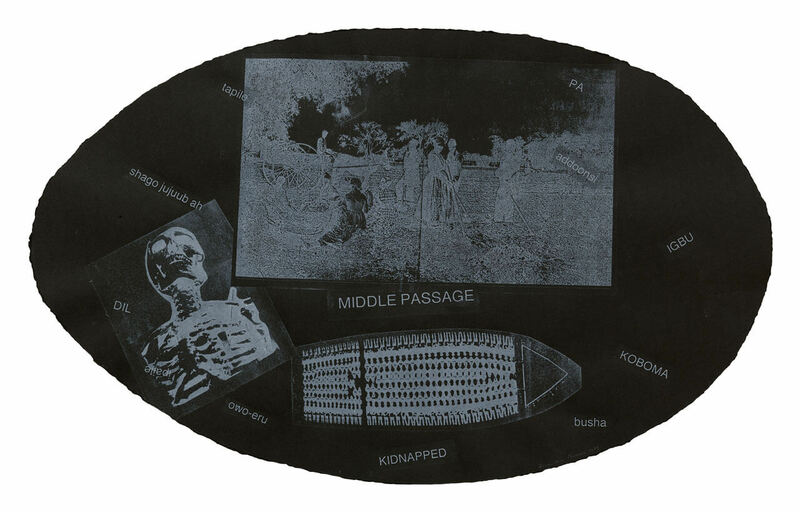 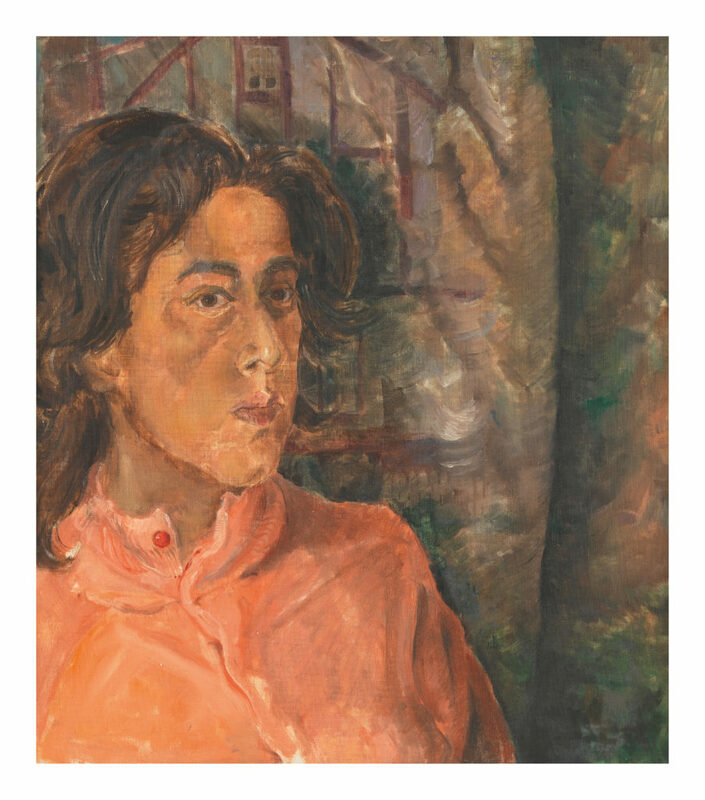 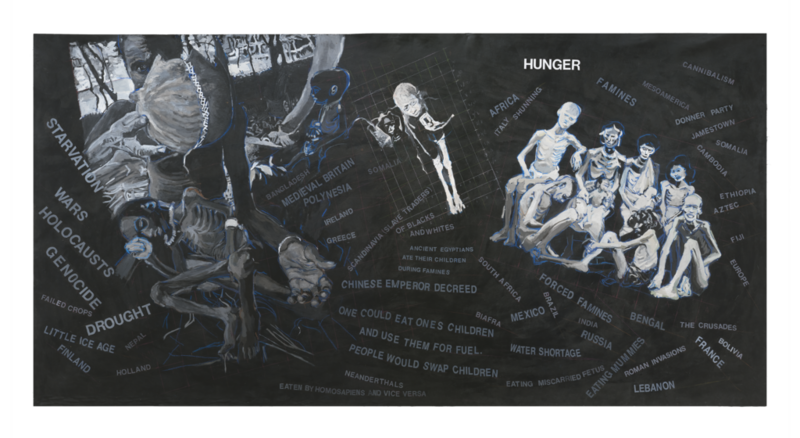 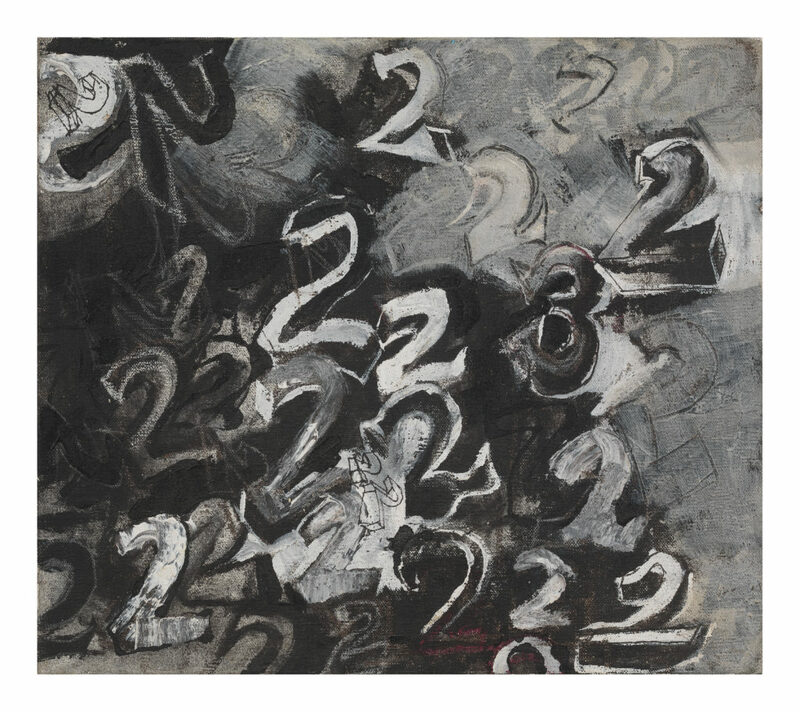 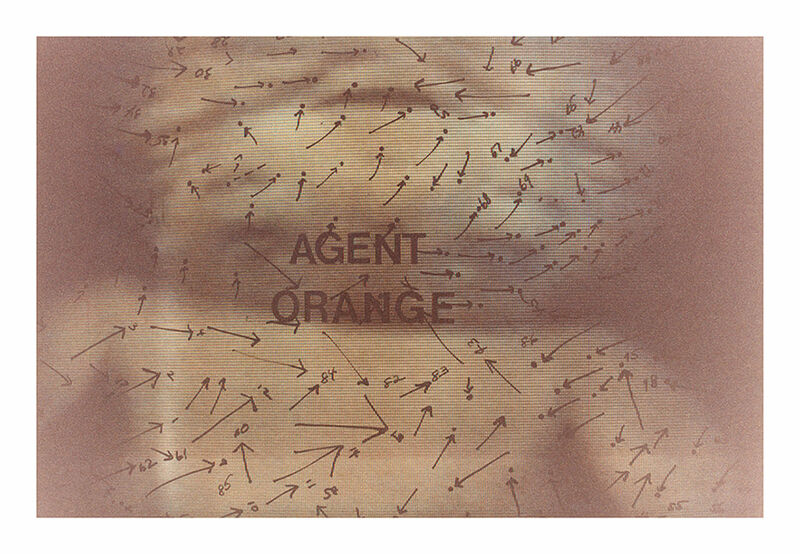 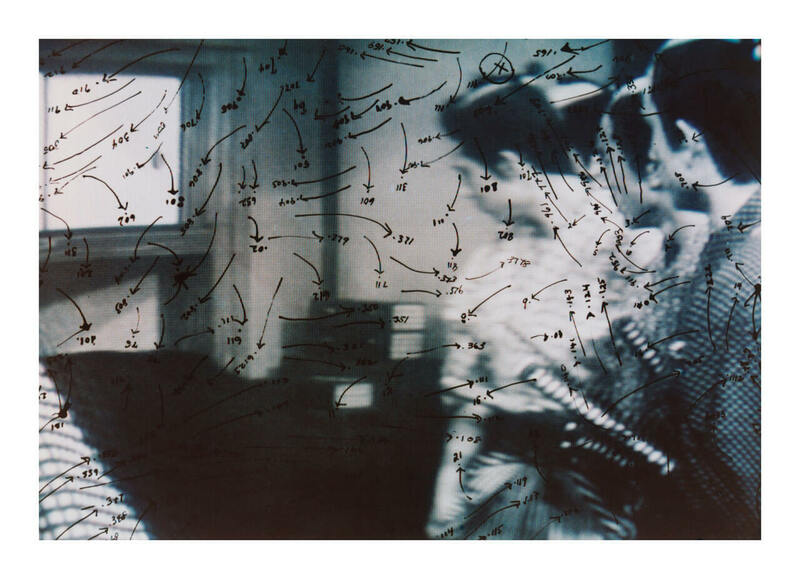 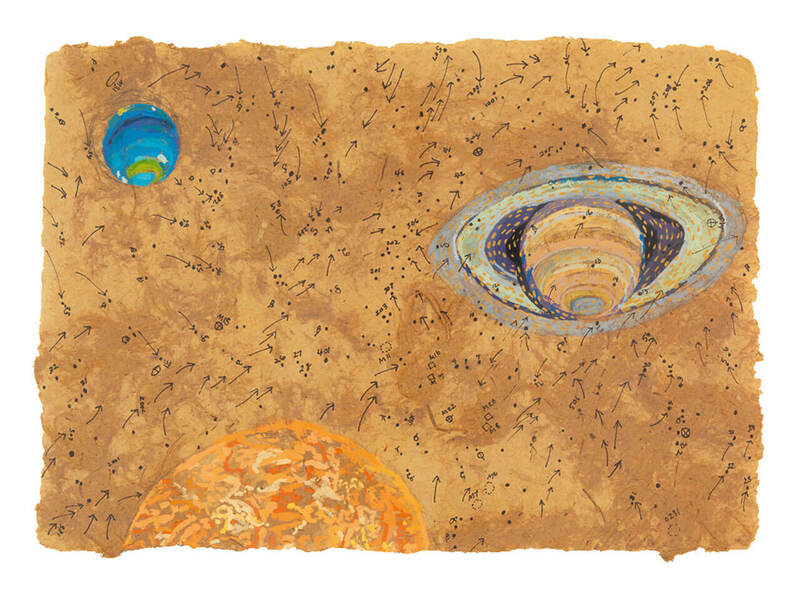 Memory: Future (detail), 1980–81. 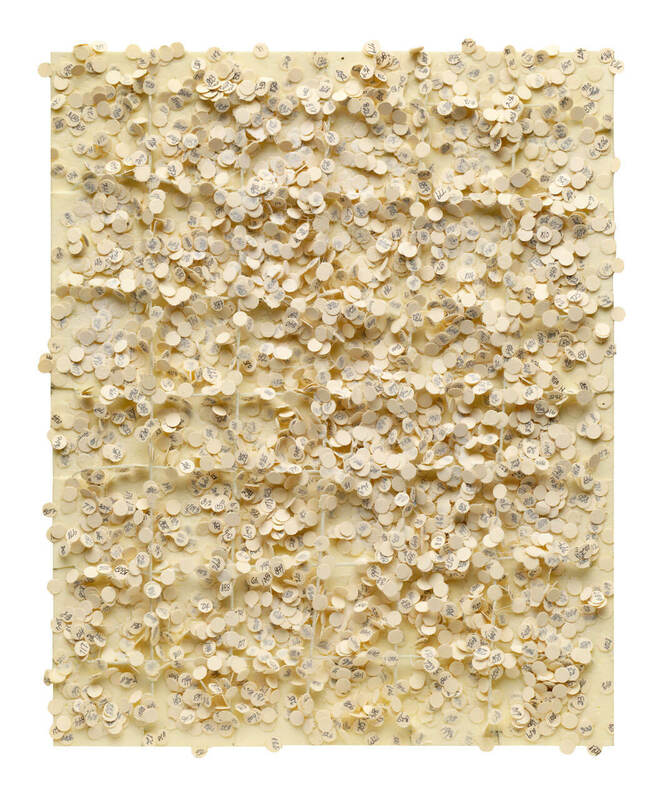 Mixed media on canvas; 83 x 116 1/2 in. 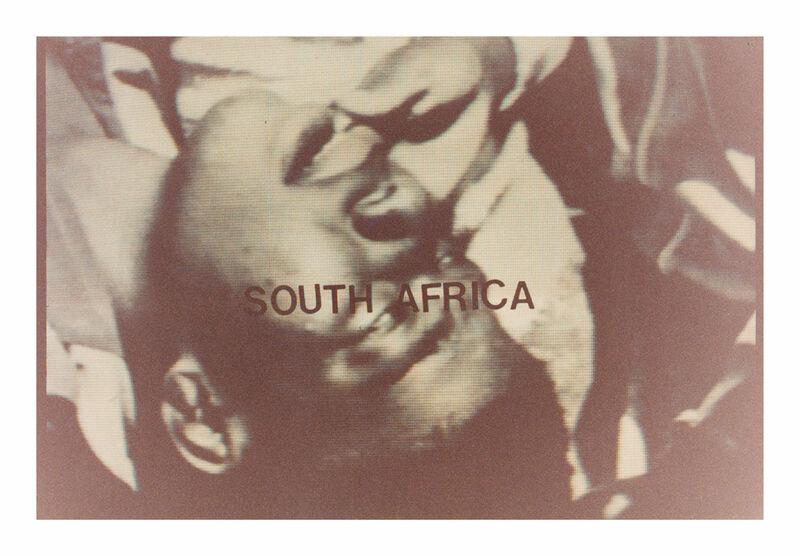 Separate But Equal Genocide: Apartheid, 1990–91. 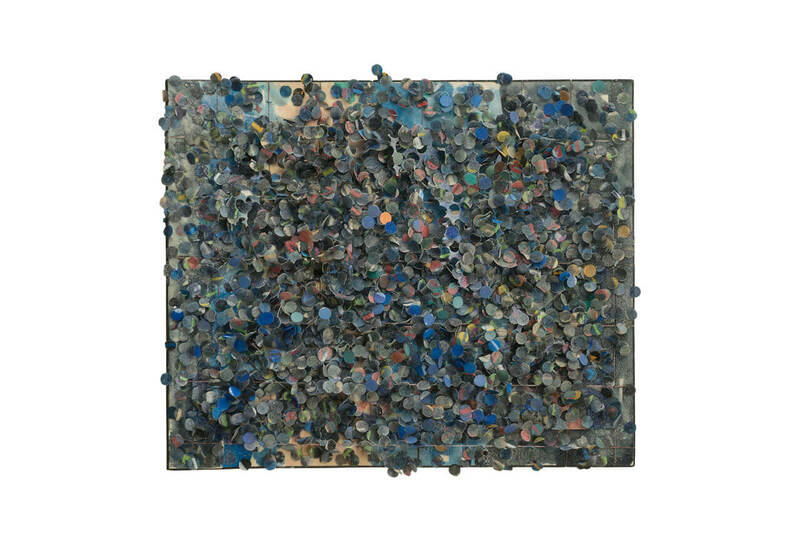 Mixed media; 24 x 21 1/2 in. 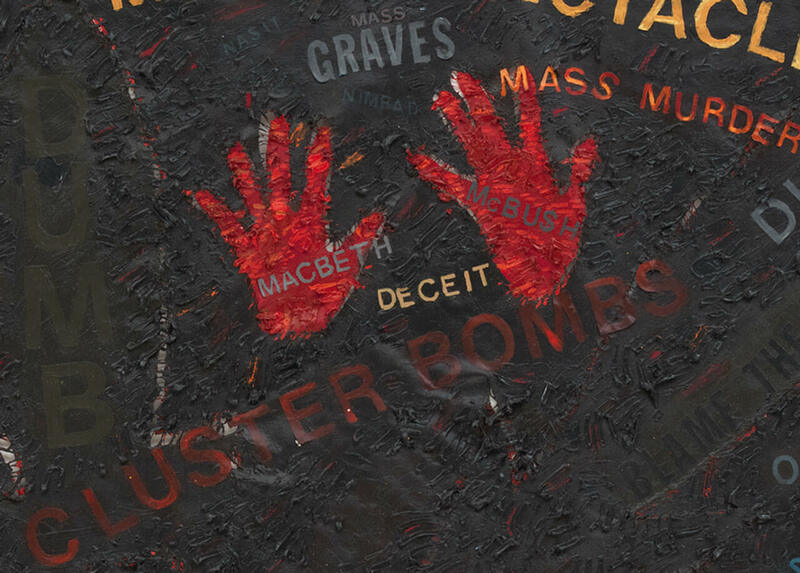 “Till Birnam Wood Remove to Dunsinane” (Macbeth, Act 5, Scene 3) (detail), 1991. 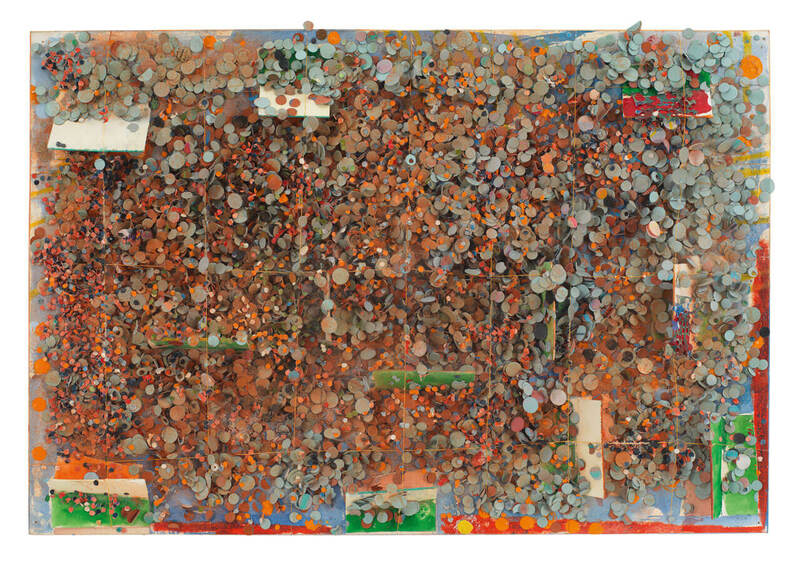 Mixed media on canvas; 51 x 88 in. 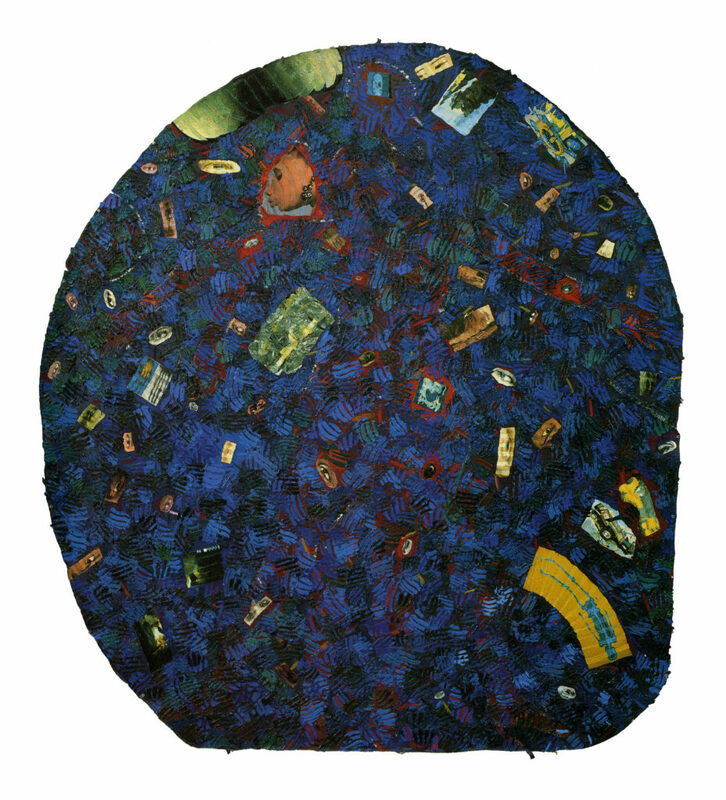 Columbus, 1991–92. 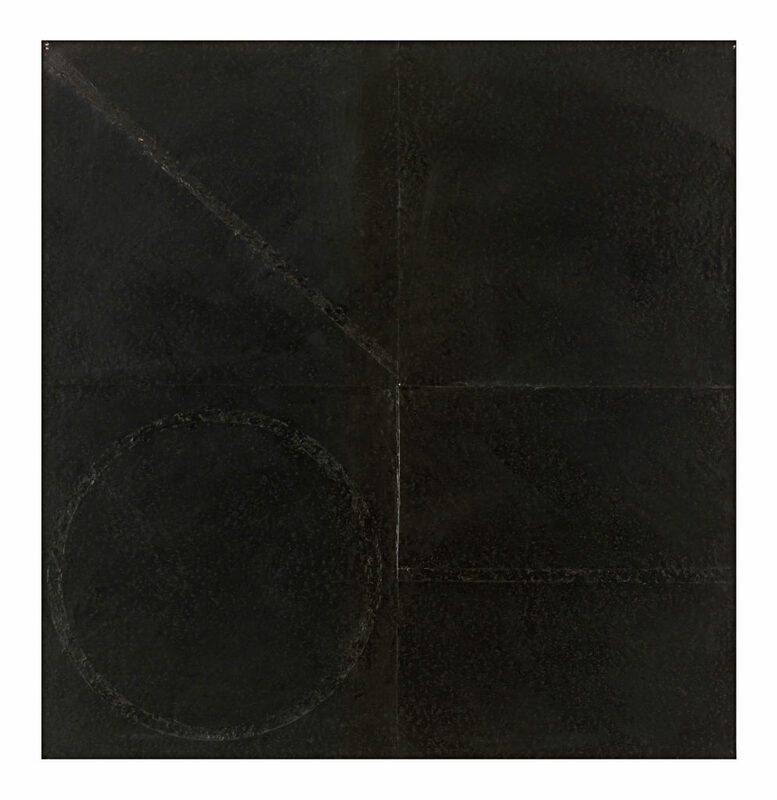 Mixed media on canvas; 88 x 97 in. 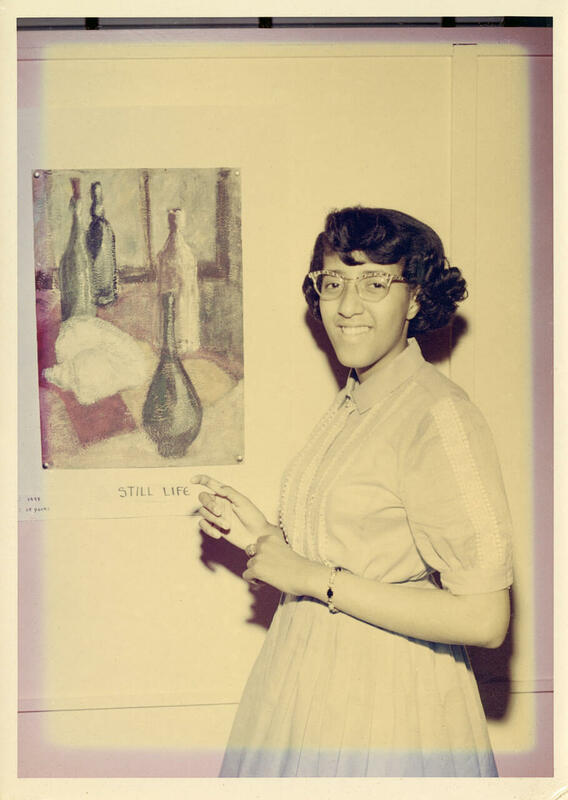 Howardena Pindell with her class at the Stockholm Institute, Sweden, 1946. Howardena Pindell at her first exhibition, Faith Presbyterian Church, Philadelphia, January 1958. 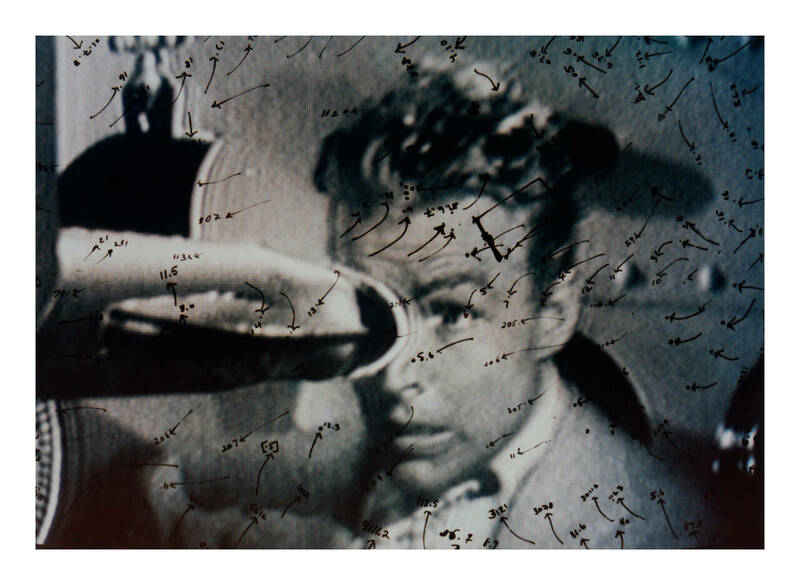 Photo: Howard Wells. 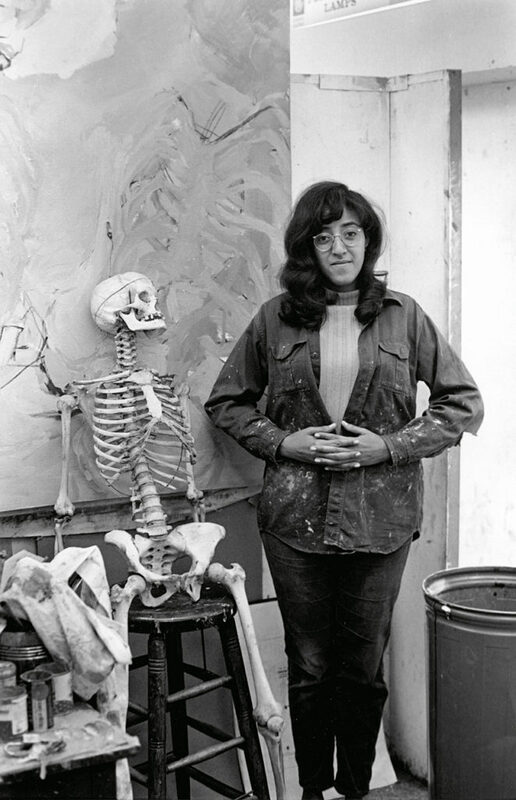 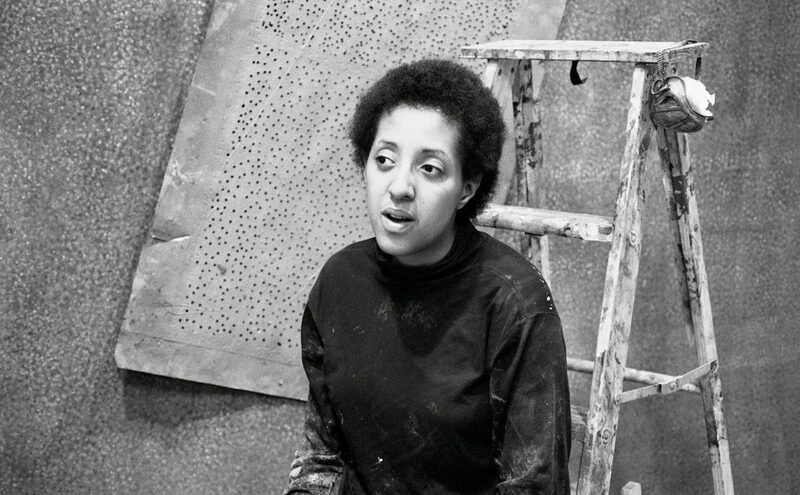 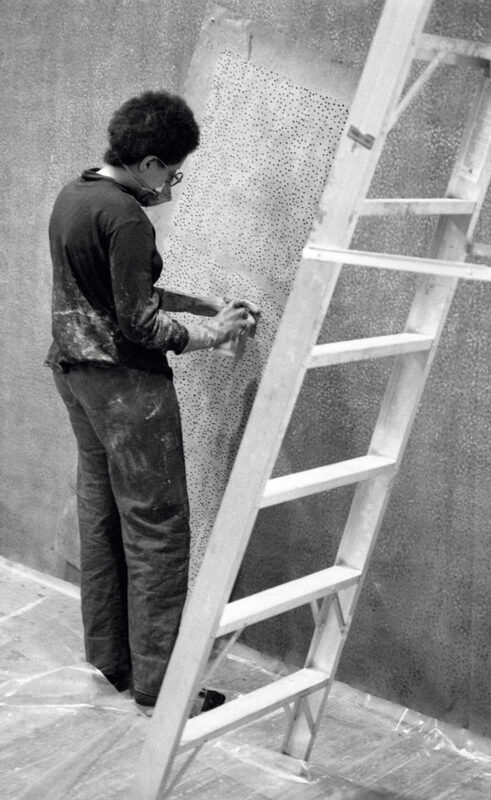 Howardena Pindell in her studio at Yale University School of Art and Architecture, 1966. 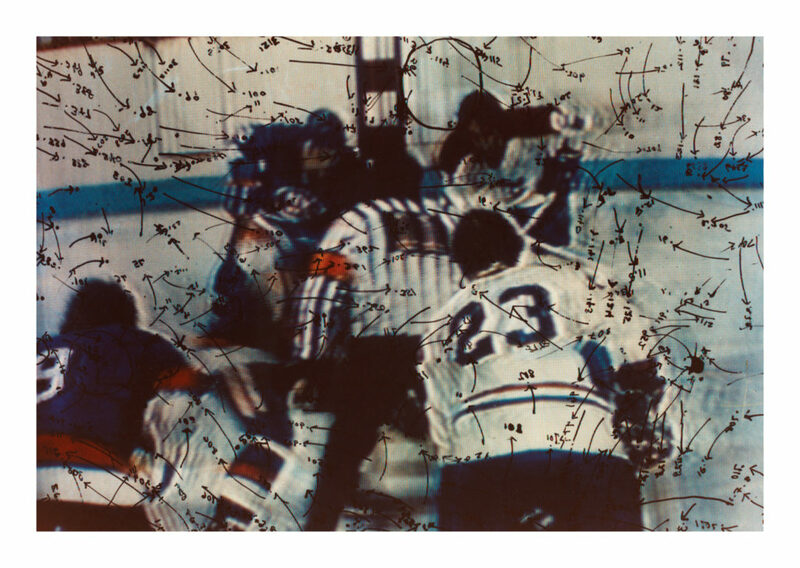 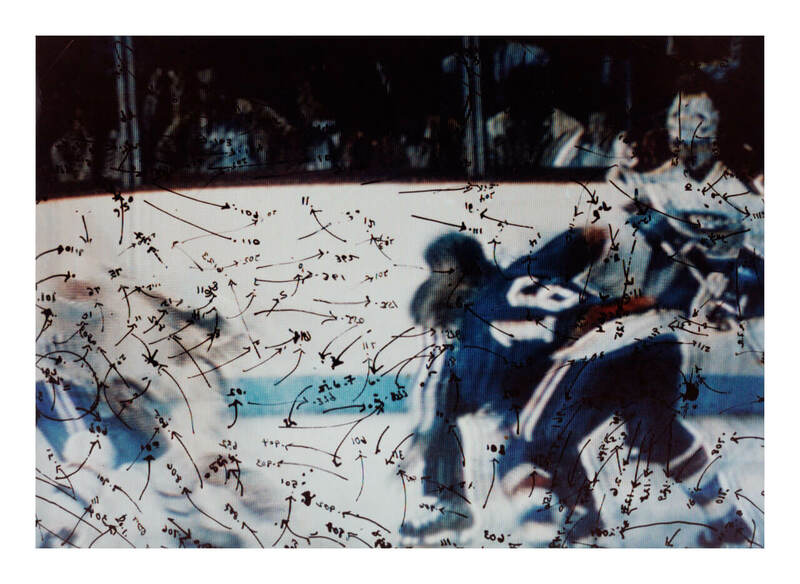 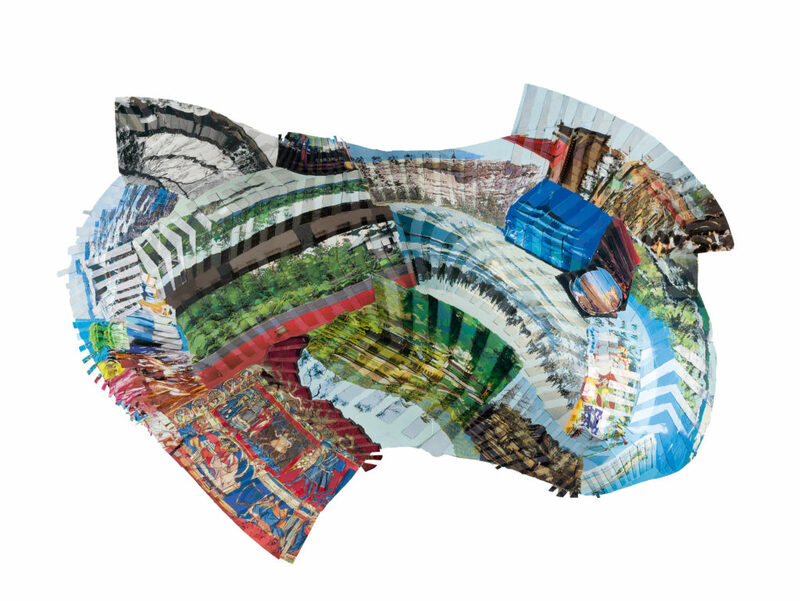 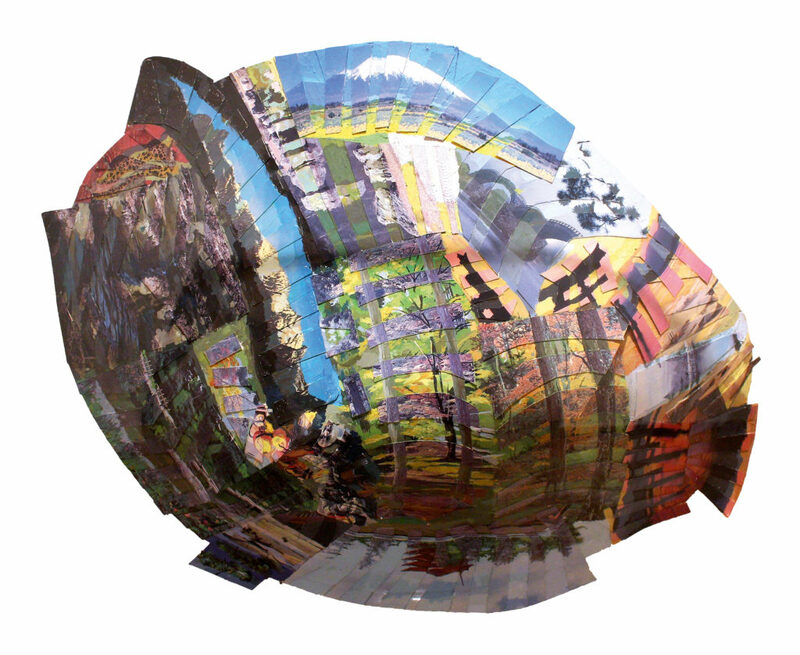 Photo courtesy the artist and Garth Greenan Gallery, New York. 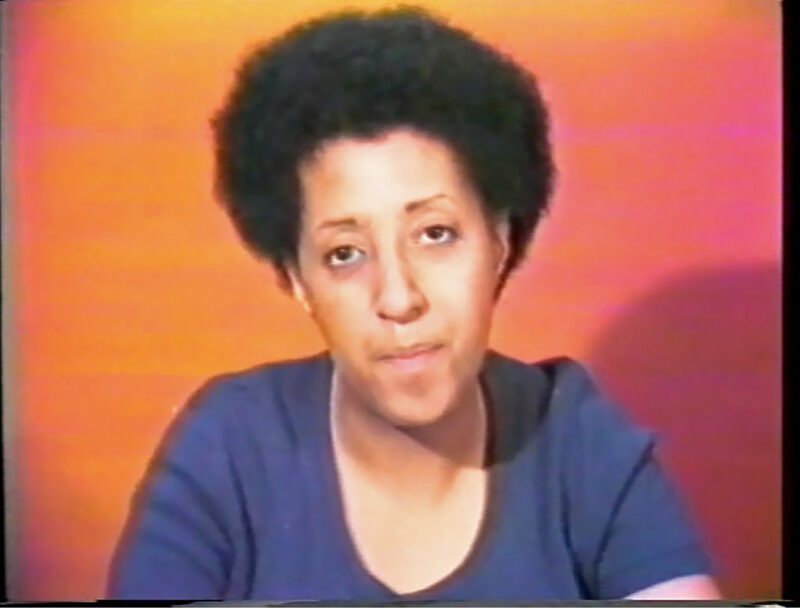 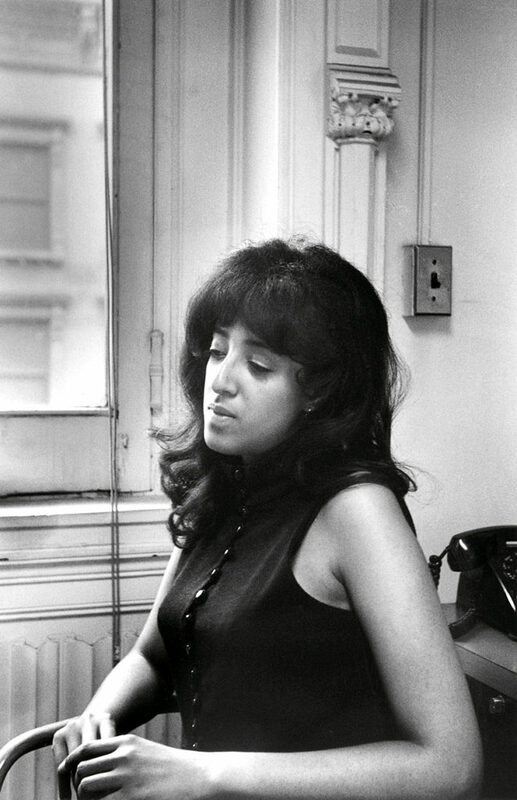 Howardena Pindell in her office at the Museum of Modern Art, 1967. 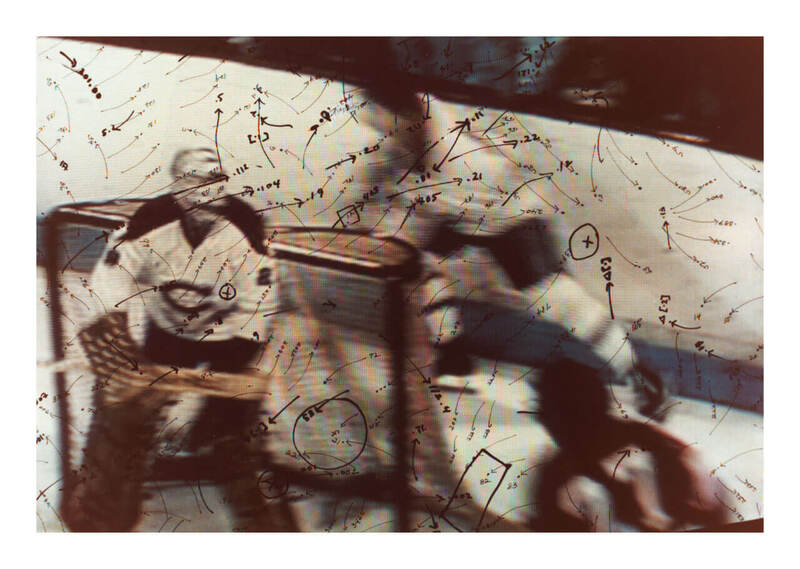 Photo courtesy the artist and Garth Greenan Gallery, New York. 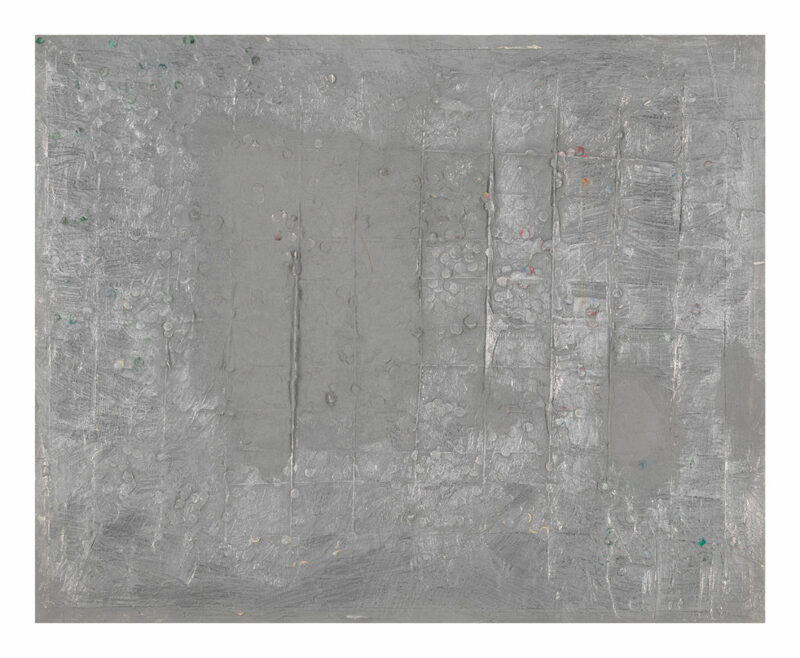 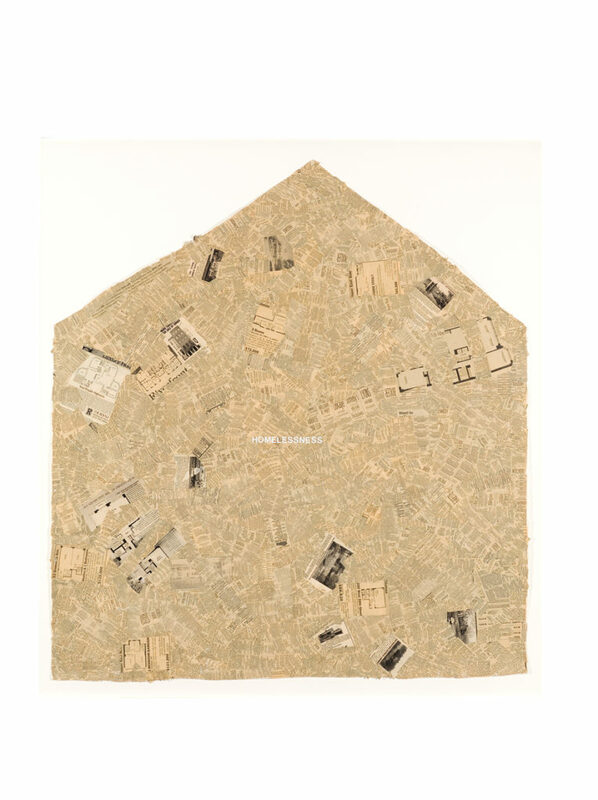 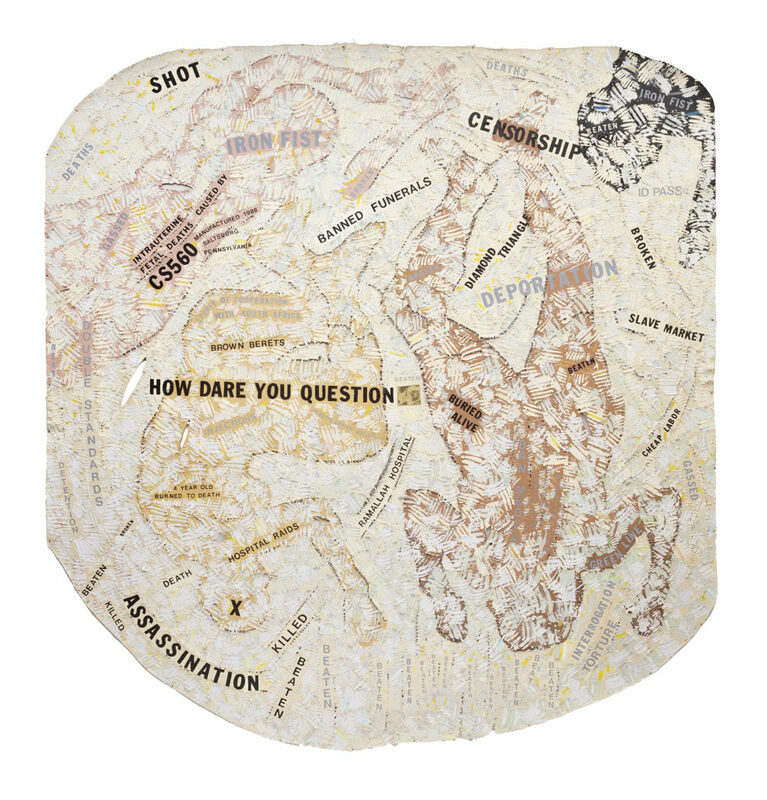 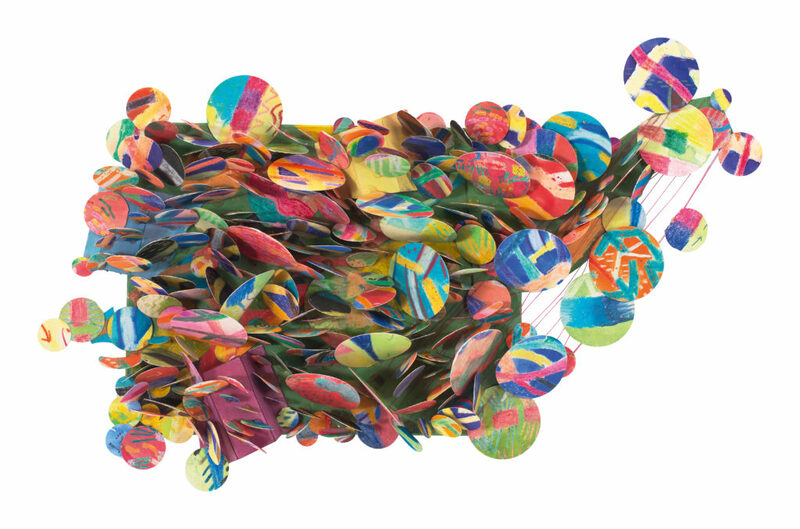 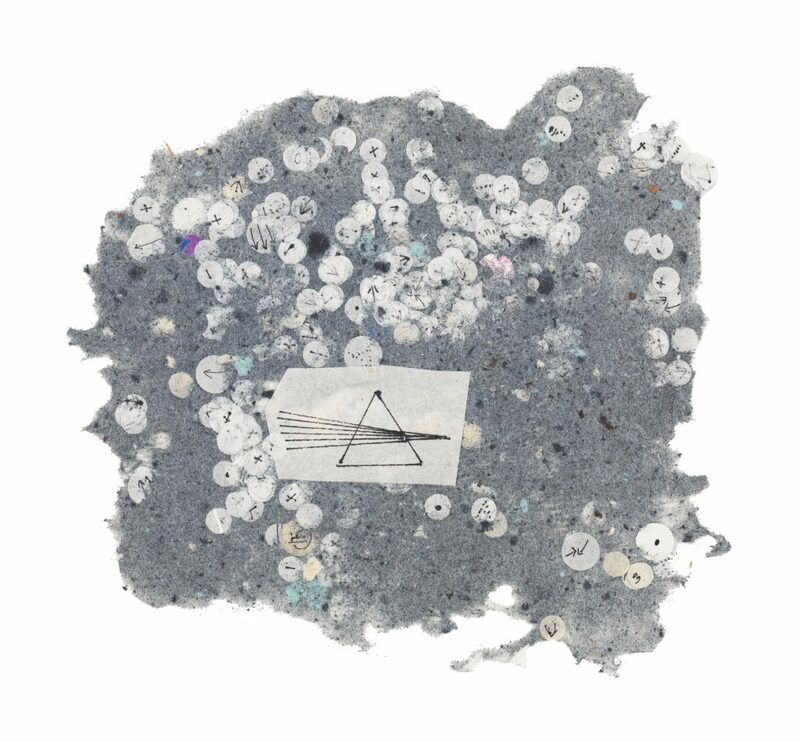 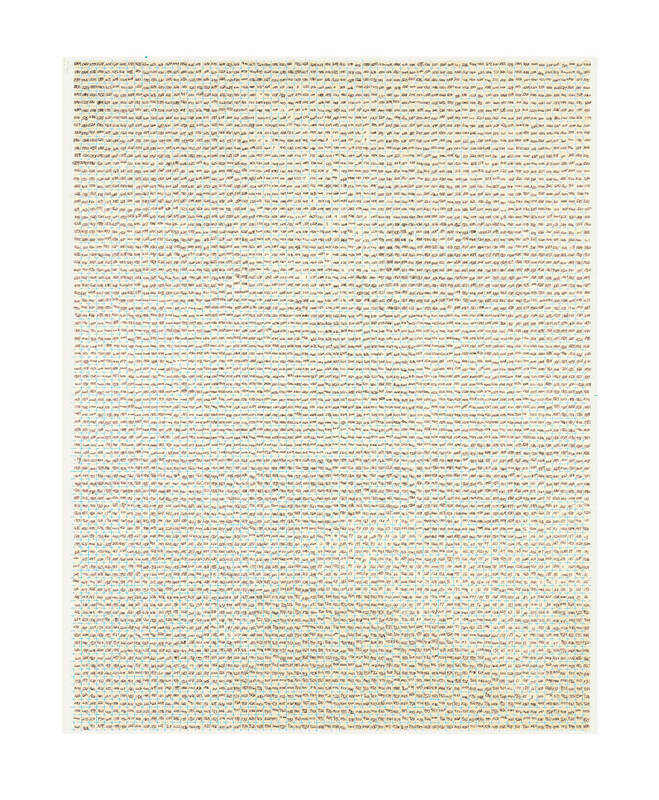 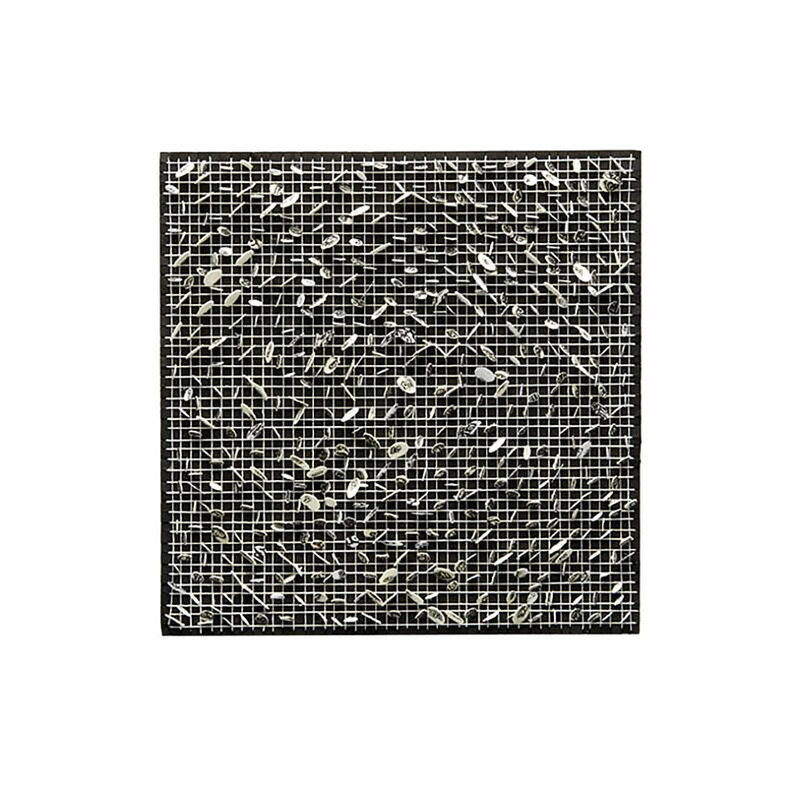 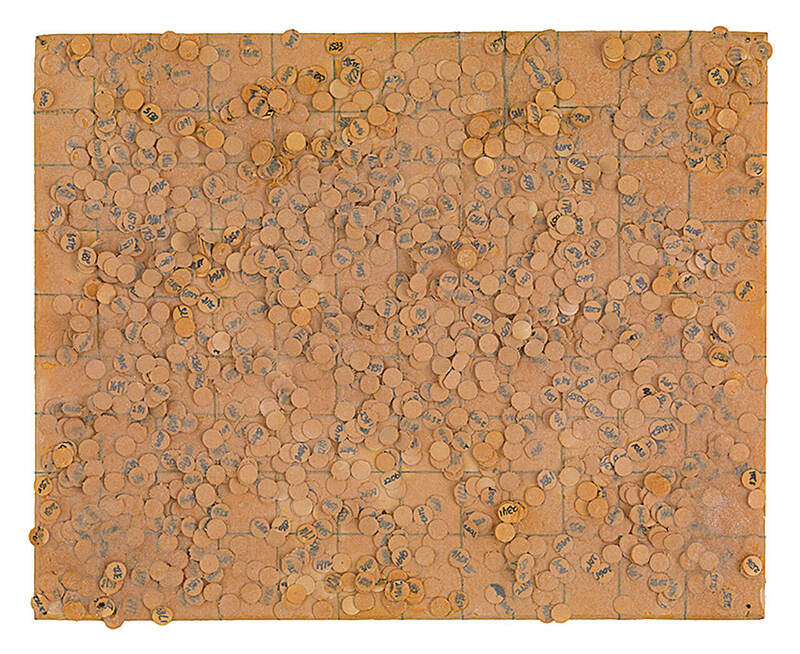 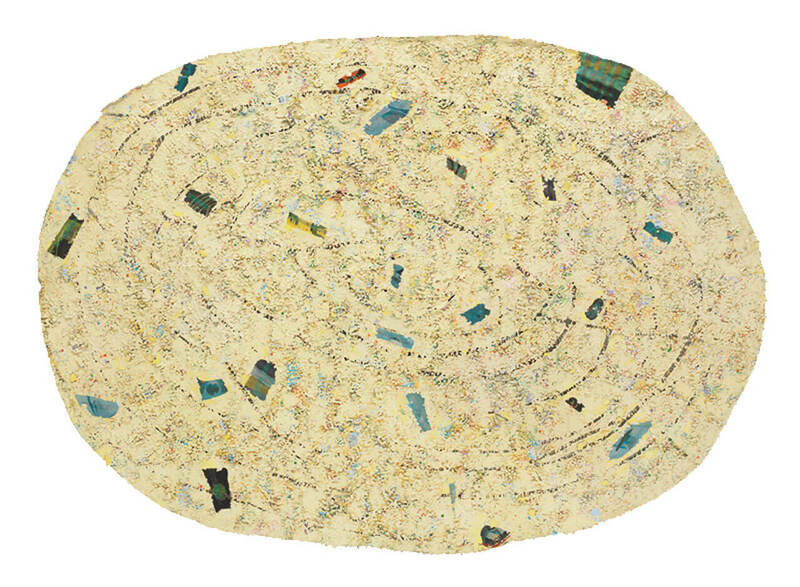 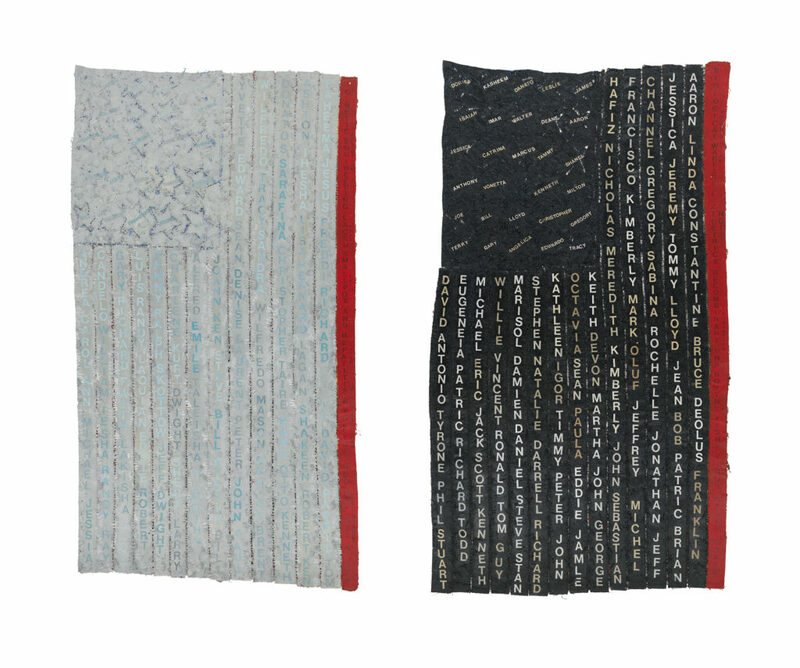 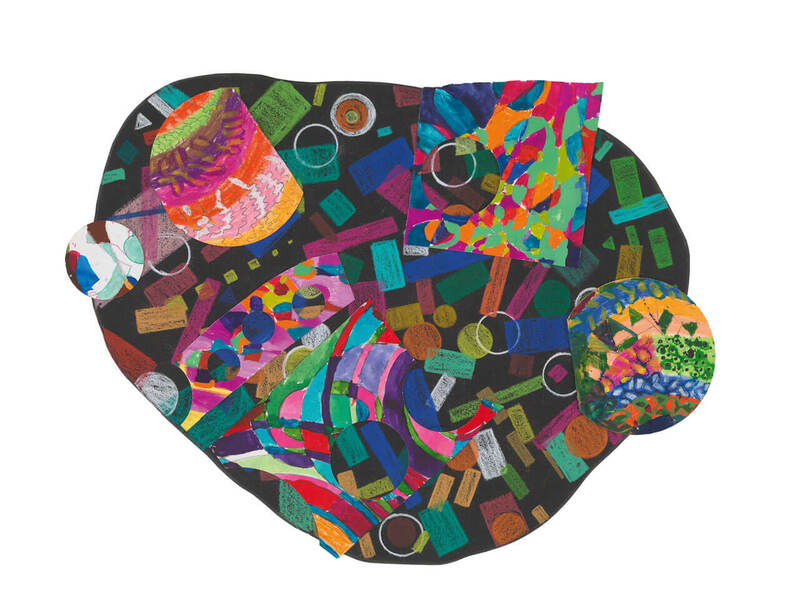 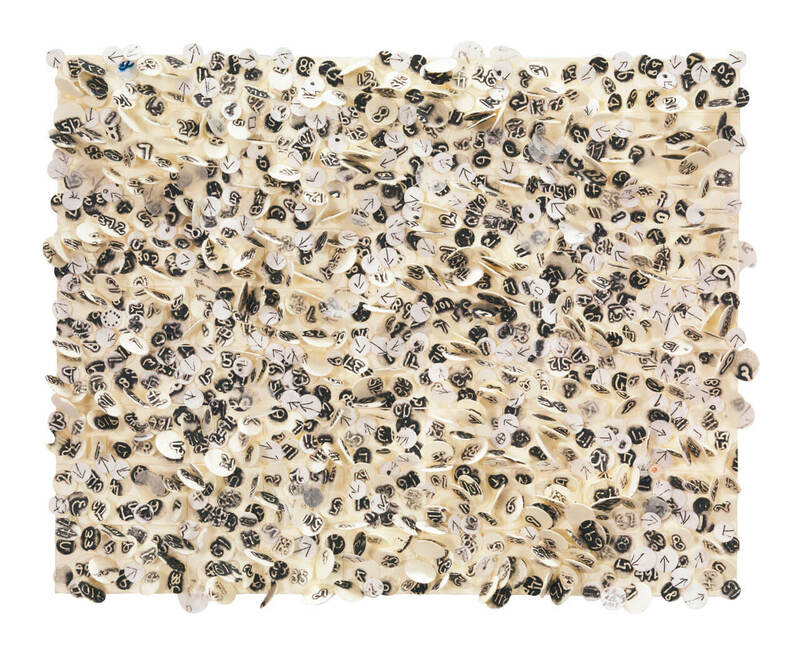 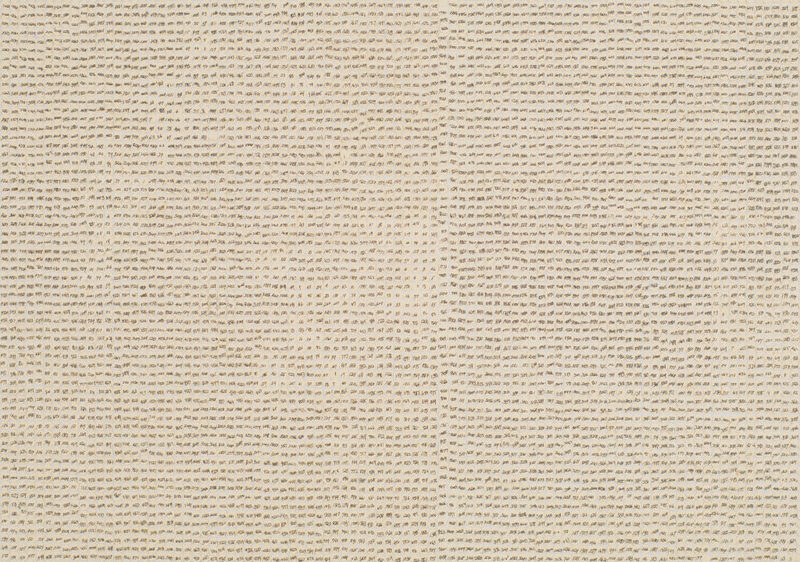 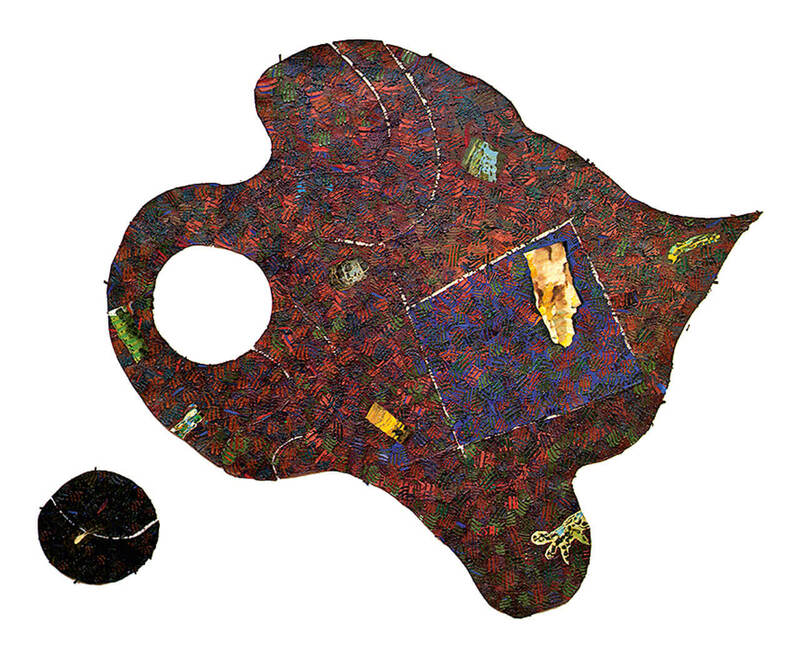 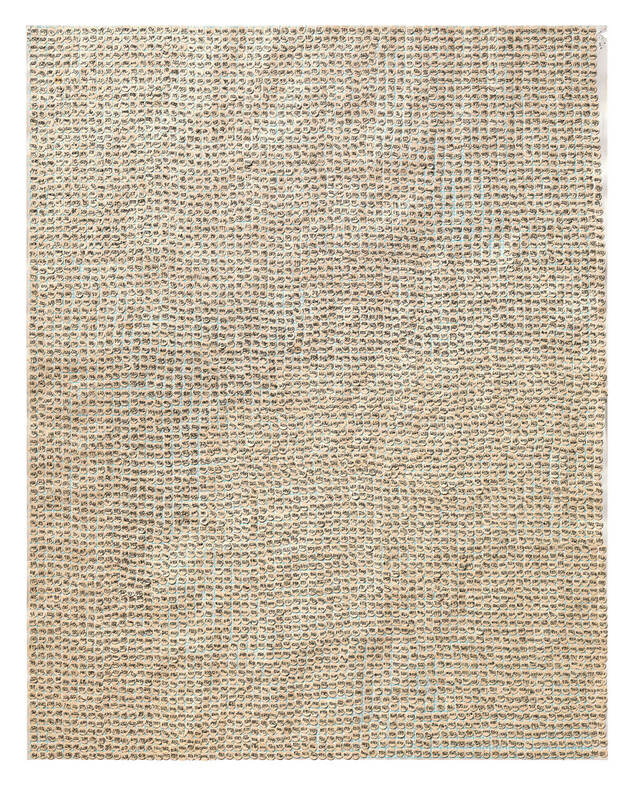 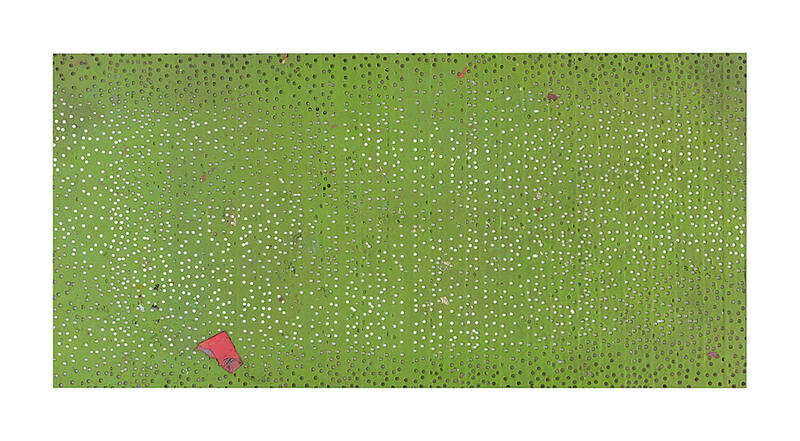 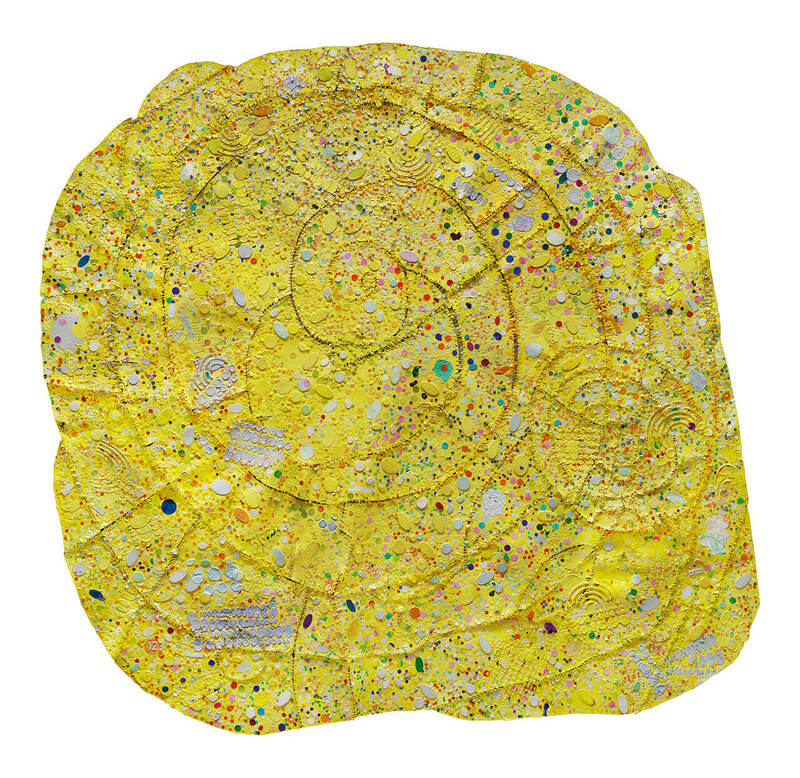 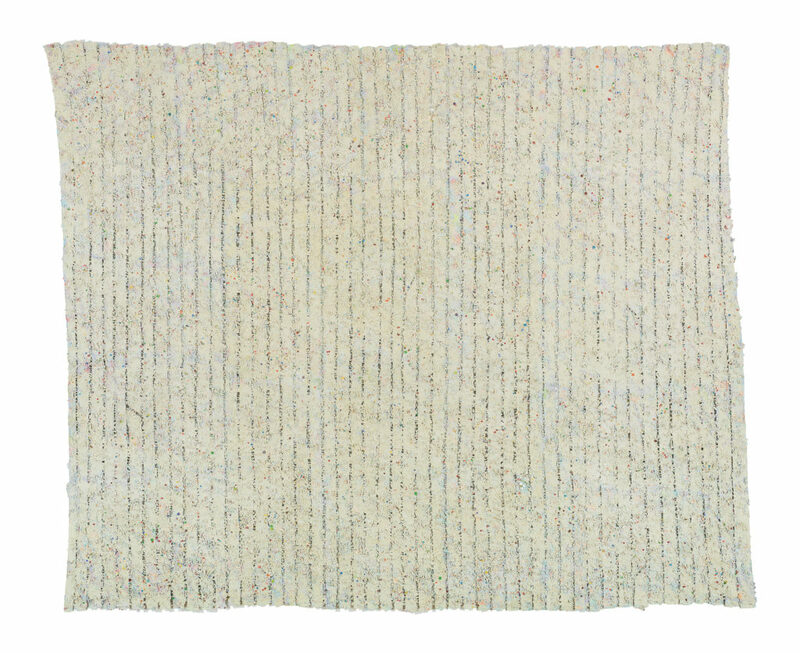 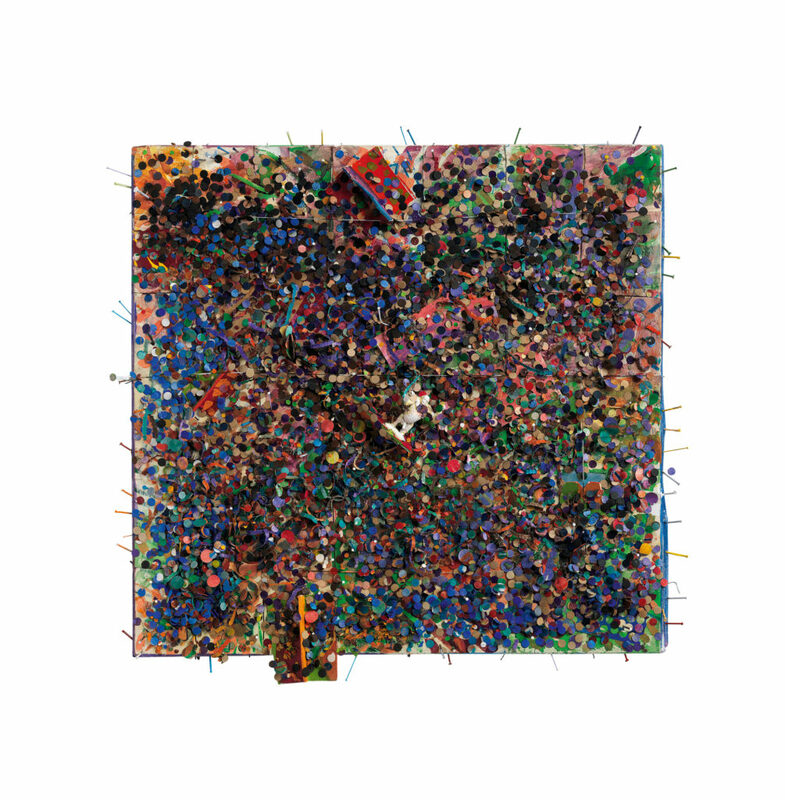 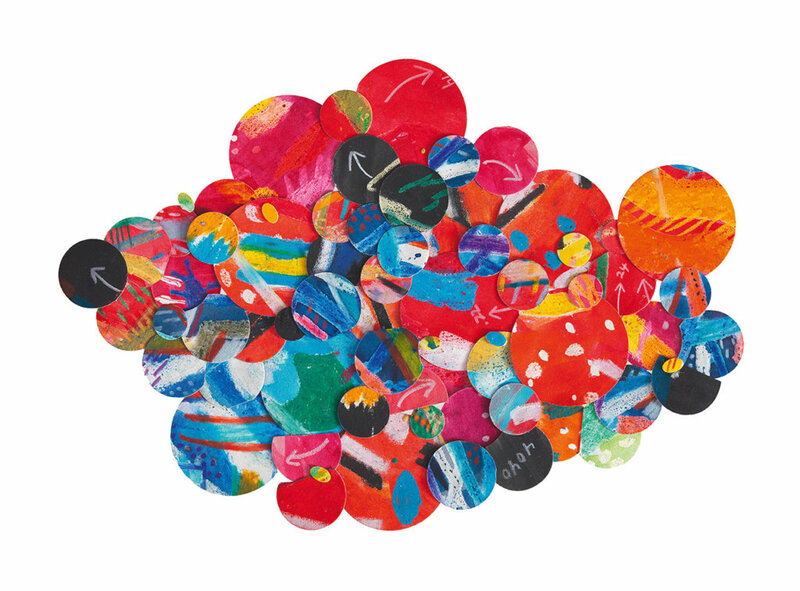 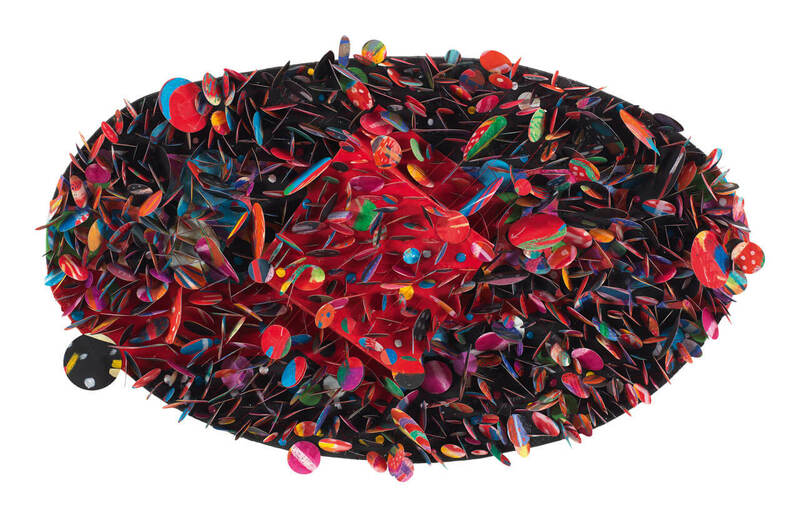 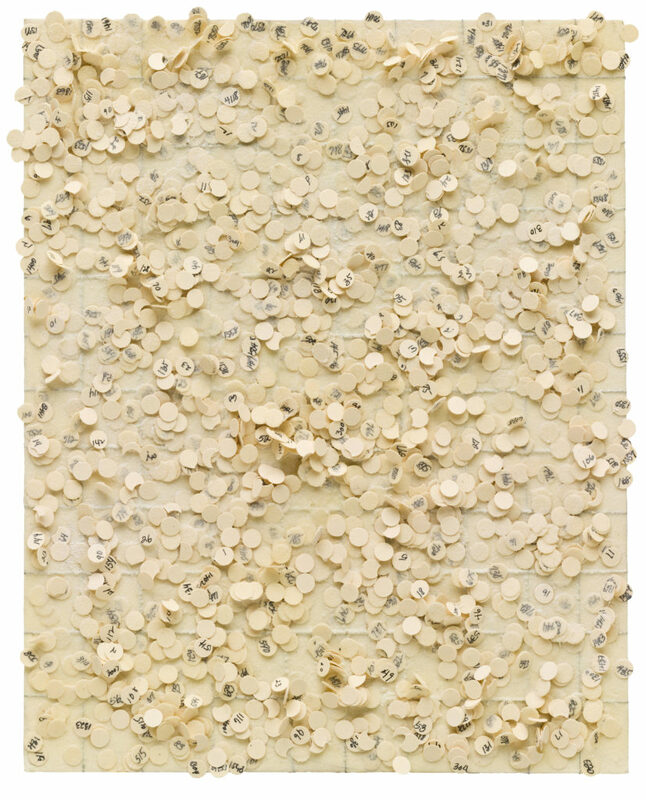 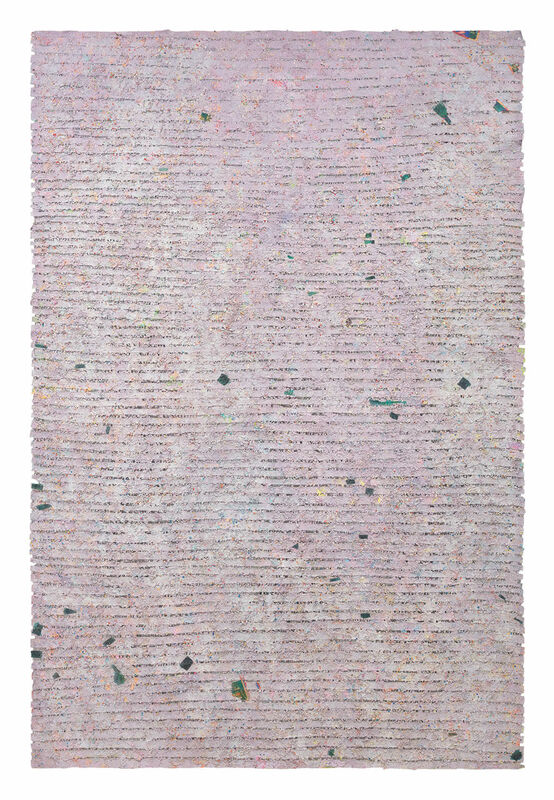 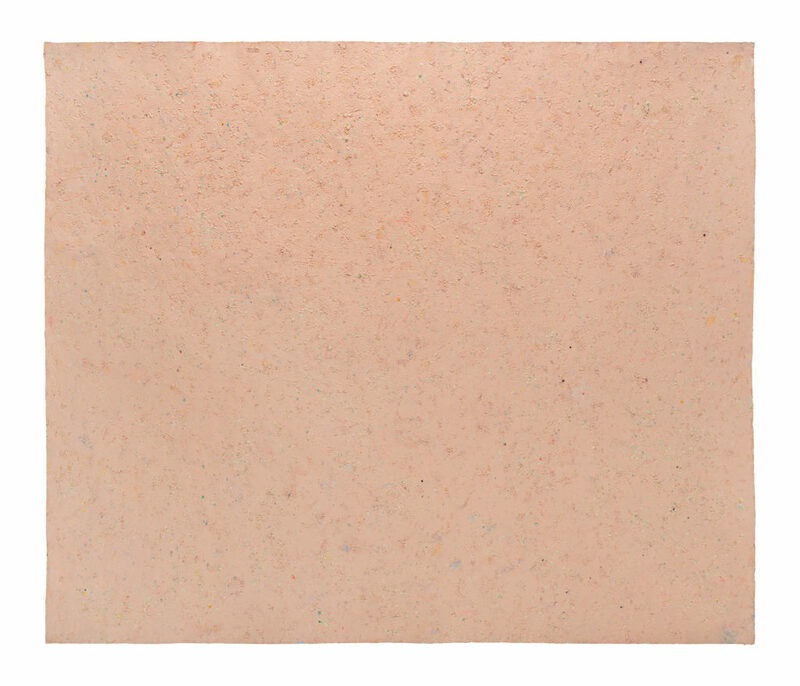 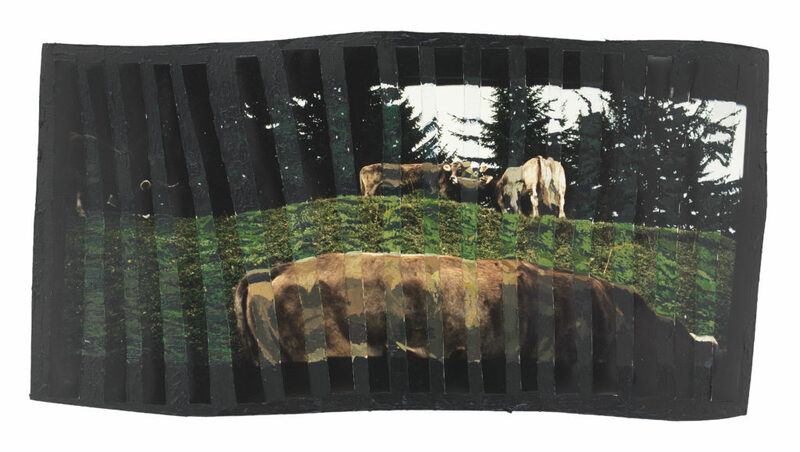 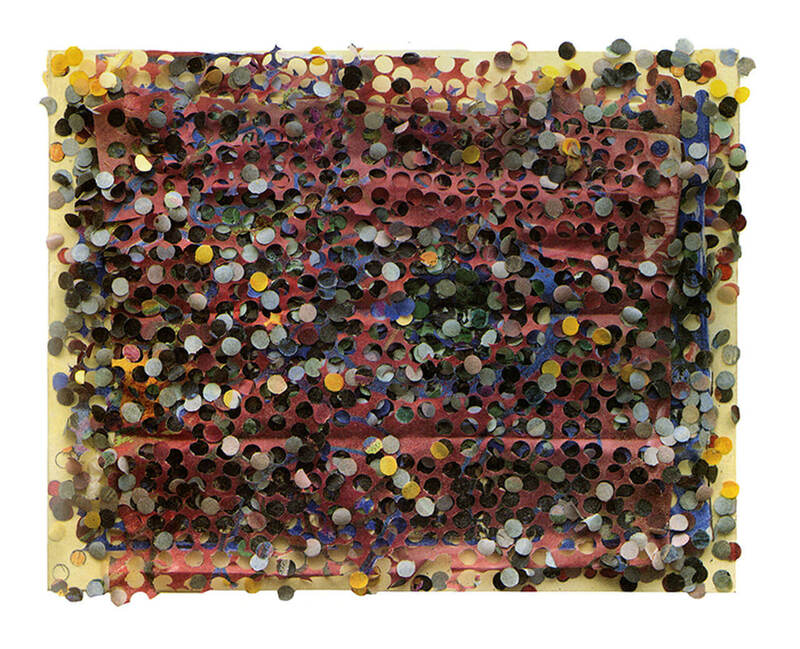 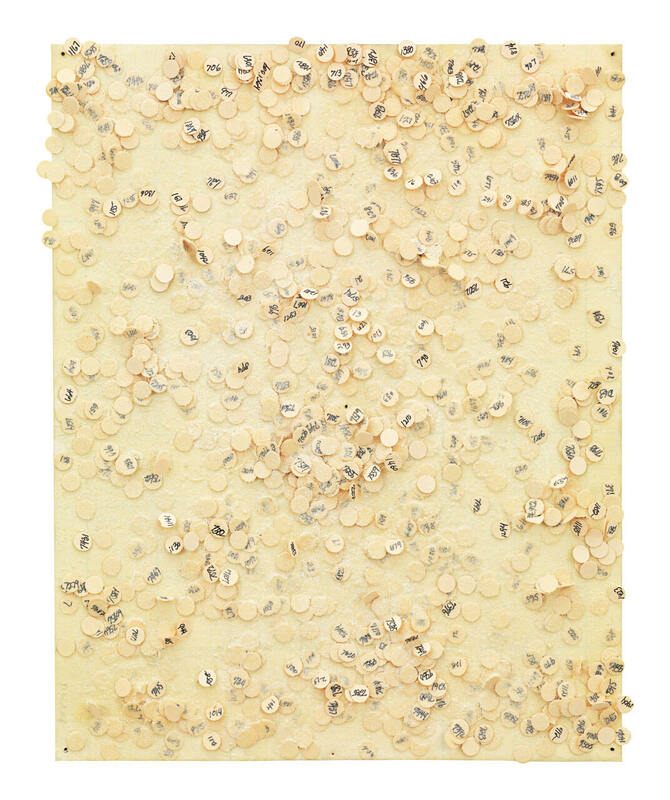 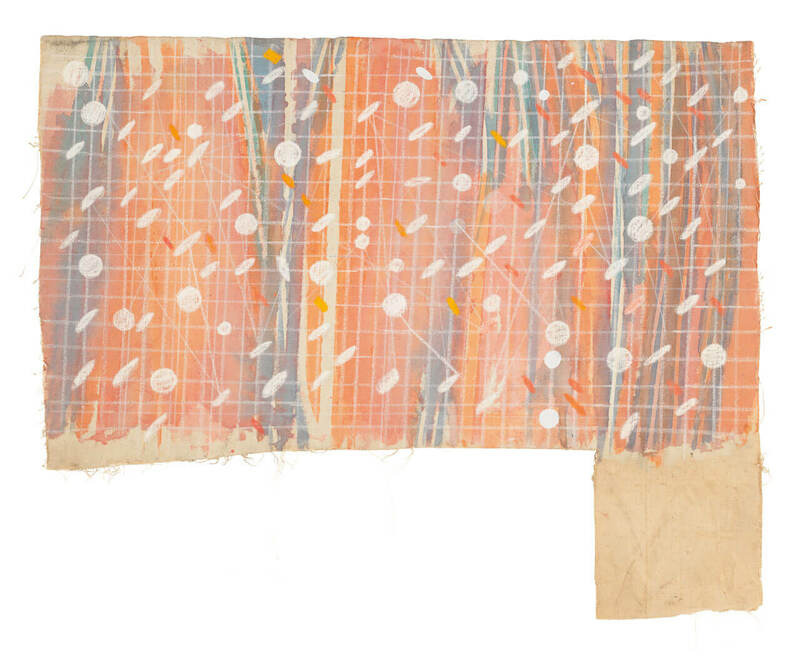 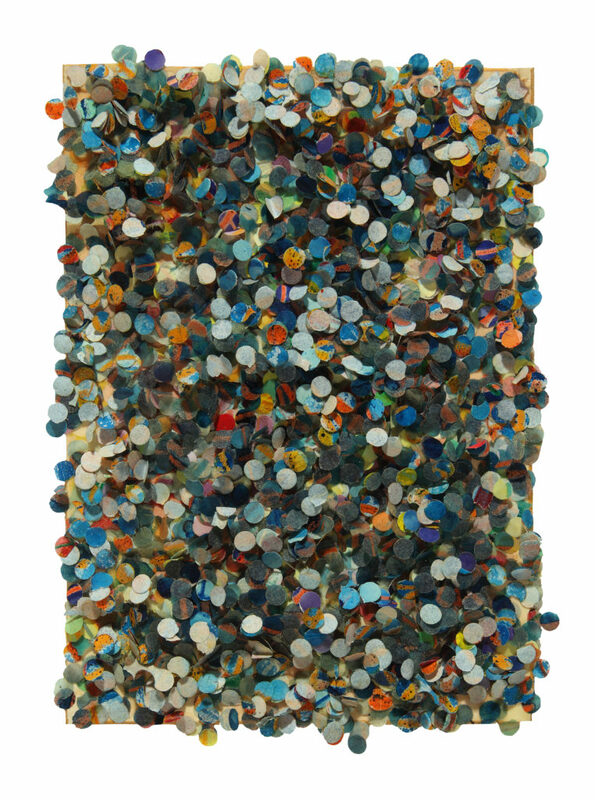 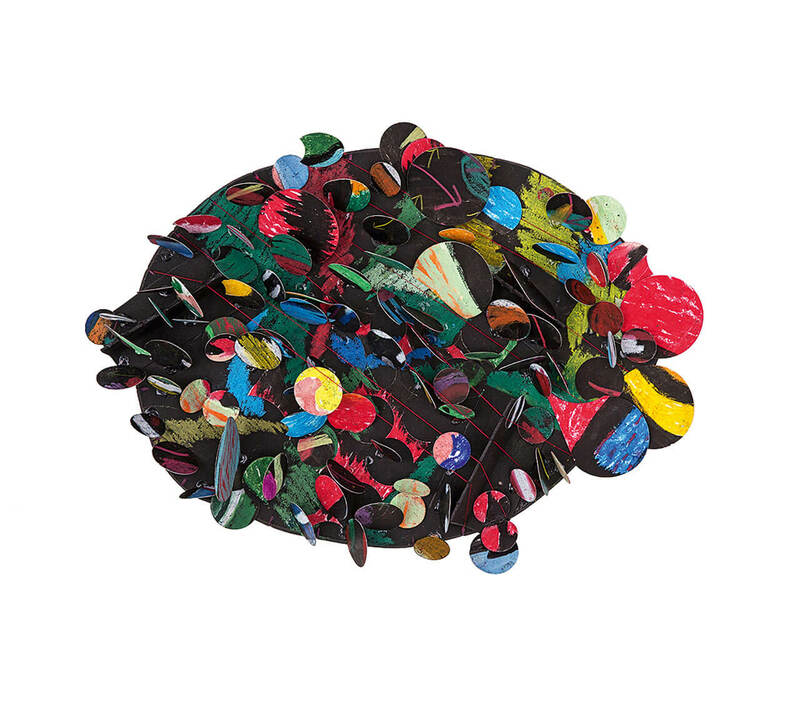 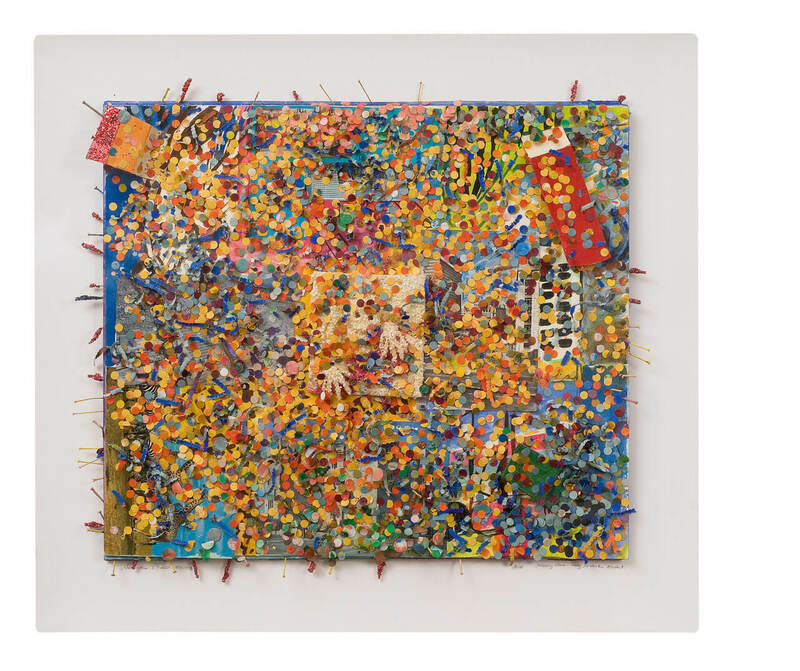 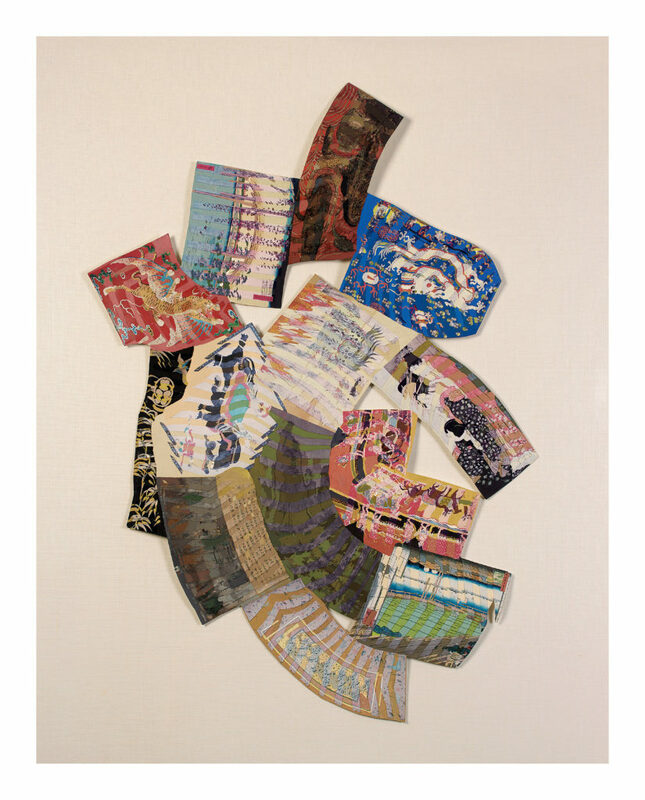 Untitled, 1968–70 (mixed-media assemblage, acrylic paint, canvas, grommets, and stuffing; 144 x 144 in. 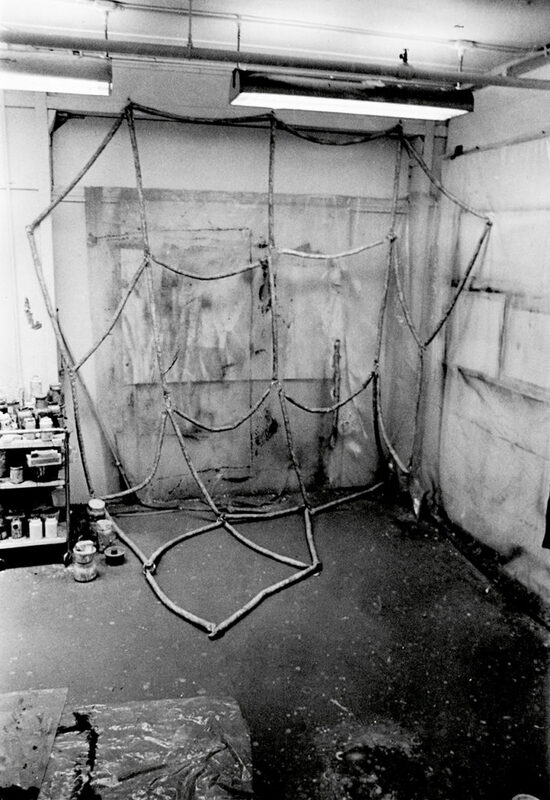 ), in Pindell’s studio at Westbeth Artists Housing, New York, c. 1970. 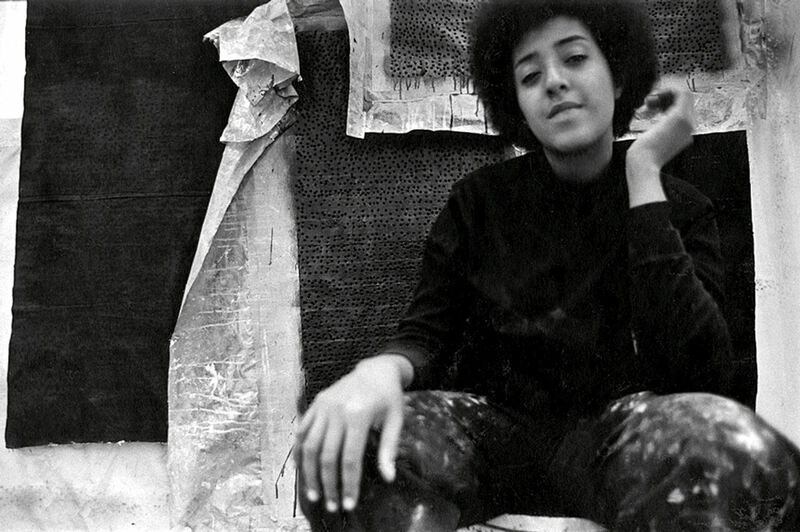 Amy Stromson, Howardena Pindell in her loft at 322 Seventh Ave, New York, c. 1970–71. 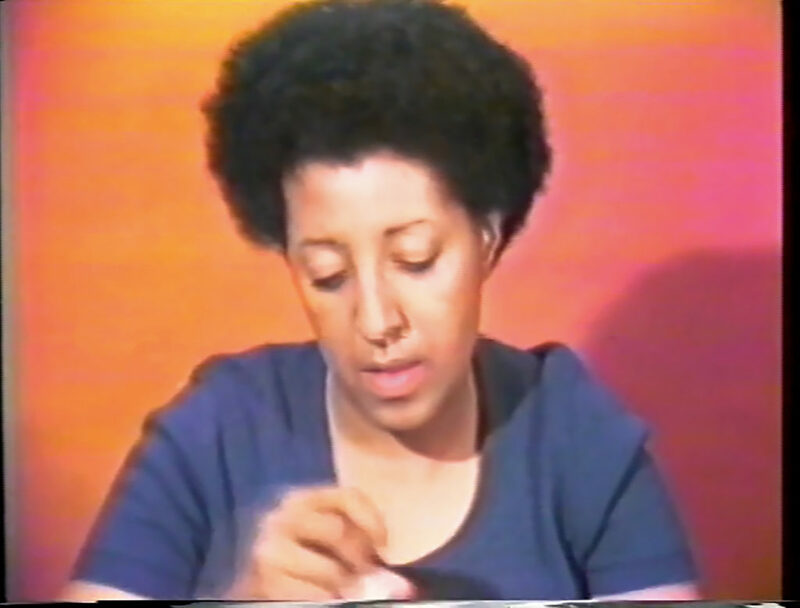 Howardena Pindell in her studio at Westbeth Artists Housing, New York, c. 1970–71. 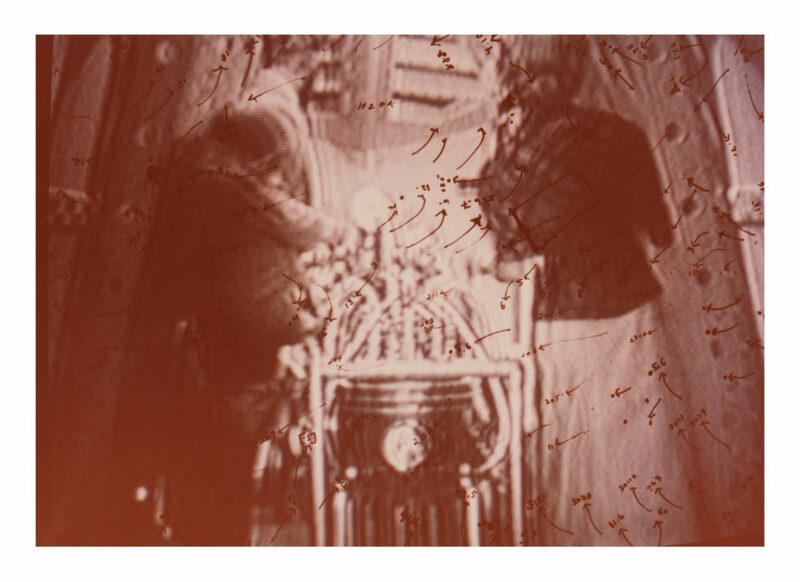 Photo: Howard Wells. Howardena Pindell in her loft at 322 Seventh Avenue, New York, c. 1970–71. 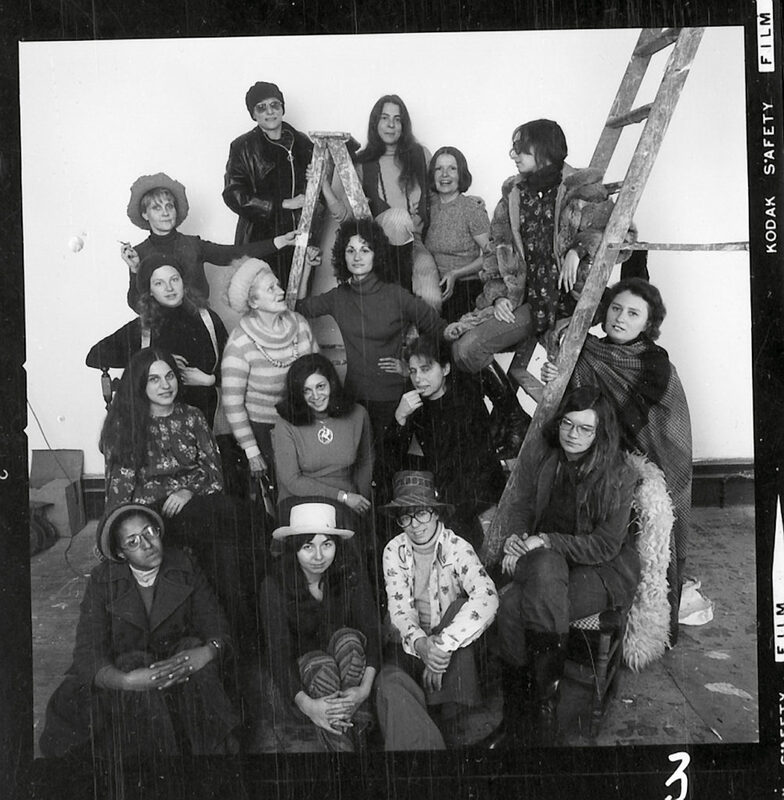 Photo: Amy Stromson. Art Workers’ Coalition protest at the Whitney Museum of American Art, 1971, showing Michele Wallace (center) and Faith Ringgold (right). 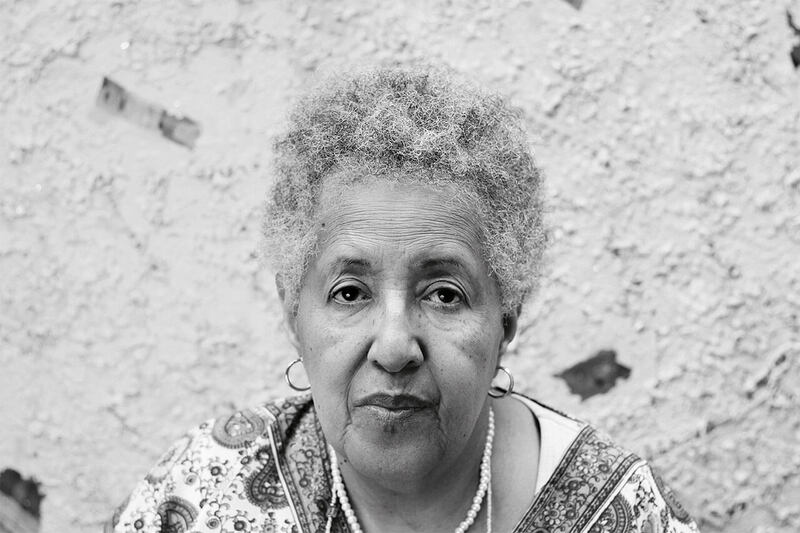 Photo: Jan van Raay. 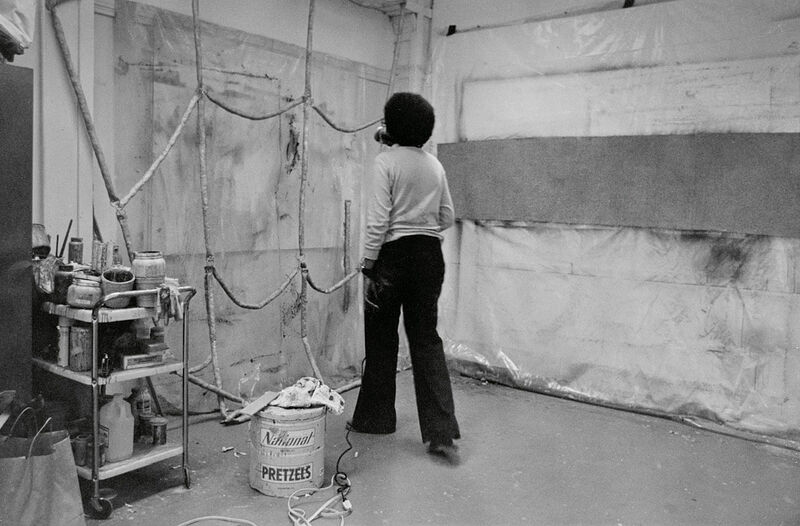 Howardena Pindell in her studio, in front of hole-punched templates, c. 1972. 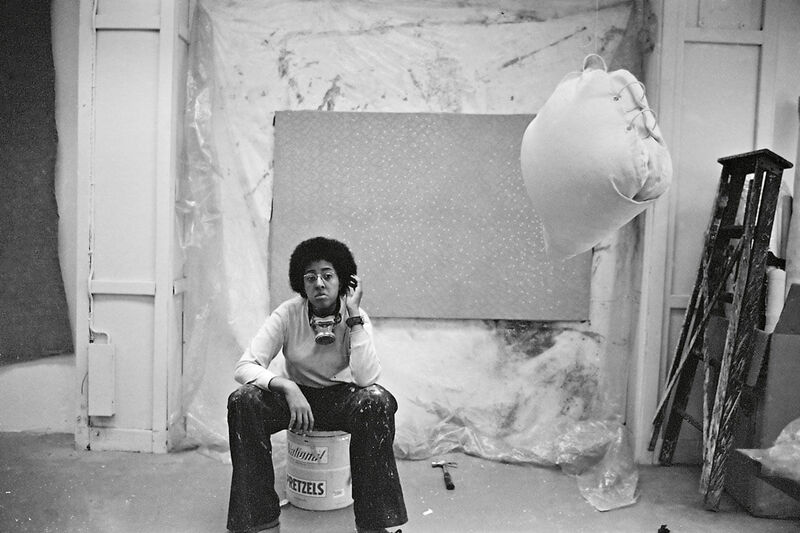 Howardena Pindell in her studio, in front of Untitled (1968–70), c. 1972. 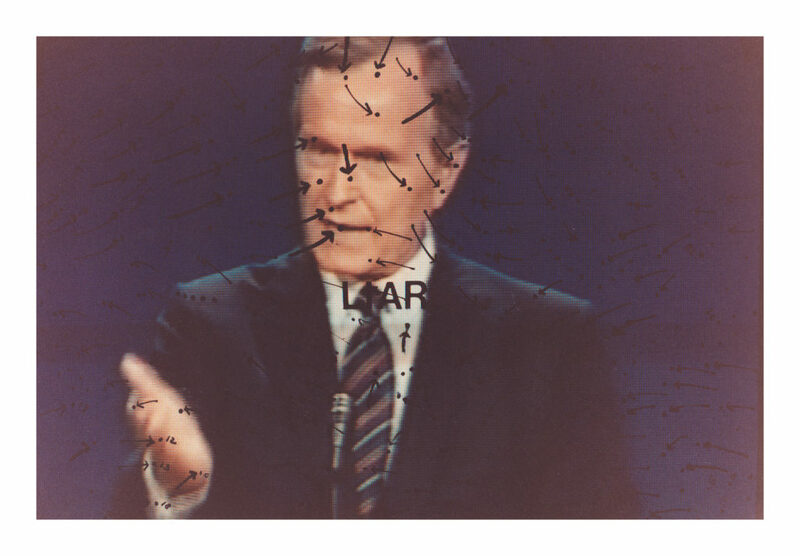 A.I.R. 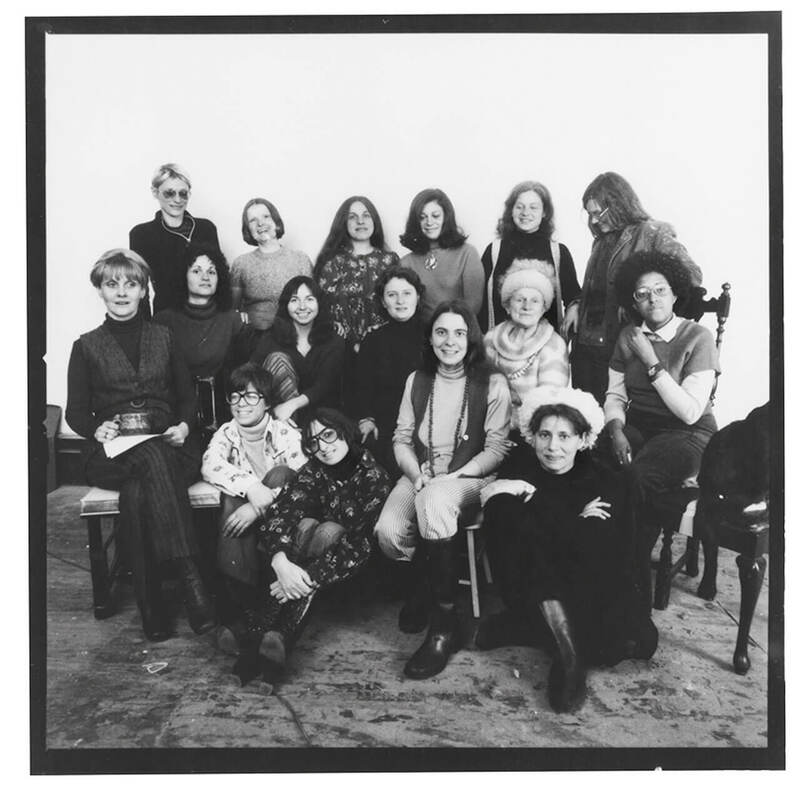 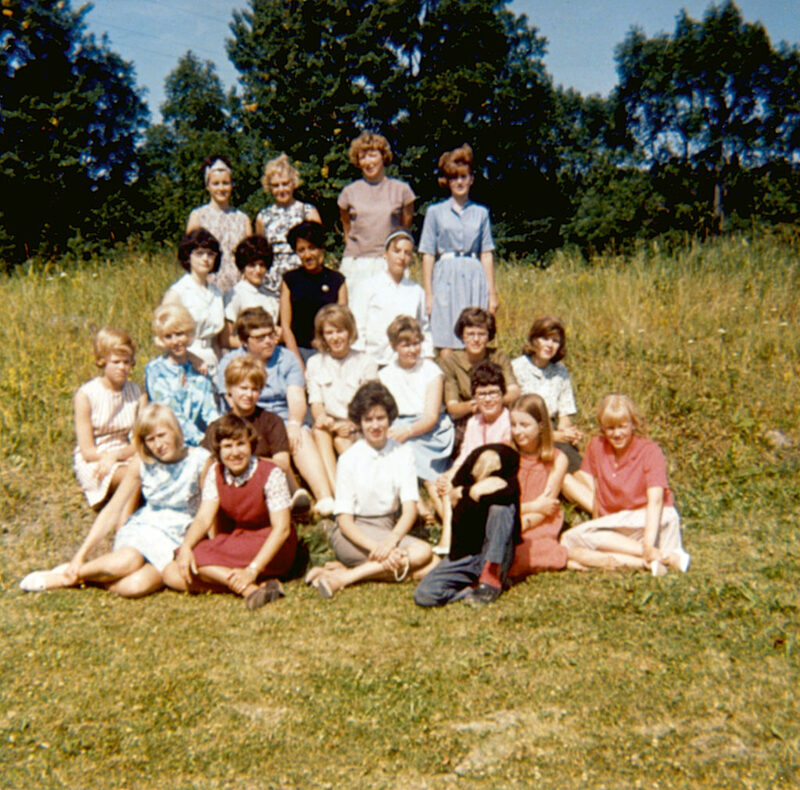 members, 1973. 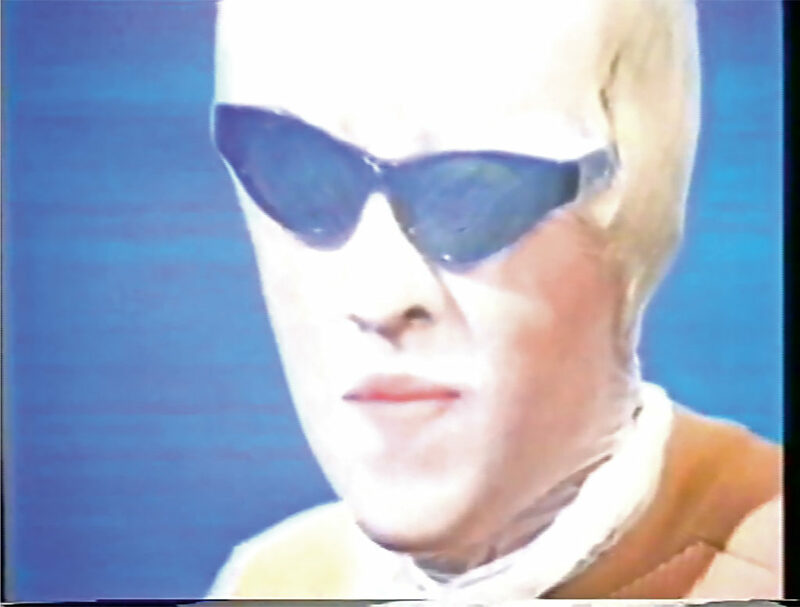 Courtesy of A.I.R. 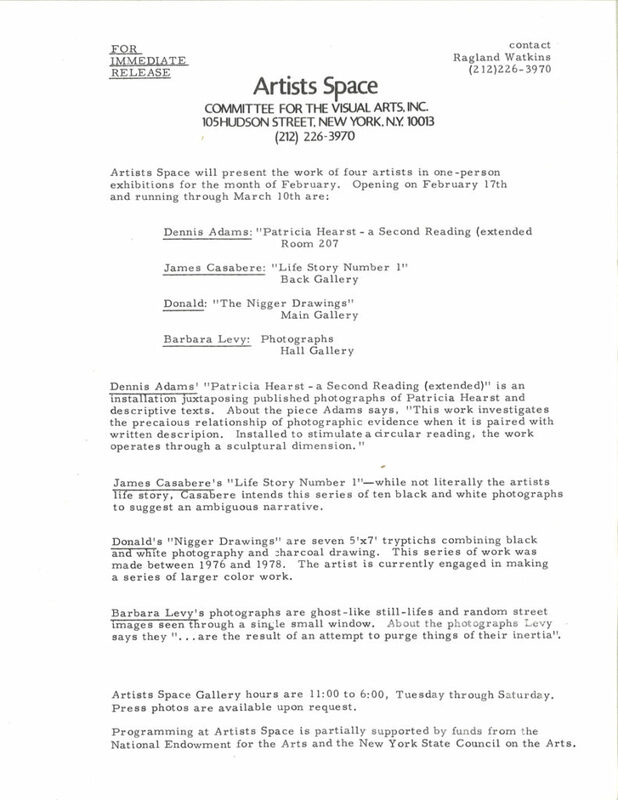 Archives, Fales Library, New York University. 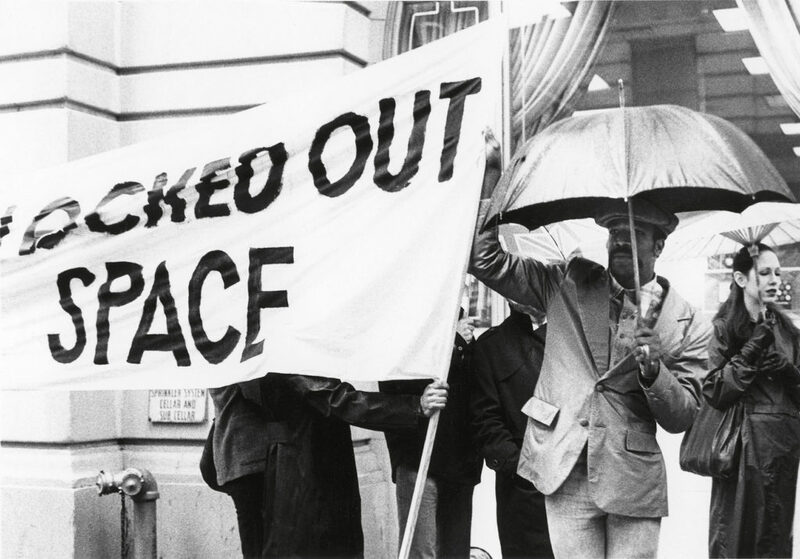 Photo: David Attie. 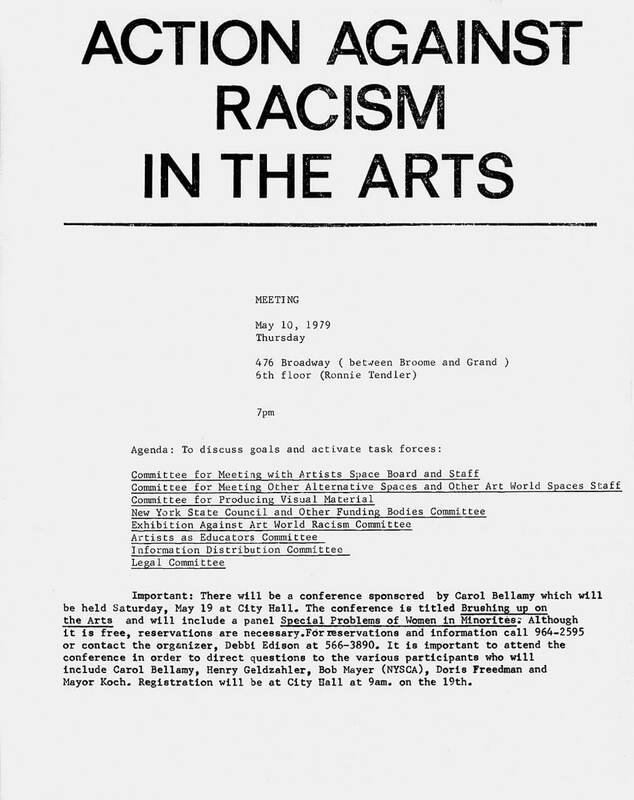 Agenda for Action Against Racism in the Arts, 1979. Press release for Artists Space, 1979. 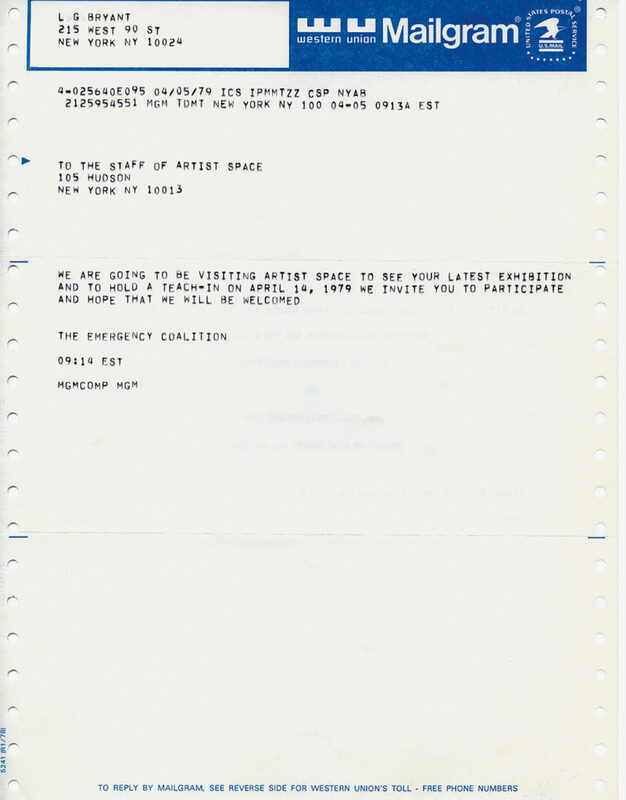 Letter from the Black Artists Emergency Coalition to Artists Space, 1979. 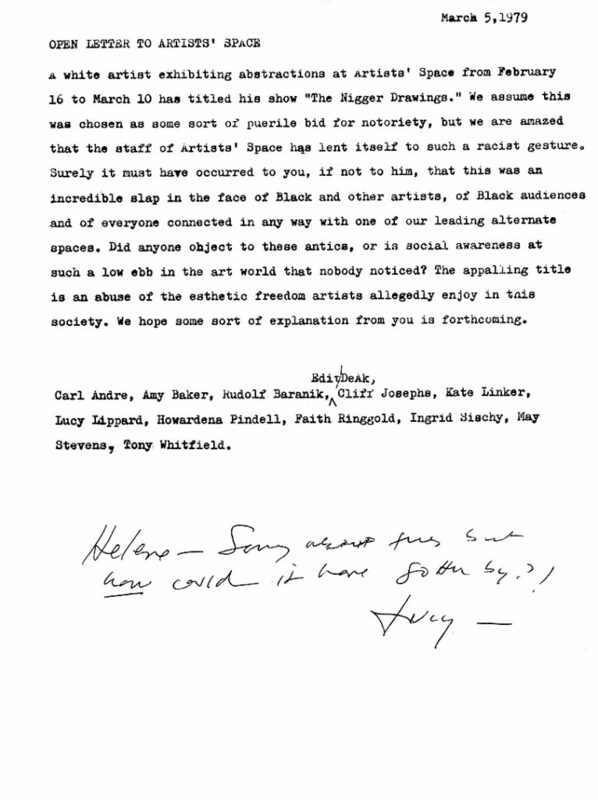 Open letter to Artists Space, signed by Carl Andre, Amy Baker, Rudolf Baranik, Edit DeAk, Cliff Josephs, Kate Linker, Lucy Lippard, Howardena Pindell, Faith Ringgold, Ingrid Sischy, May Stevens, and Tony Whitfield, March 5, 1979. Black Emergency Cultural Coalition flyer, 1979. 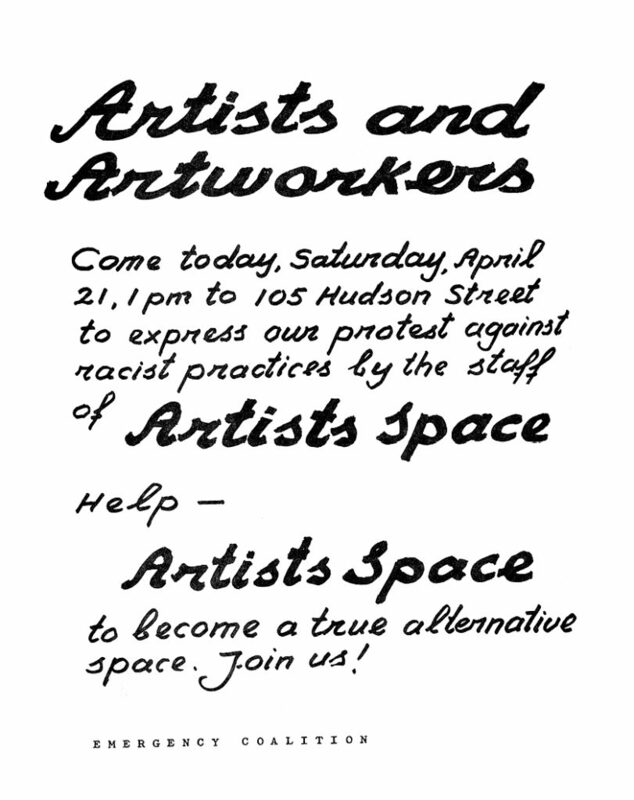 Black Artists Emergency Coalition demonstration at Artists Space, New York, April 14, 1979. Photo: Donna De Salvo, Collection of Photographer. 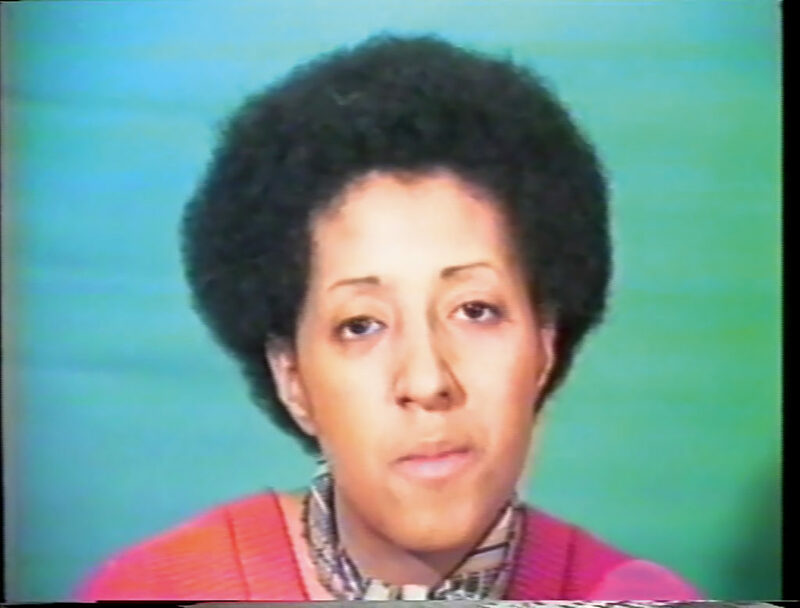 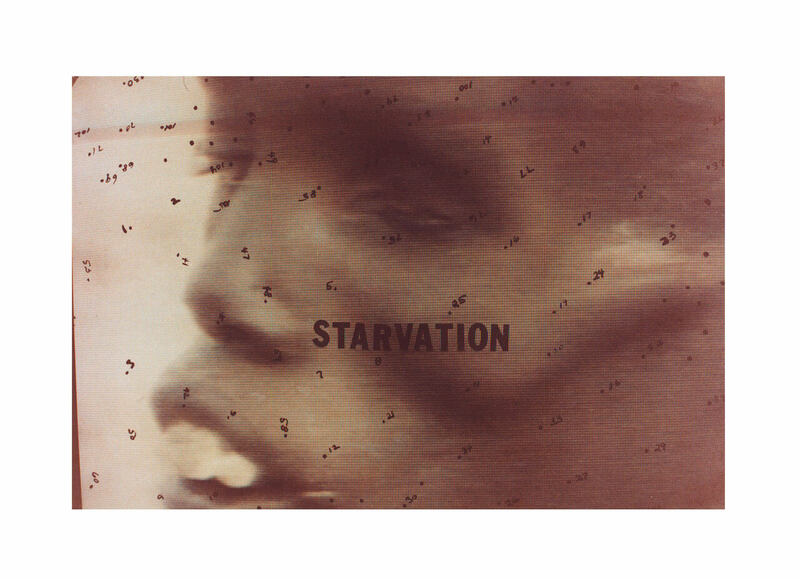 Timothy Greenfield-Sanders, Howardena Pindell from the series Art World, 1980. 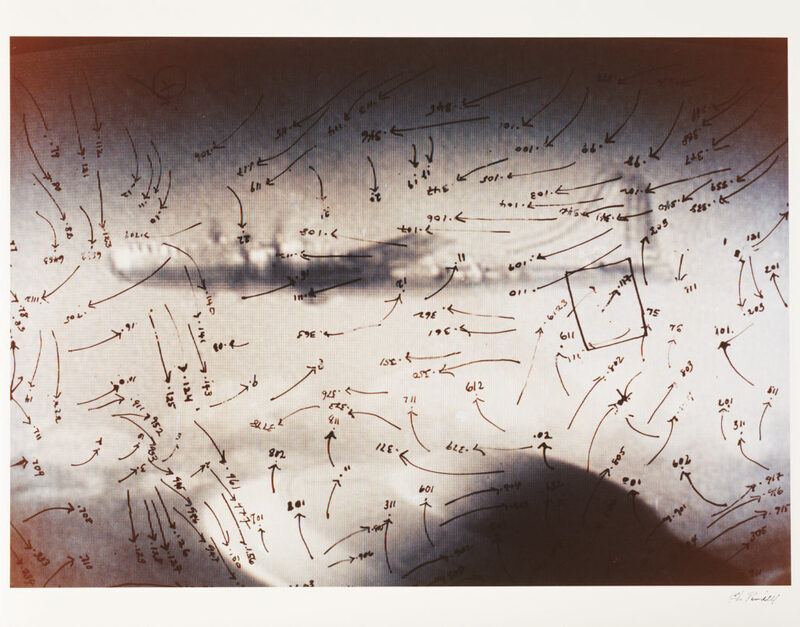 Gelatin silver print, edition 2 of 2; 12 ¾ x 10 3/8 in. 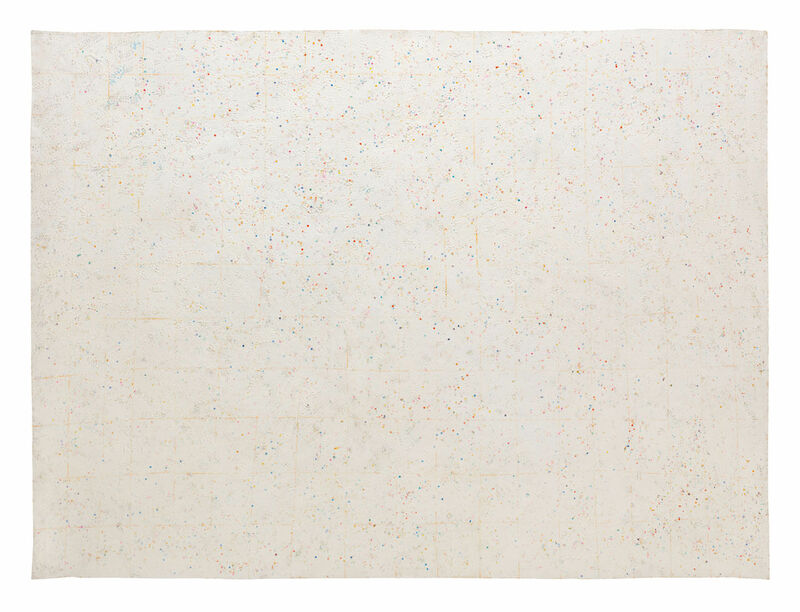 The Museum of Fine Arts, Houston, gift of Mr. and Mrs. Neil E. Kelley, 2006.867. 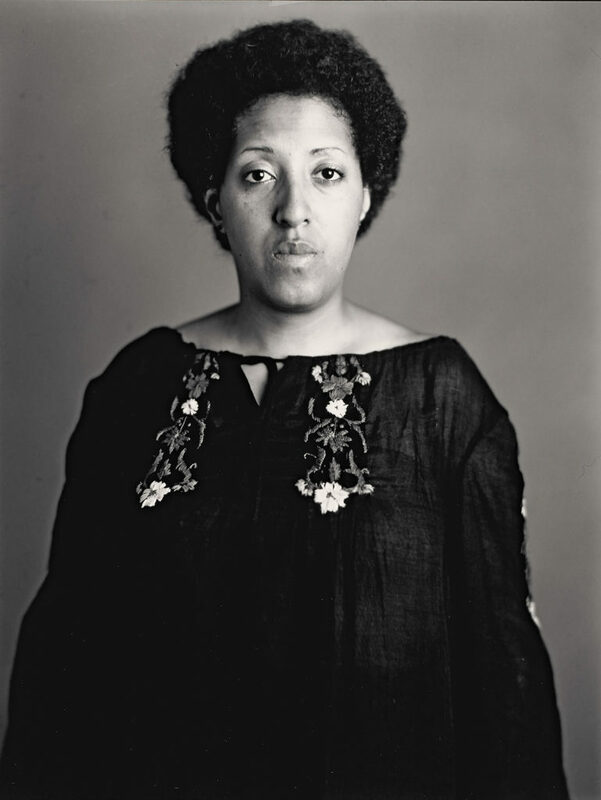 © Timothy Greenfield-Sanders, All Rights Reserved. 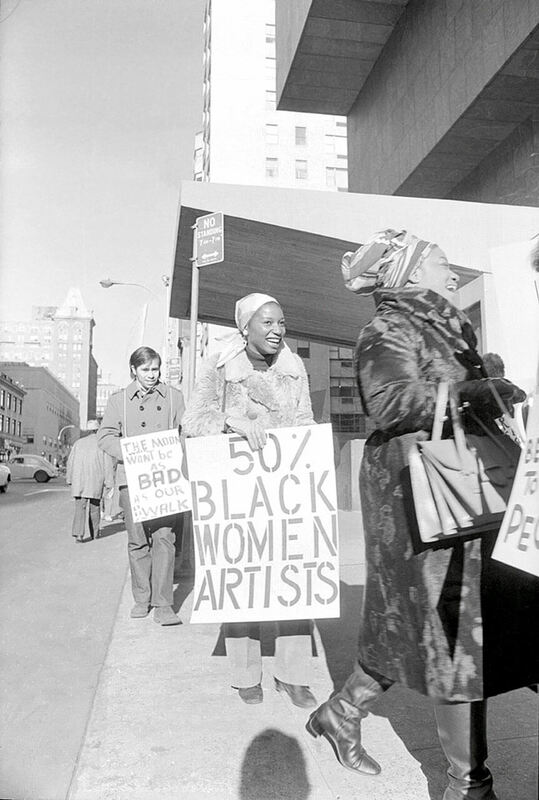 Courtesy of Hiram Butler Gallery. 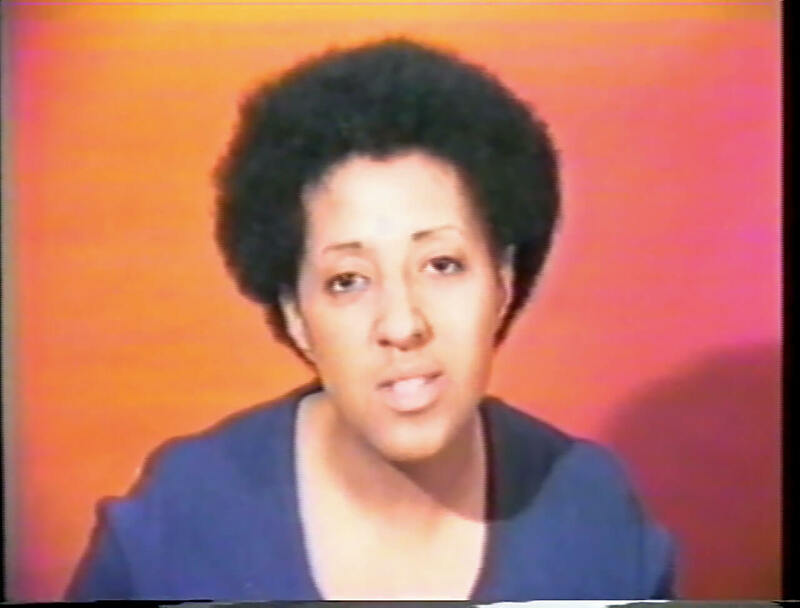 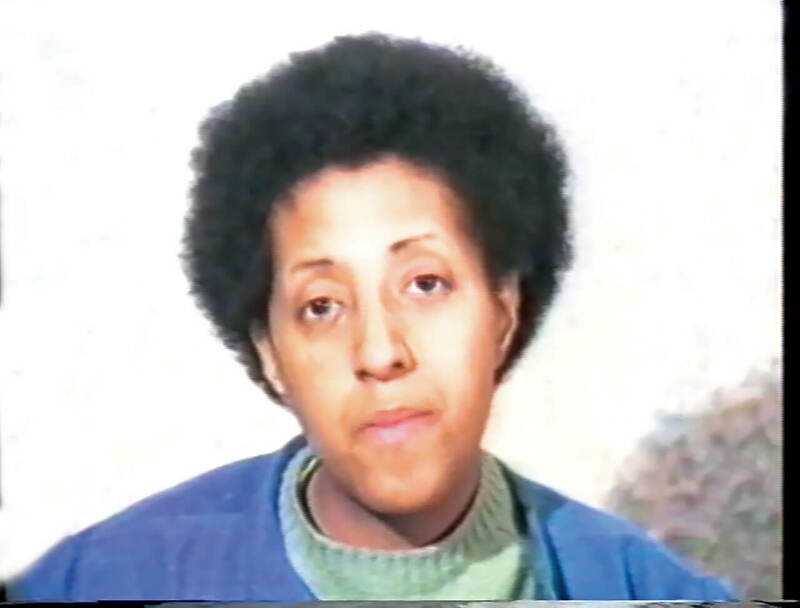 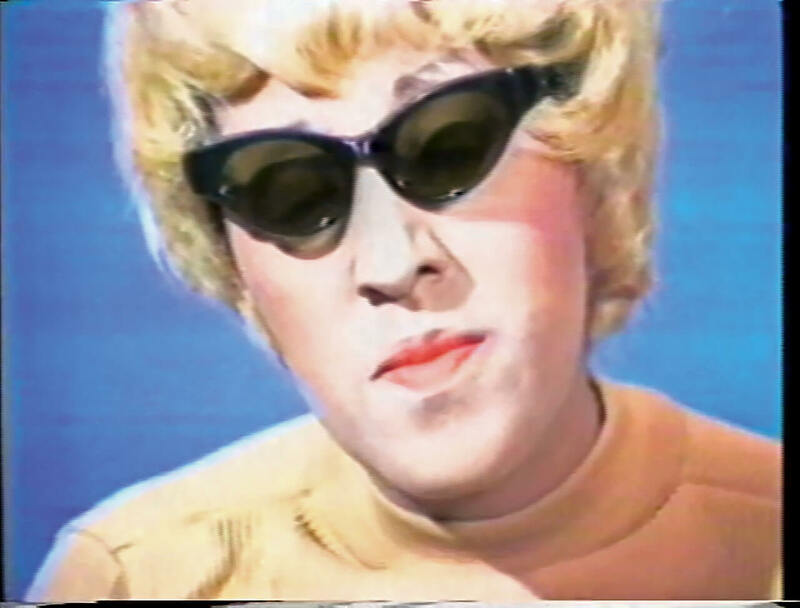 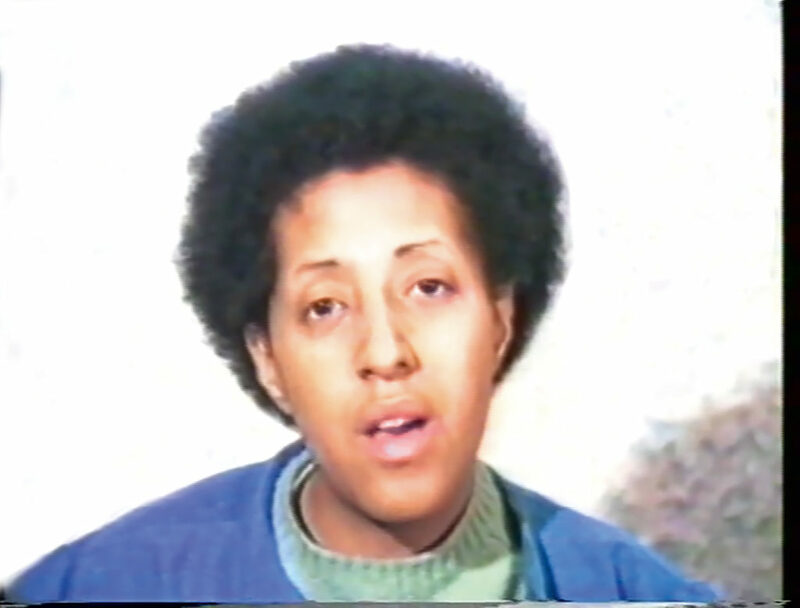 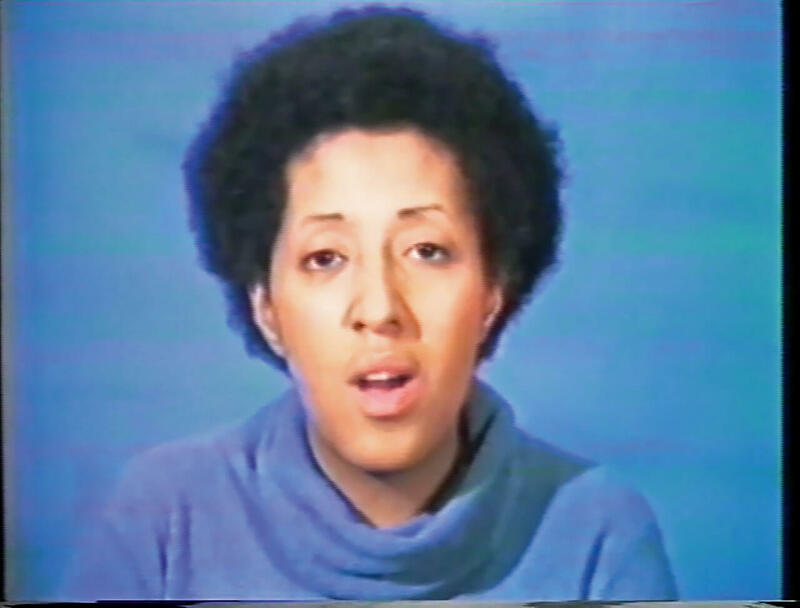 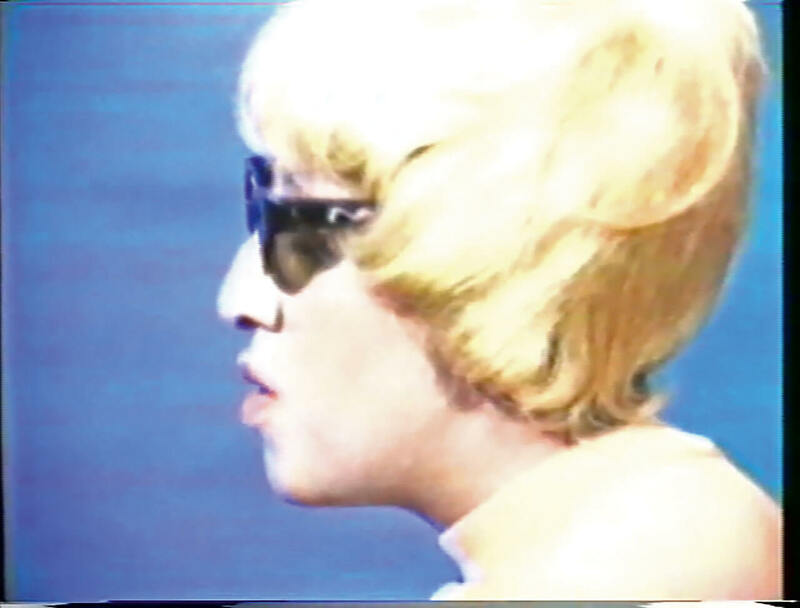 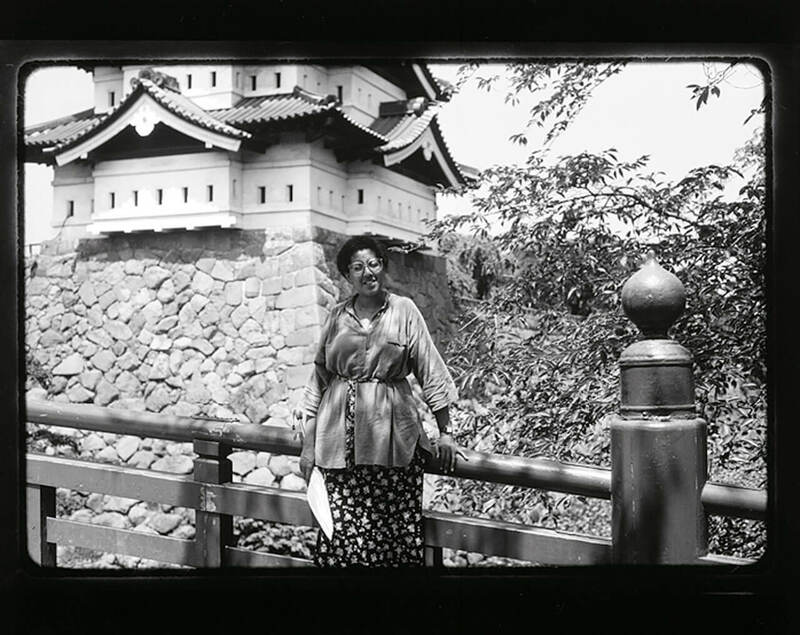 Howardena Pindell in Kamakura, Japan, 1981. 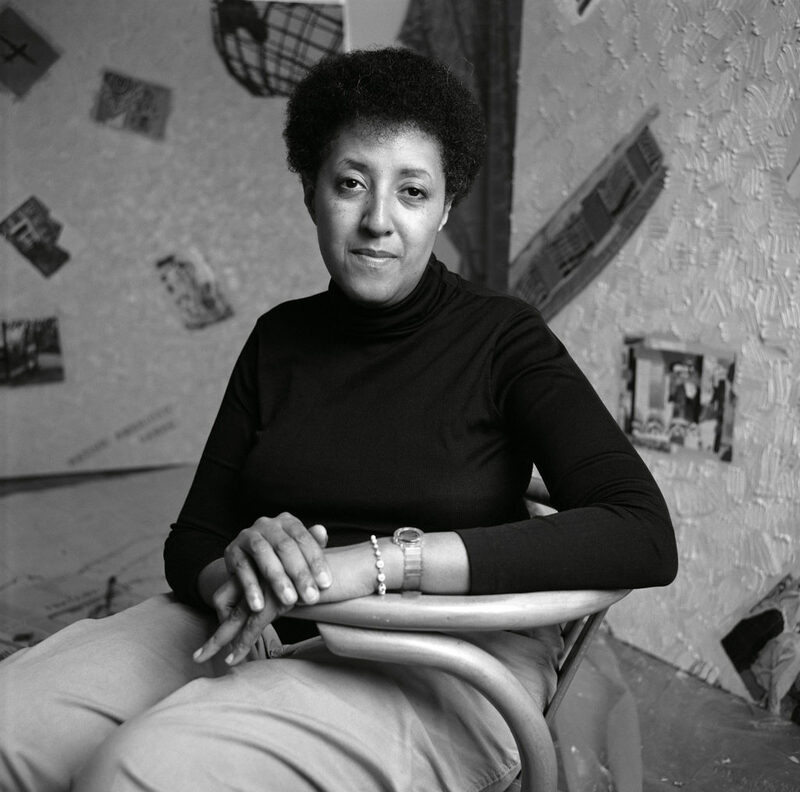 Dawoud Bey, Howardena Pindell, c. 1985. Copyright © 2017 Dawoud Bey. 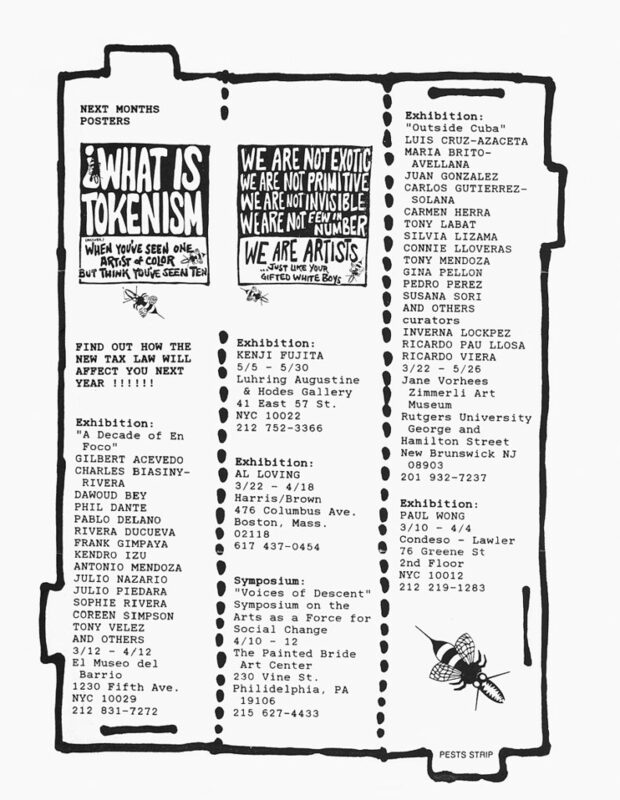 PESTS, Newsletter 1, no. 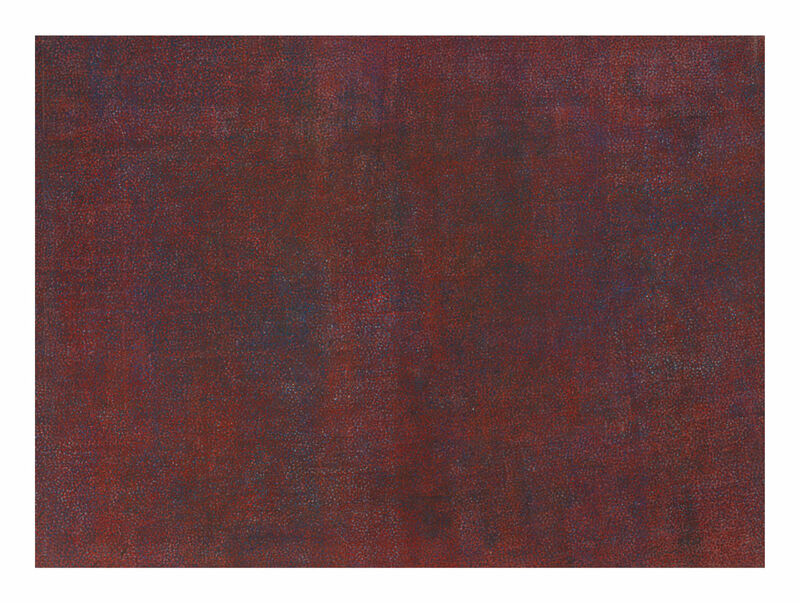 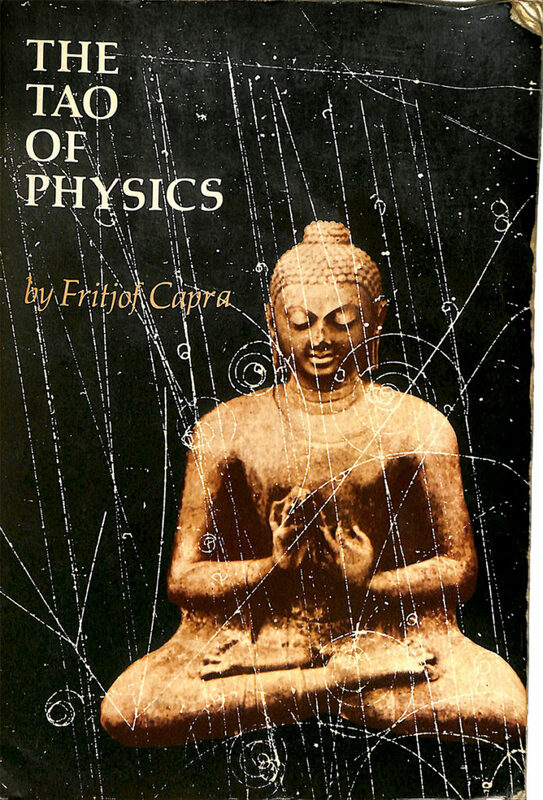 2 (1987). 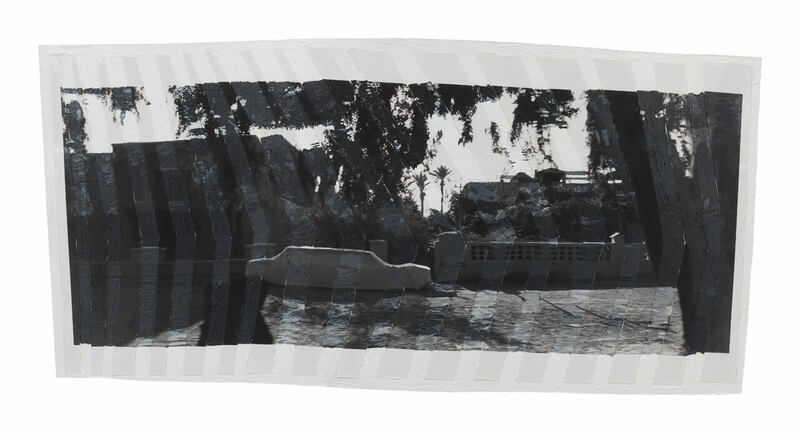 Getty Research Institute, Los Angeles (2008.M.14). 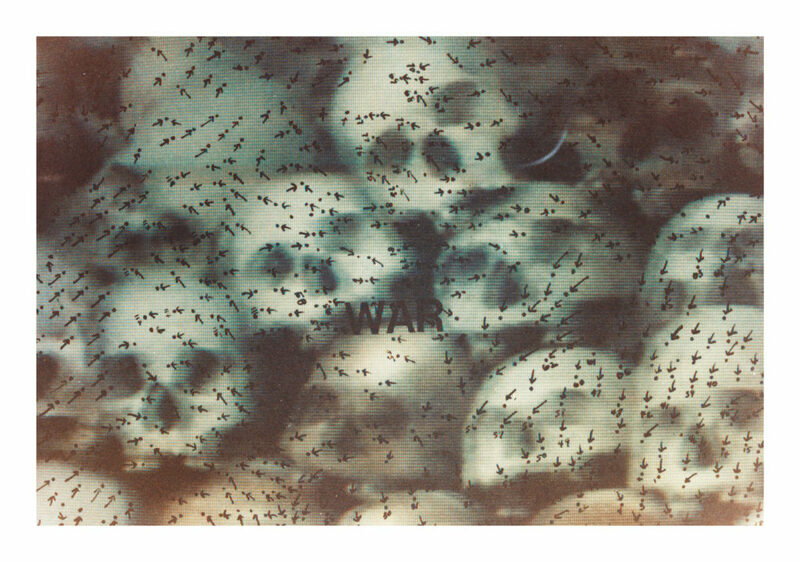 © PESTS.